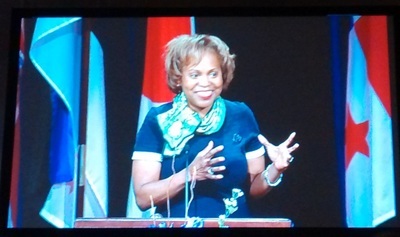 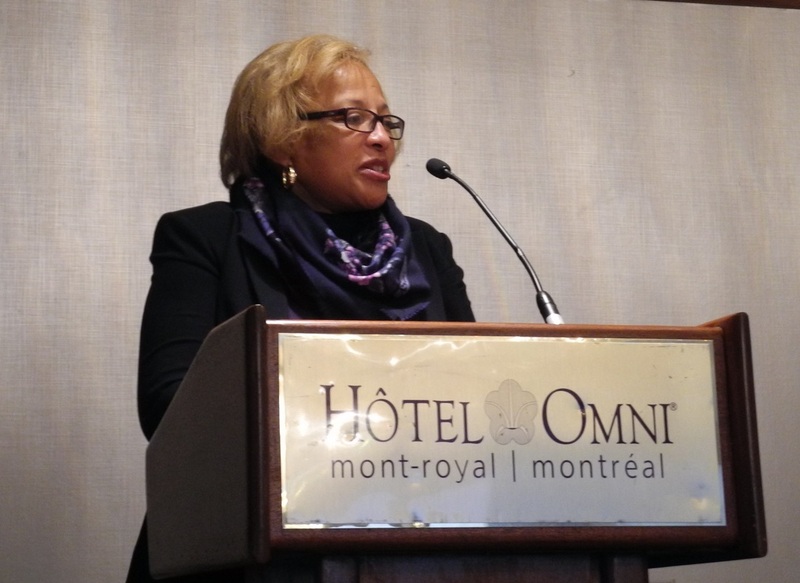 Beverly Townsend, Gamma President 2015-2017, reports on Quebec activities over the last year. 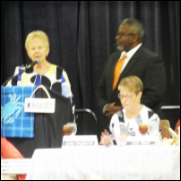 and shares her vision for her biennium. 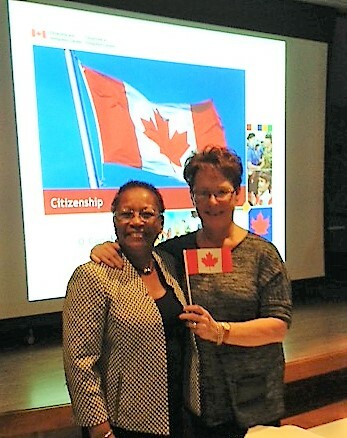 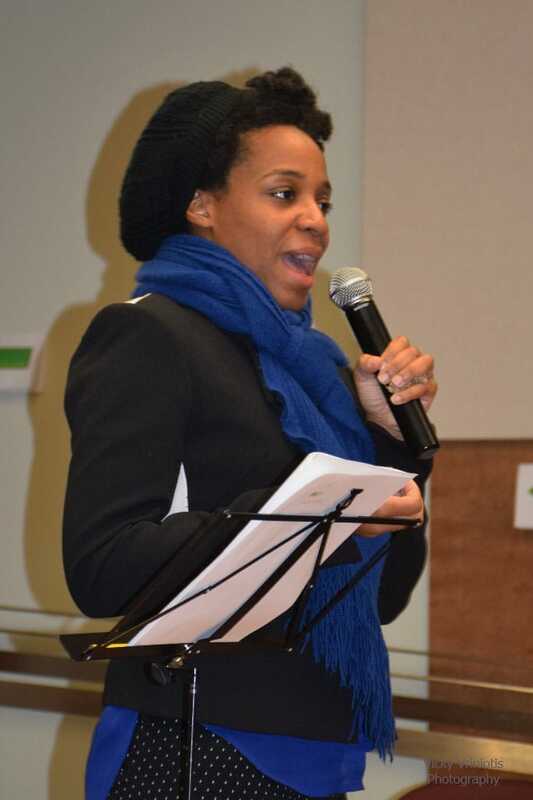 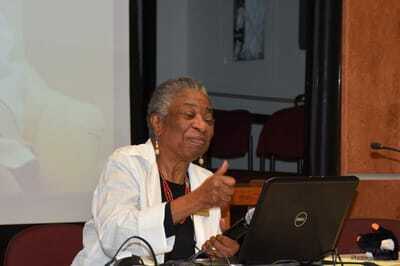 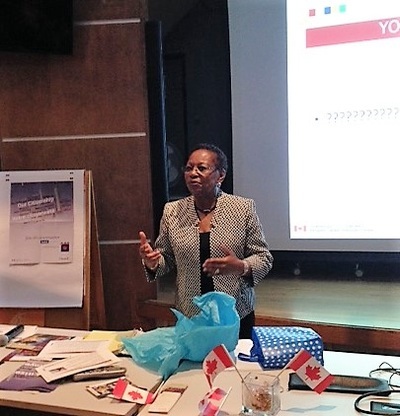 Dr. Donna-Faye Madhosingh, Area Representative for Canada 2014-2016, hosts the Canadian Forum. 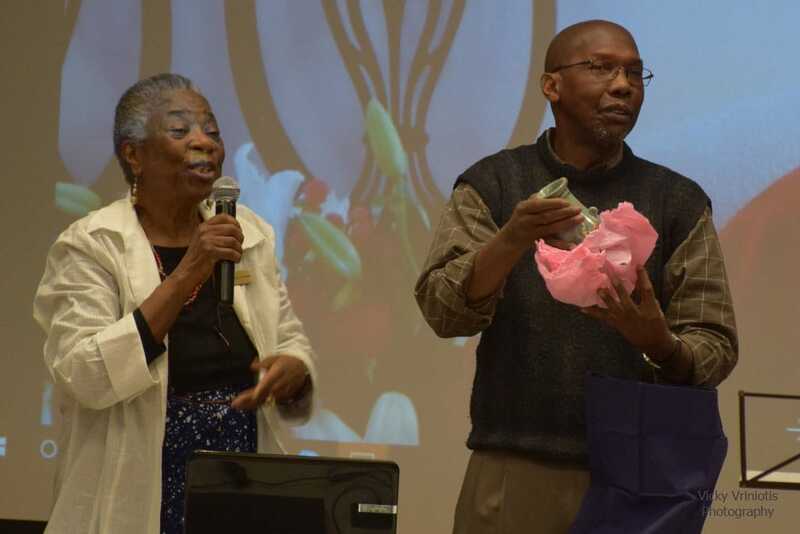 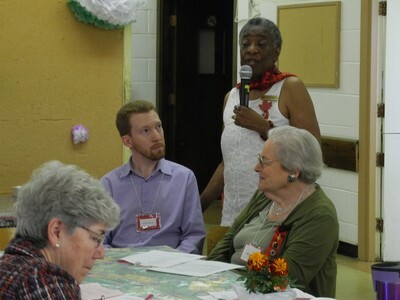 Local Baltimore Broadcaster gets noted for his coverage of DKG activities in the area. 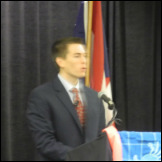 Keynote speaker Sean McComb addresses the assembly. 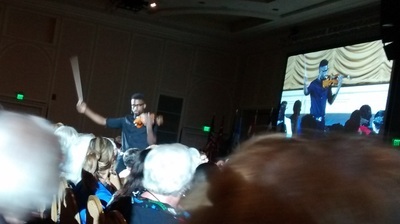 He was the 2014 National Teacher of the Year. 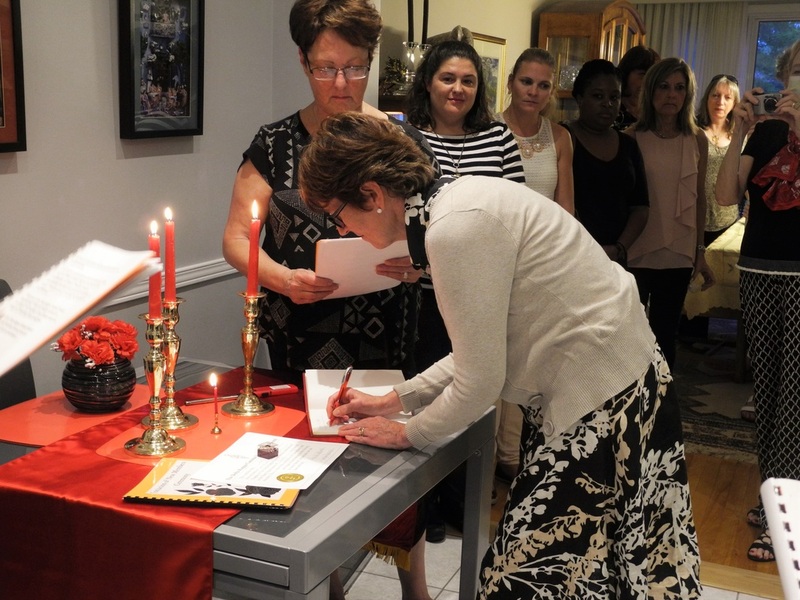 Pictures below are from the initiation ceremony and Bev Townsend's first official Gamma Province Meeting. 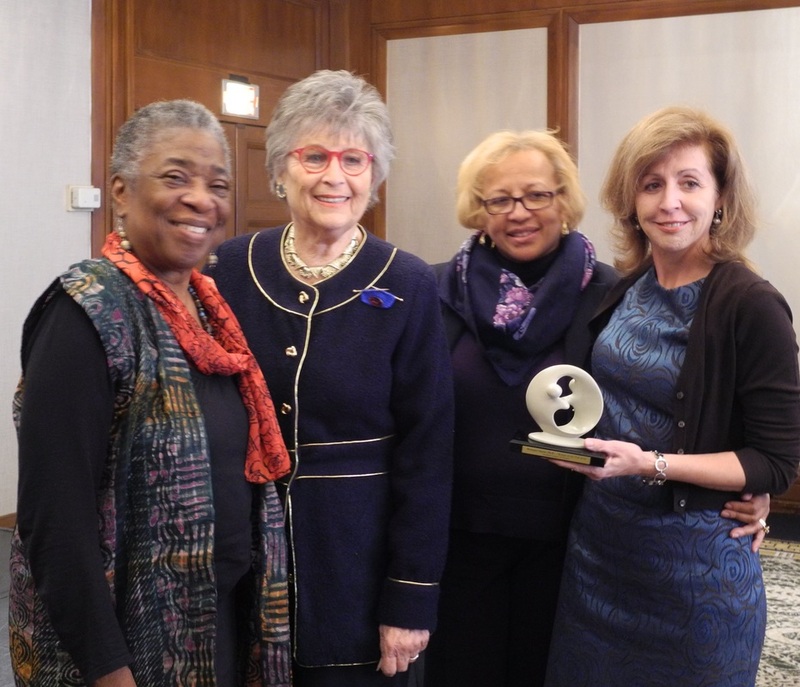 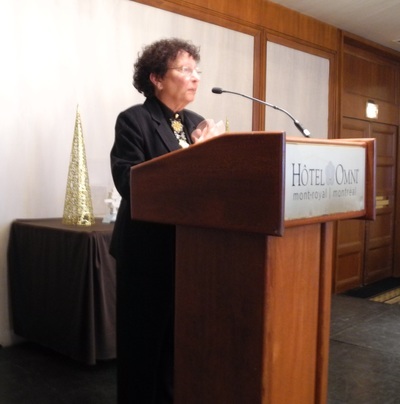 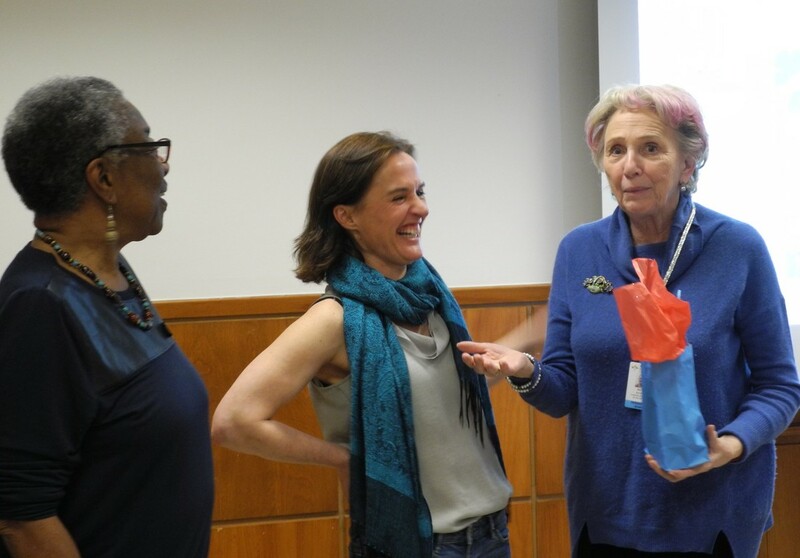 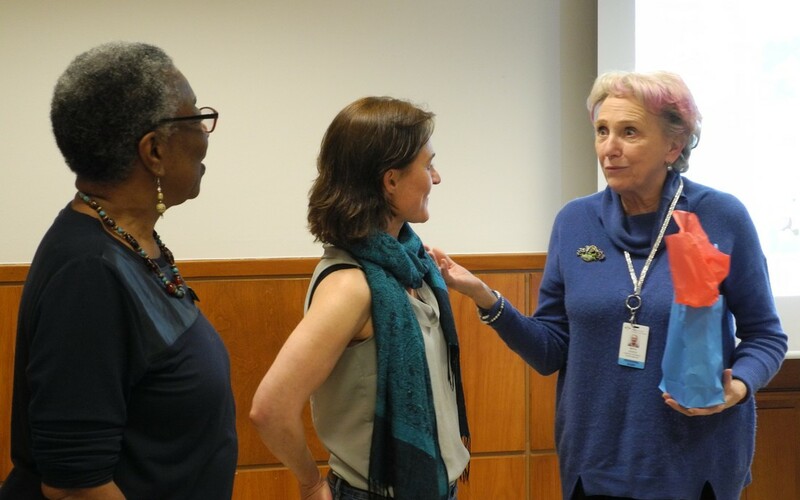 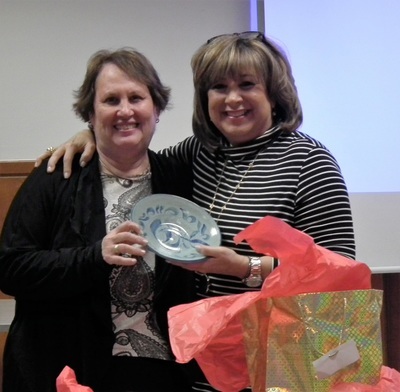 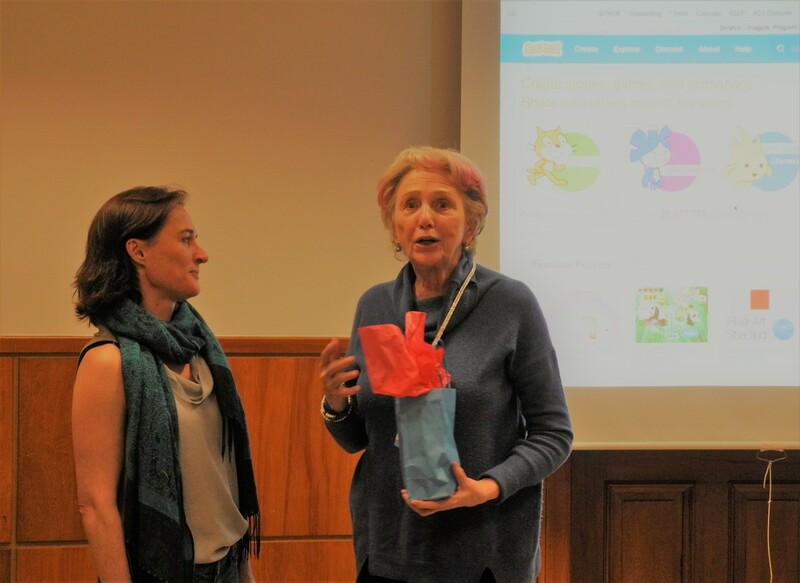 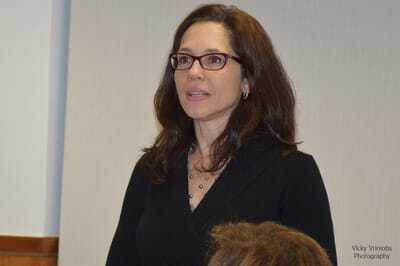 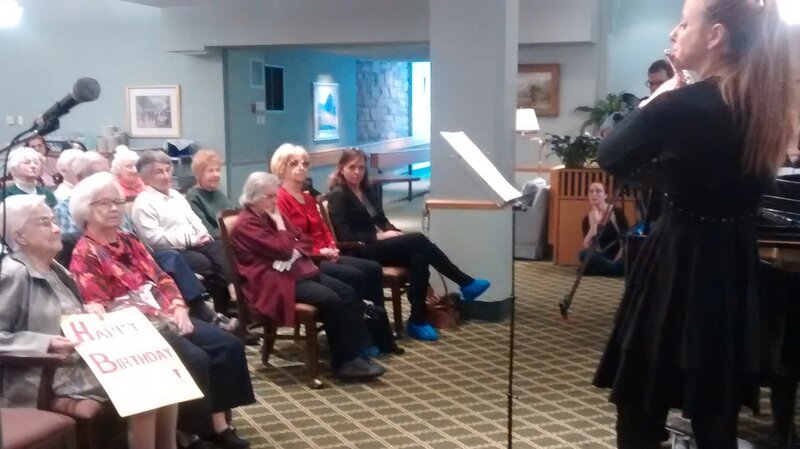 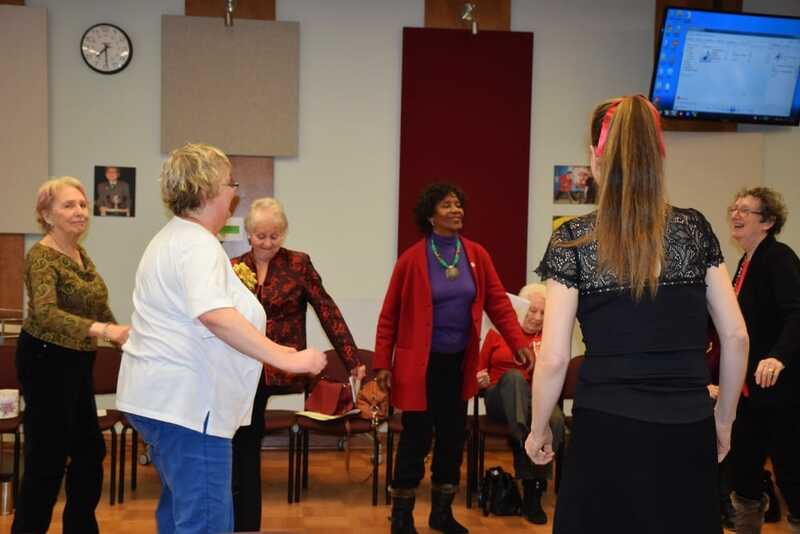 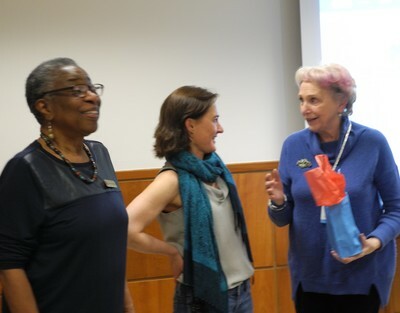 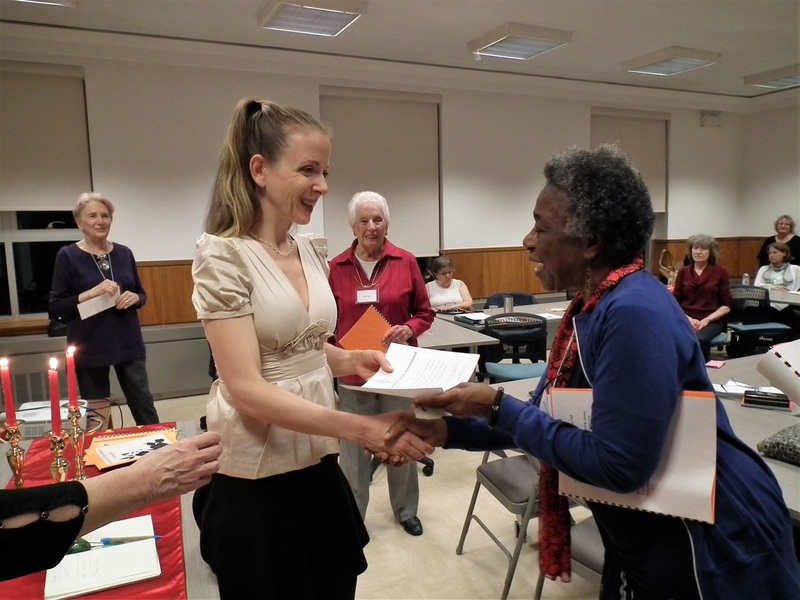 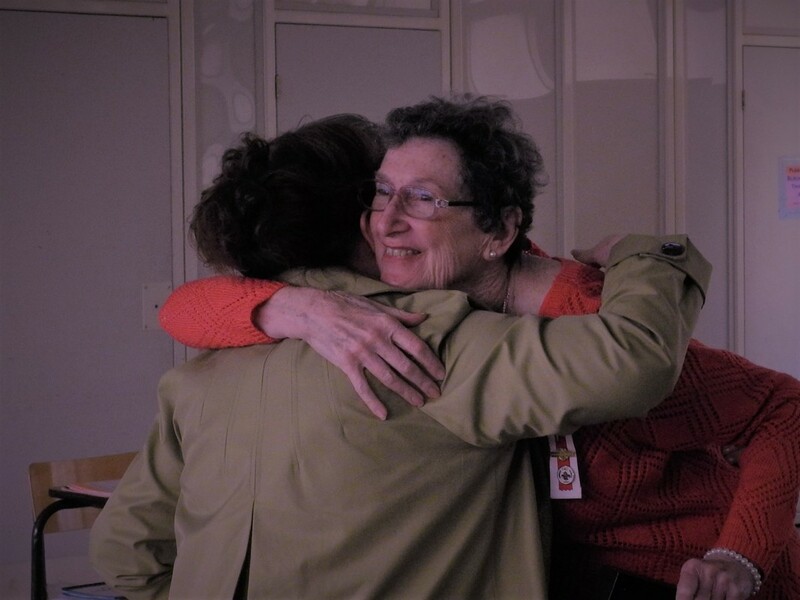 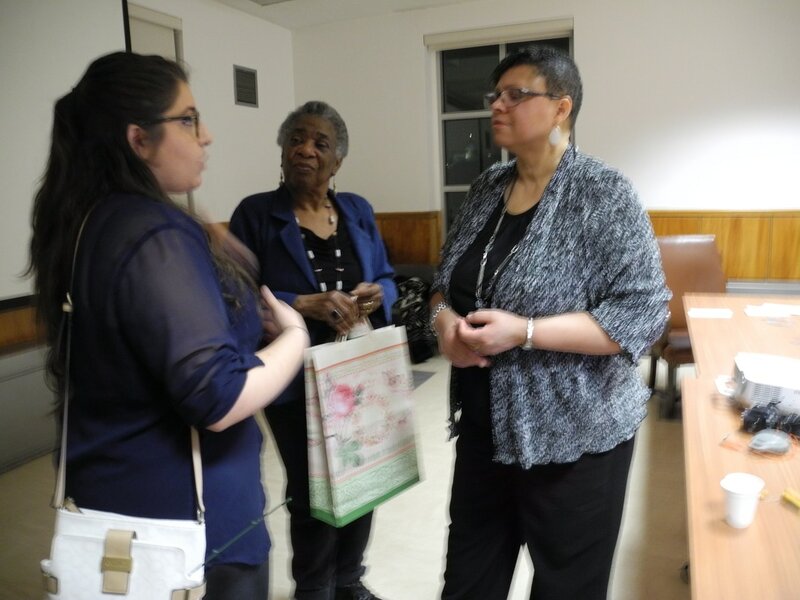 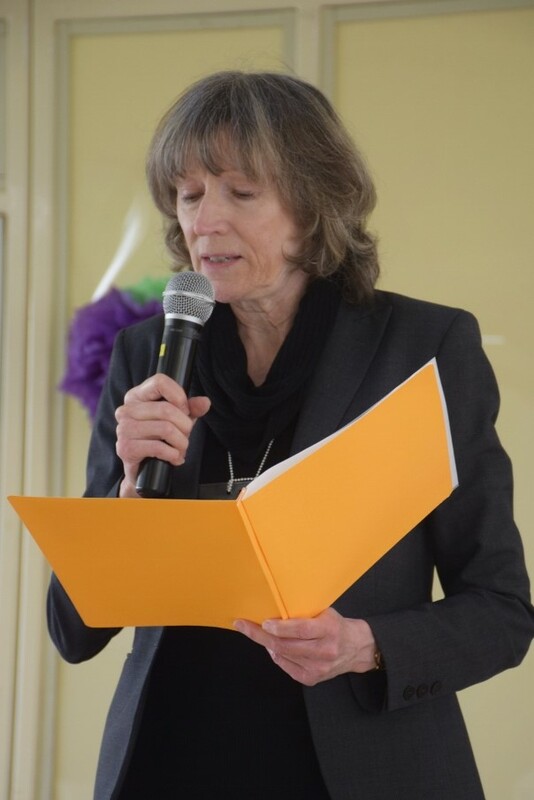 Susan Pinker, Developmental Psychologist and author of "The Village Effect" spoke to Gamma members on the importance of Face to Face contact and how it leads to a happier life. 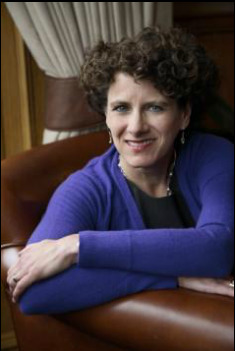 SUSAN PINKER is a developmental psychologist, journalist and author whose first book, The Sexual Paradox, won the American Psychological Association’s most prestigious literary prize, the William James Book Award, and was published in 17 countries. 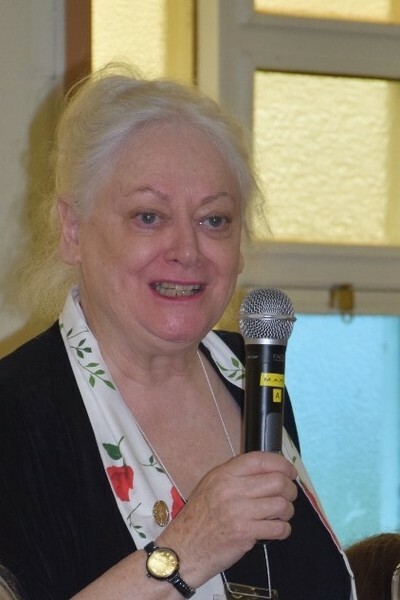 A national columnist, lecturer and broadcaster whose work has garnered many writing awards, Pinker’s ideas have been featured in the New York Times, the Times, the Guardian, the Economist, the Atlantic, Financial Times, Der Spiegel, and O, The Oprah Magazine, among other publications. She lives in Montreal. 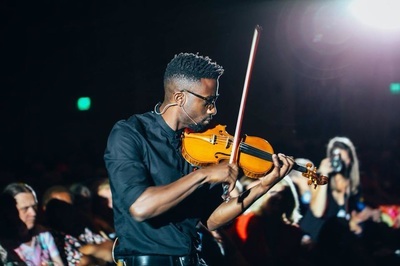 Thomas Henderson of Giant Steps is an educational professional committed to diversity and the inclusion and success of all learners, including individuals with disabilities, in all sectors of society. He has over twenty-five years of experience teaching, training and administrating programs directed at young, teen and adult students with and without disabilities, with a particular focus on working with people with an autism spectrum diagnosis. 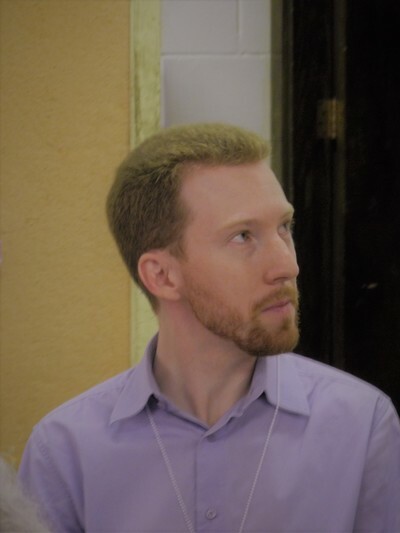 He is an experienced director of research and community outreach programs supporting and representing the needs of individuals with developmental differences, difficulties or disabilities. 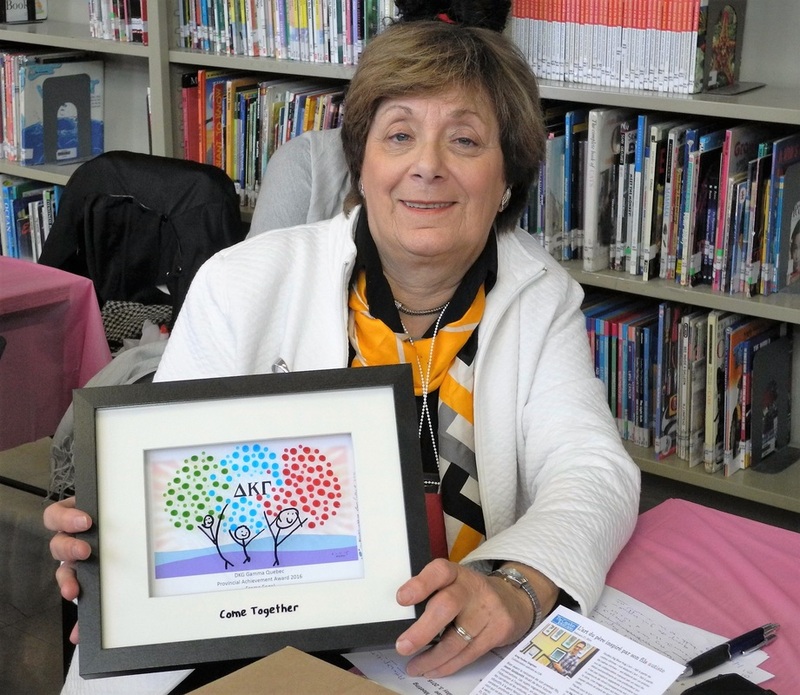 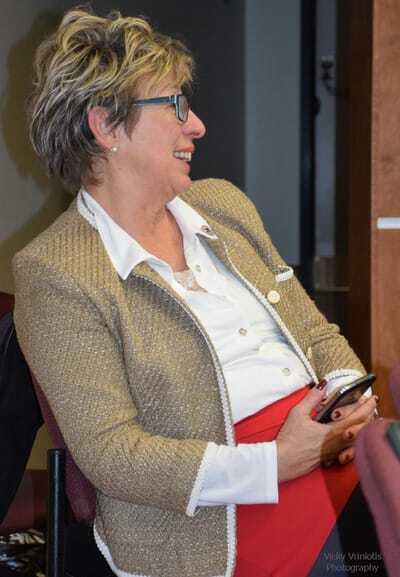 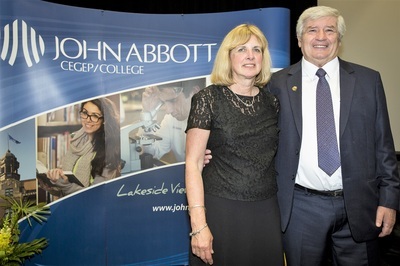 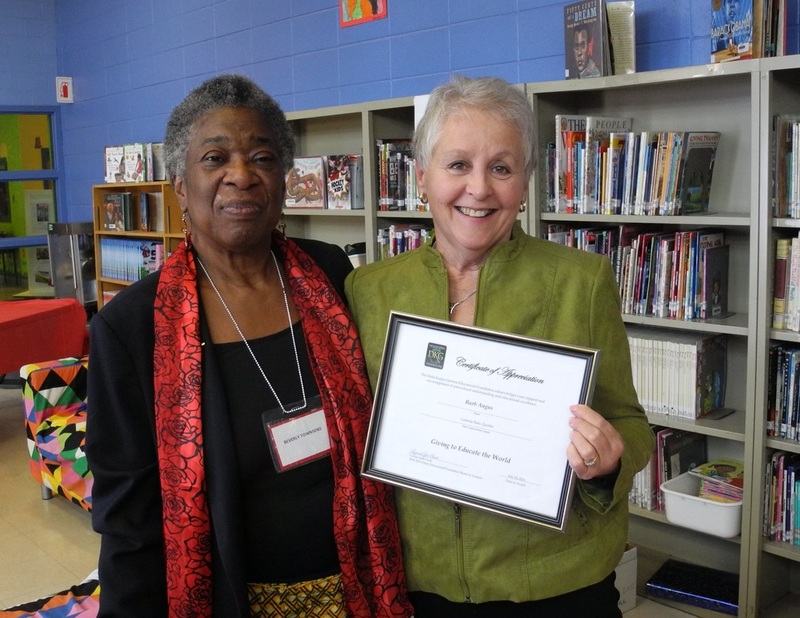 Ardis Root of LBPSB has spent 23 years as a teacher, and eight years as an administrator. 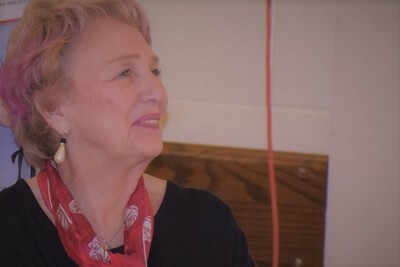 Of those thirty-one years, she spent six years as a high school teacher and twenty-five years in vocational training, or adult education. 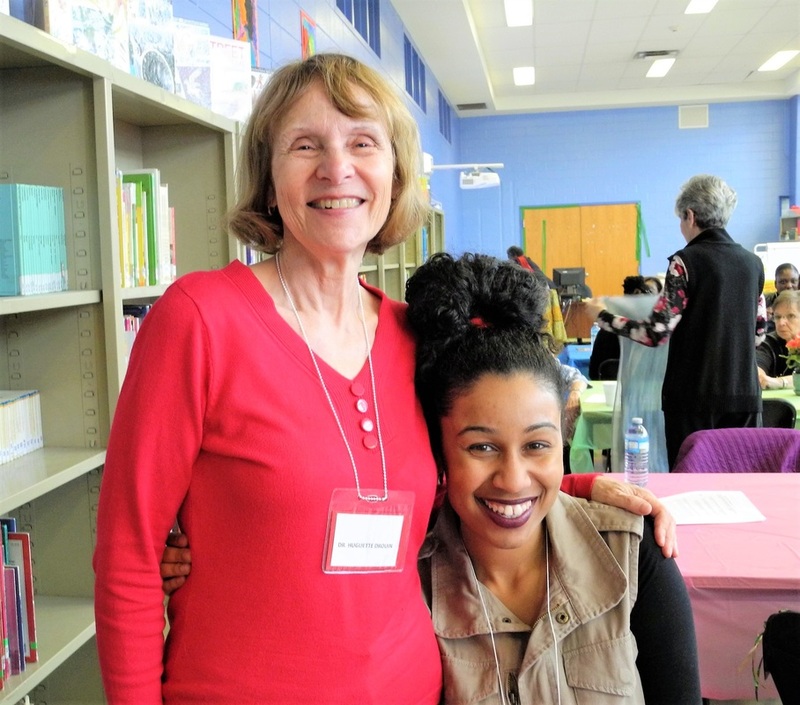 Her passion in education is to help people find work that they love, either by getting specific training, or building the academic skills they need to succeed. 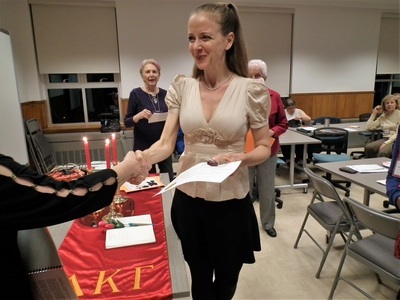 Ardis Root has recently joined Gamma Quebec as our latest initiate. 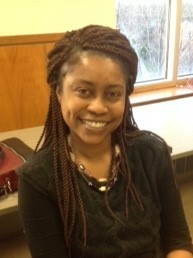 Welcome, Ardis! 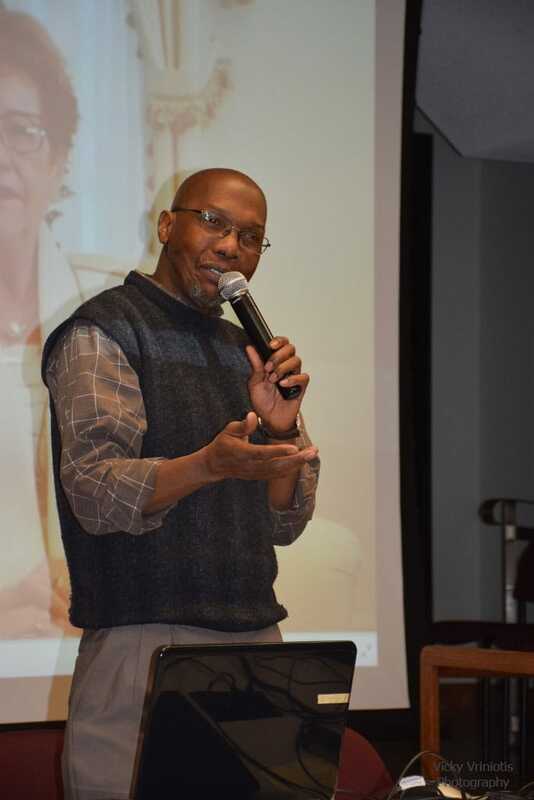 Otis Delaney he spent seven years as a Teacher, four years as a Vice Principal, nine years as a Principal and two years as a Pedagogical Consultant. 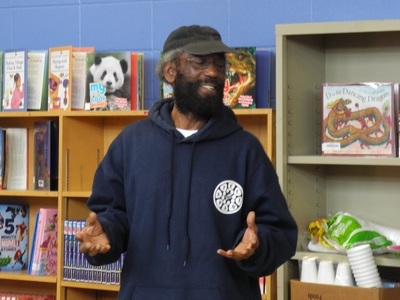 He has taught high school in British Columbia and at Centennial Regional High on the South Shore. 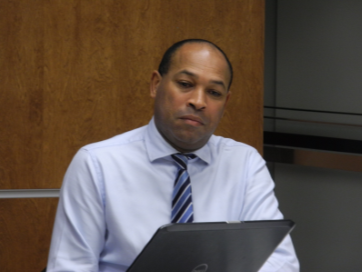 As an administrator, he has been a Vice Principal at St. Thomas High in Pointe Claire; a Principal at Lasalle Senior Elementary School (Larendeau Dunton); at Greendale Elementary School in Pierrefonds; and he has spent 2 years in (Kuwait) Canadian School Kuwait in the Middle East. 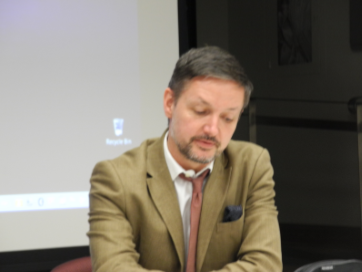 At the EMSB, he has been the (NANS Consultant), followed by being principal of the Lester B. Pearson High School. 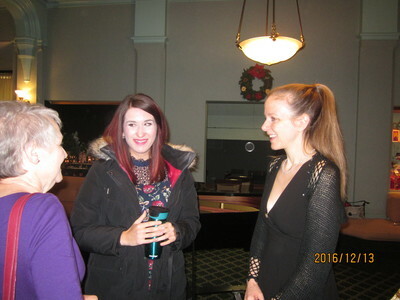 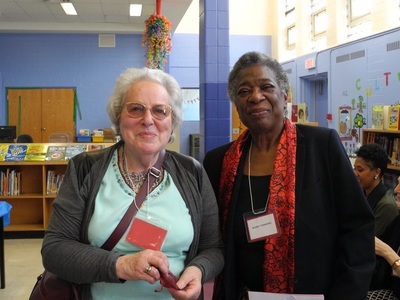 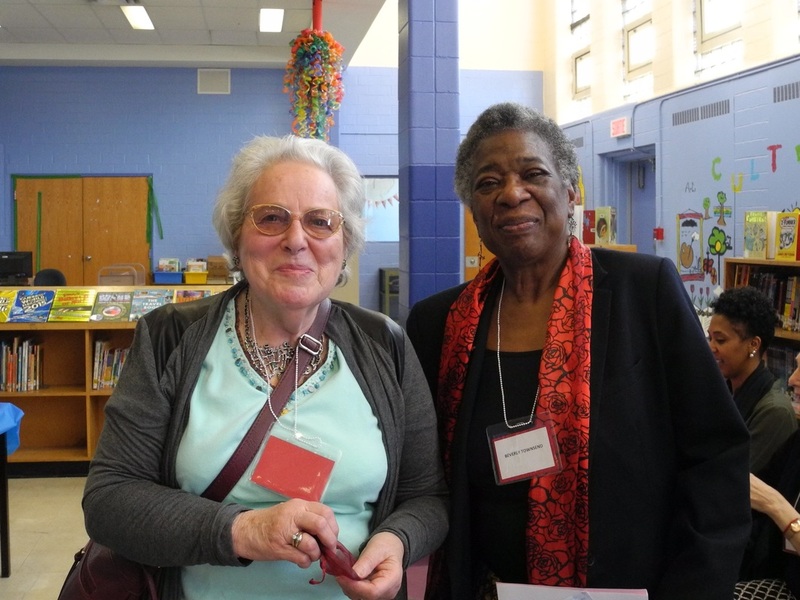 Early career educators, Emily Sioui (left) of LBPSB and Marie Alexiou of EMSB attended the evening. 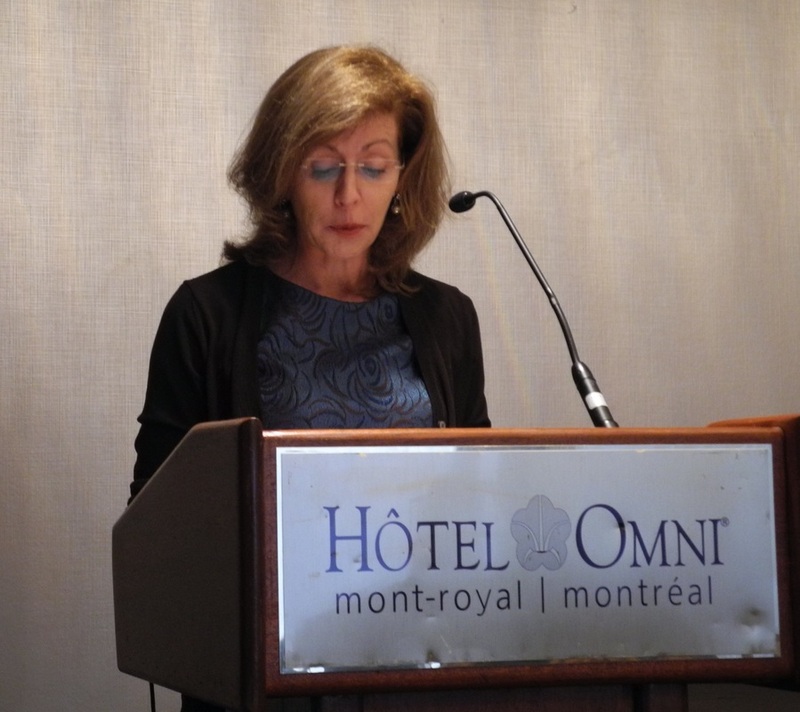 Huguette Drouin speaks about her new project at Université de Montreal to get young teachers more involved. 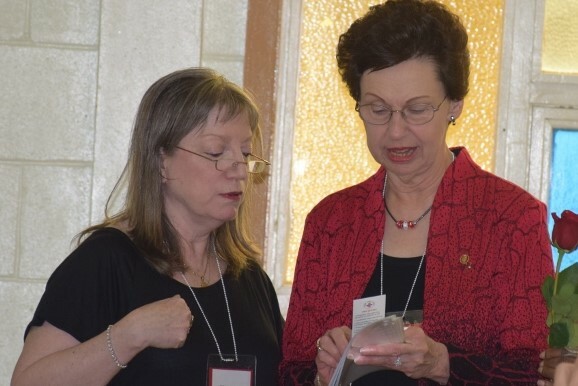 Dr. Drouin will submit an article on this topic to DKG International. 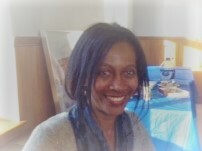 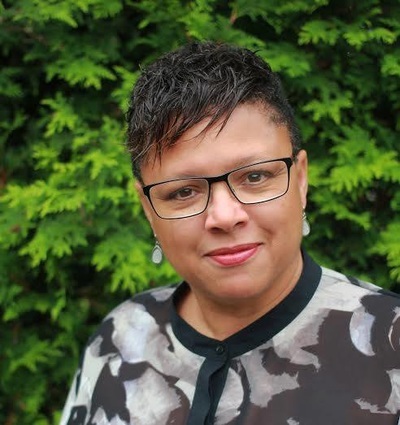 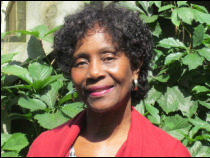 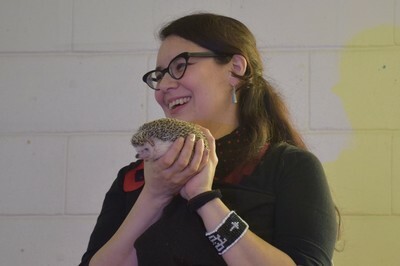 Jennifer Drummond (J.D. 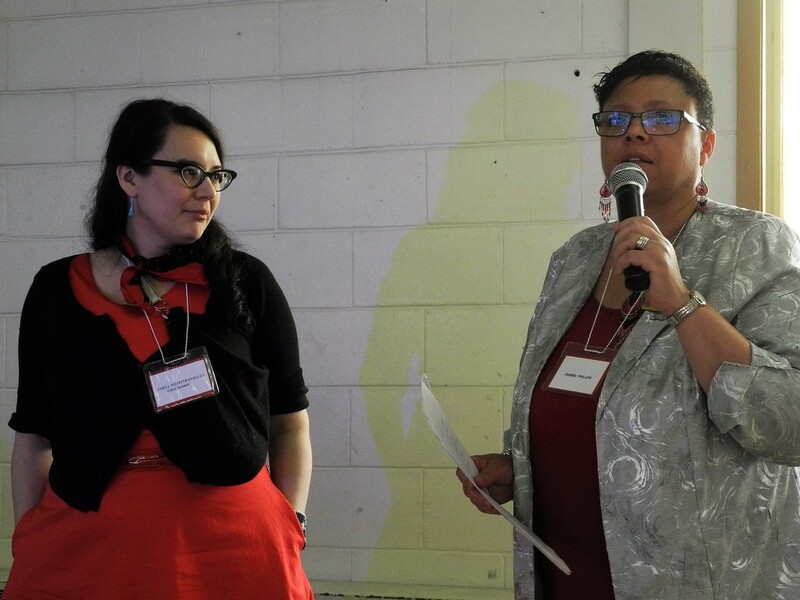 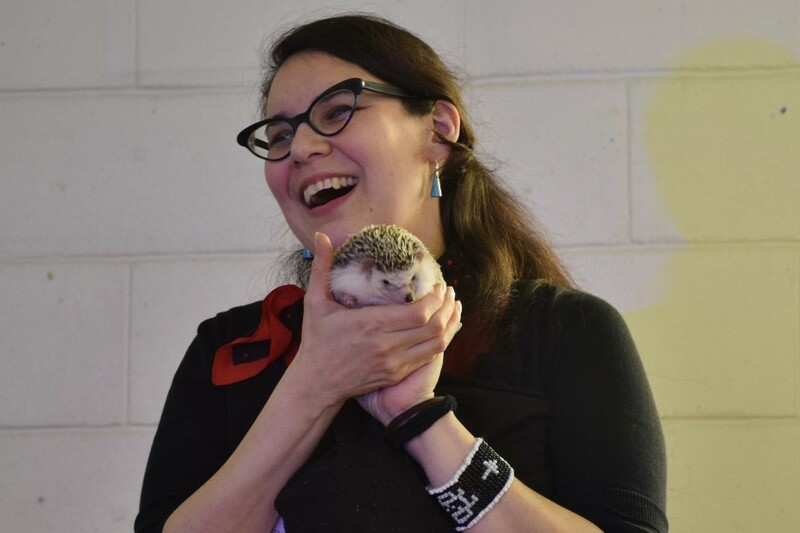 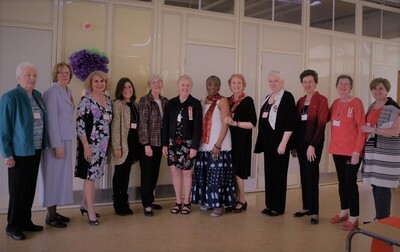 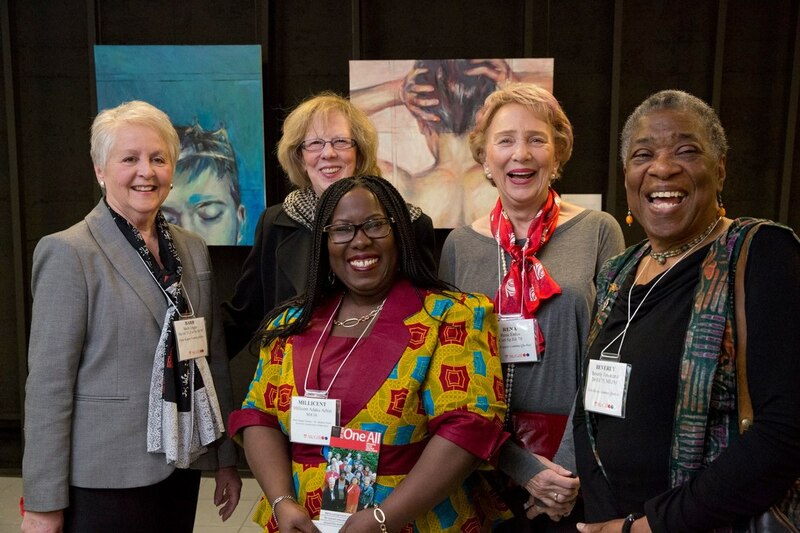 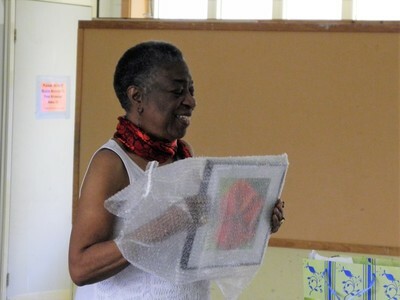 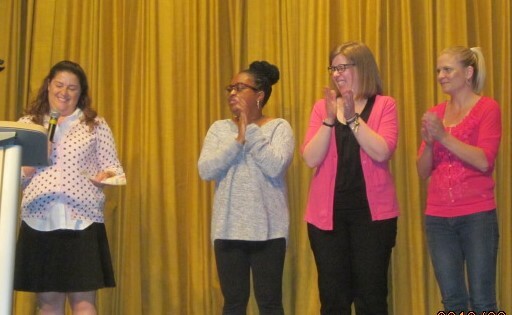 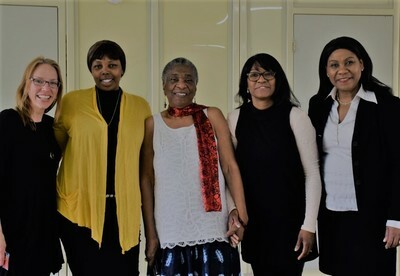 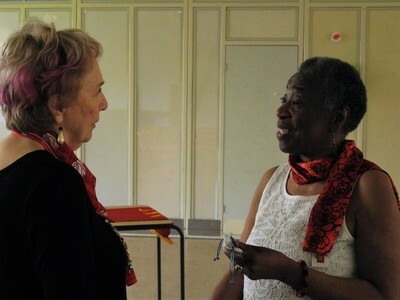 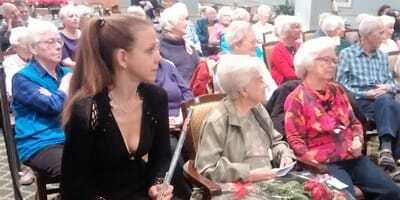 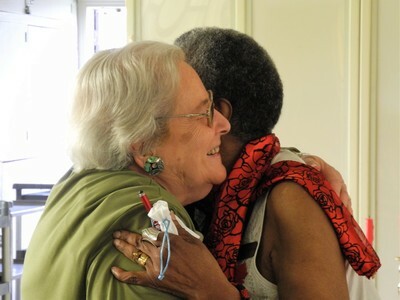 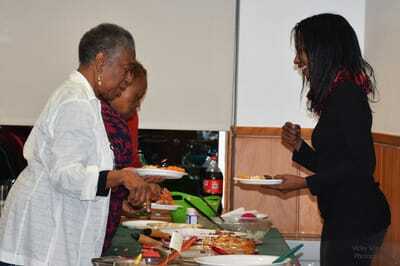 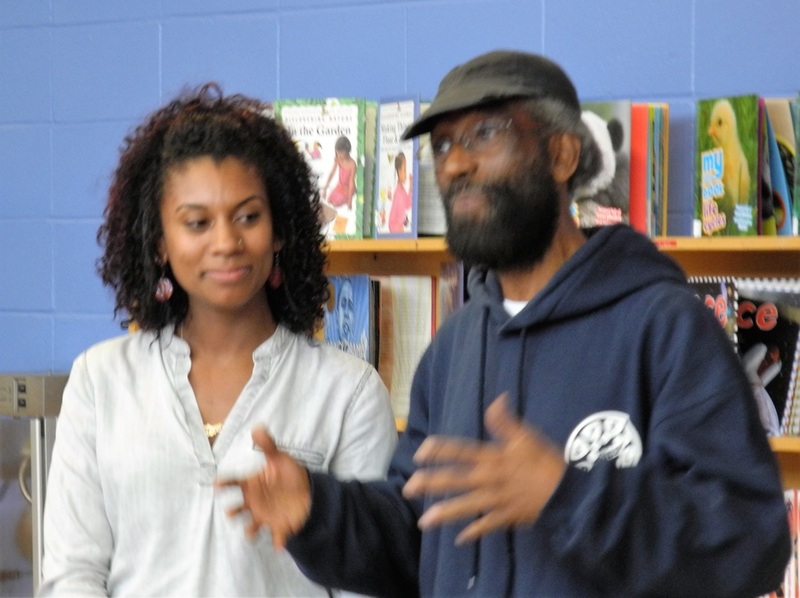 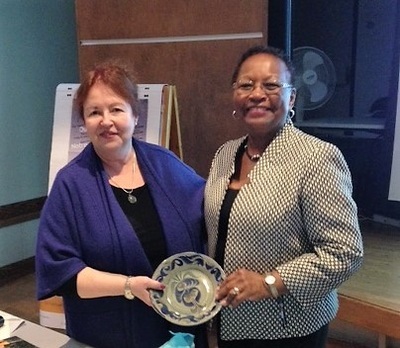 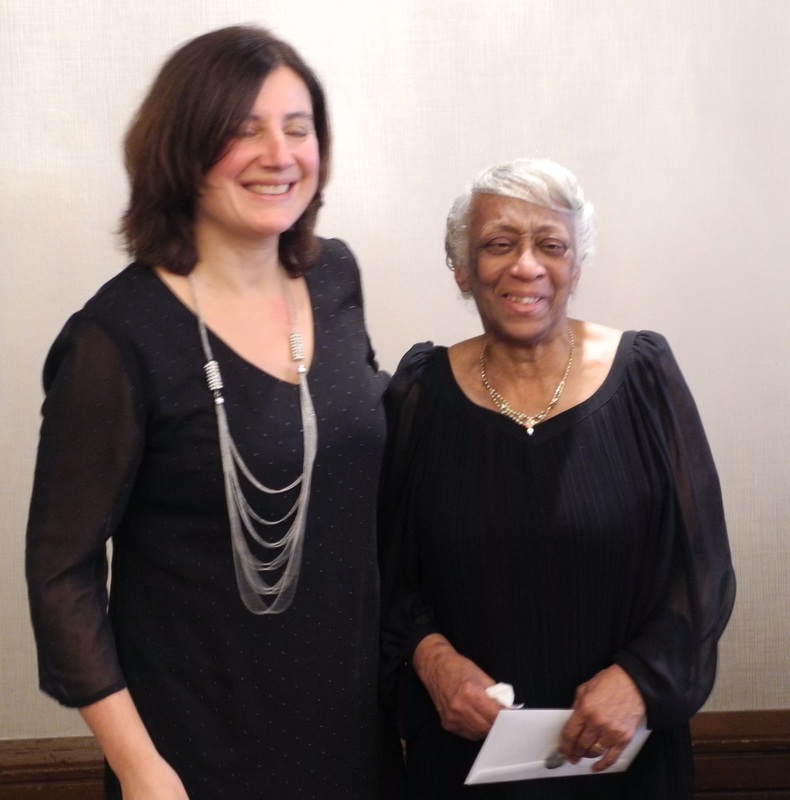 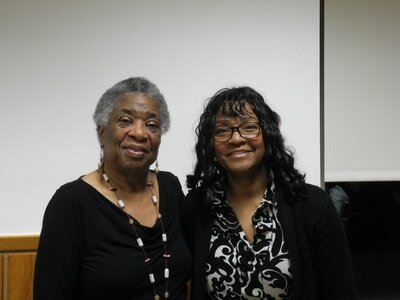 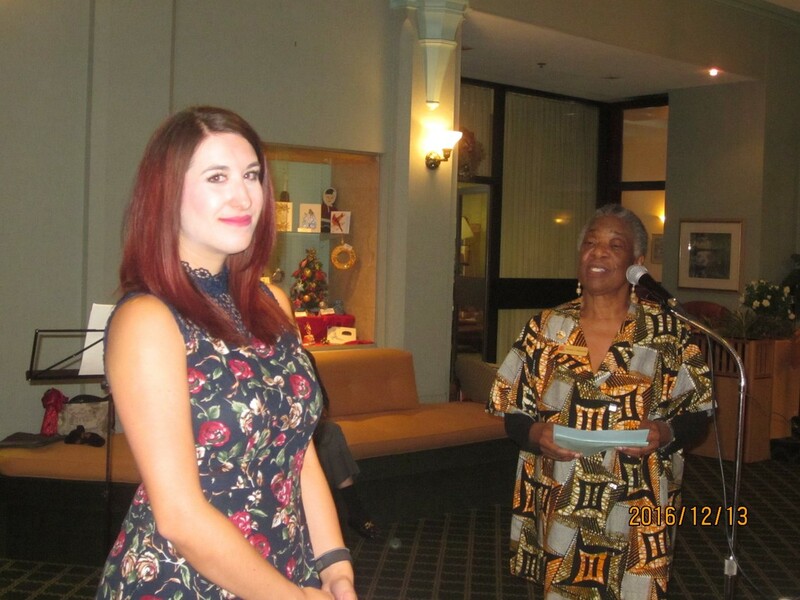 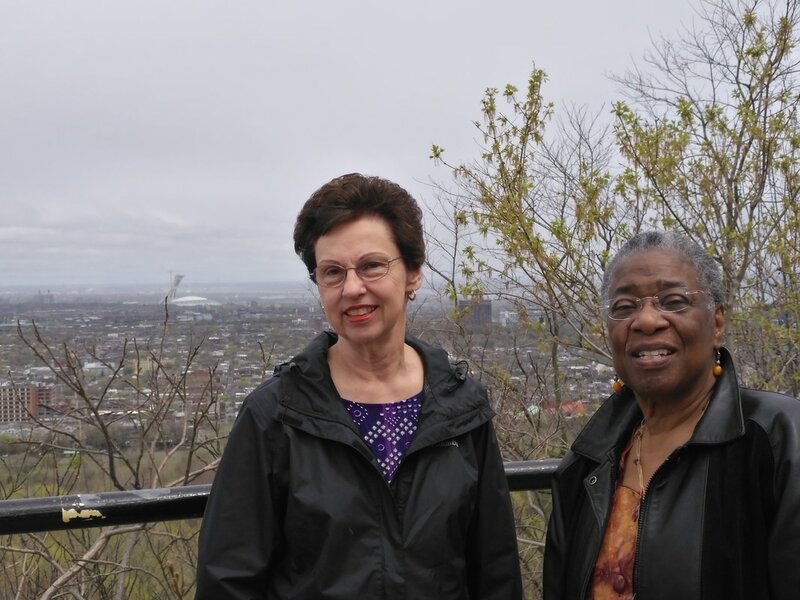 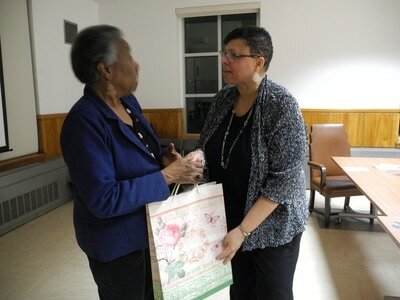 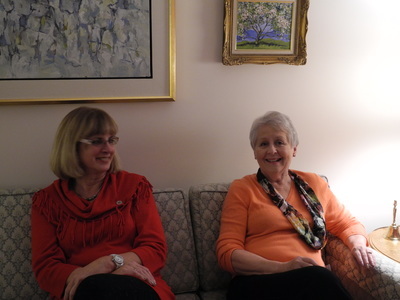 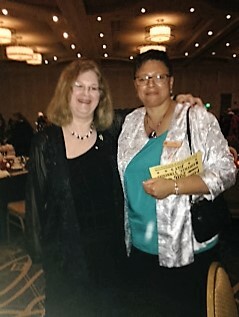 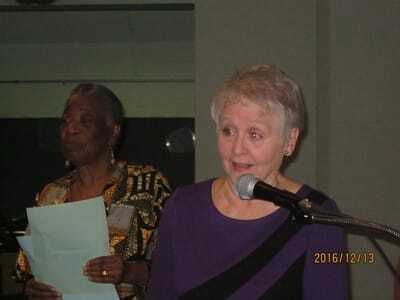 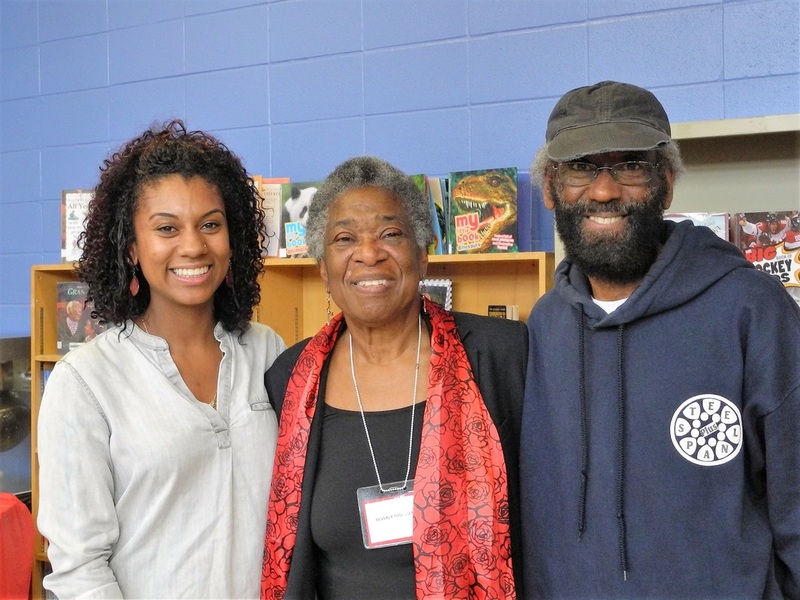 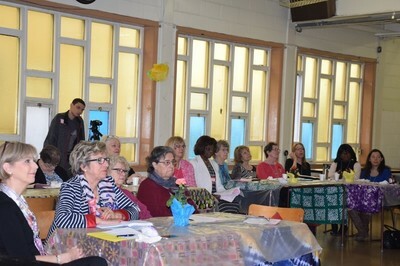 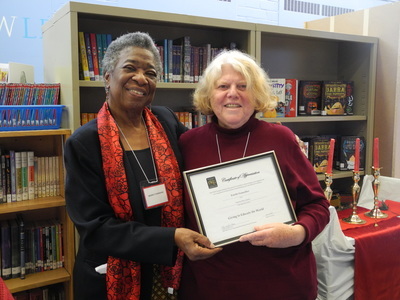 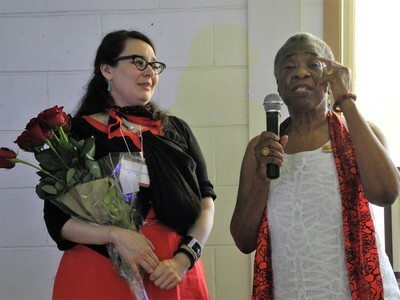 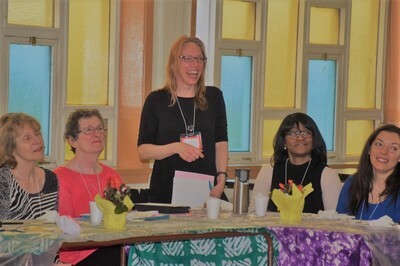 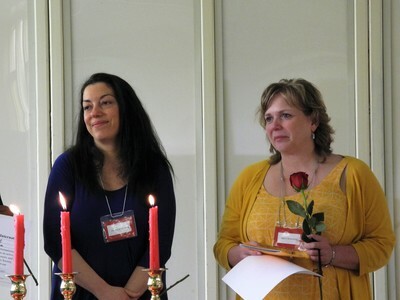 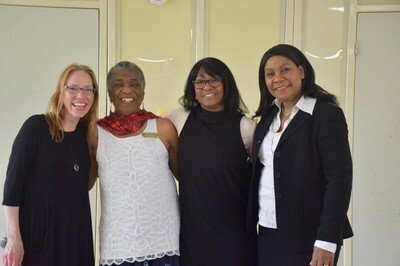 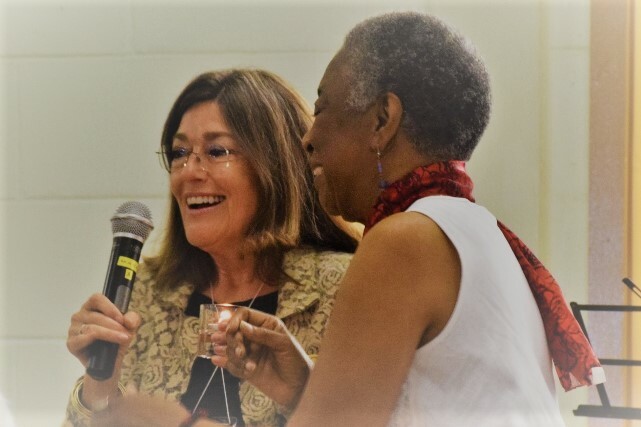 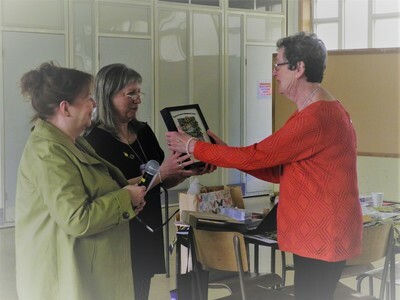 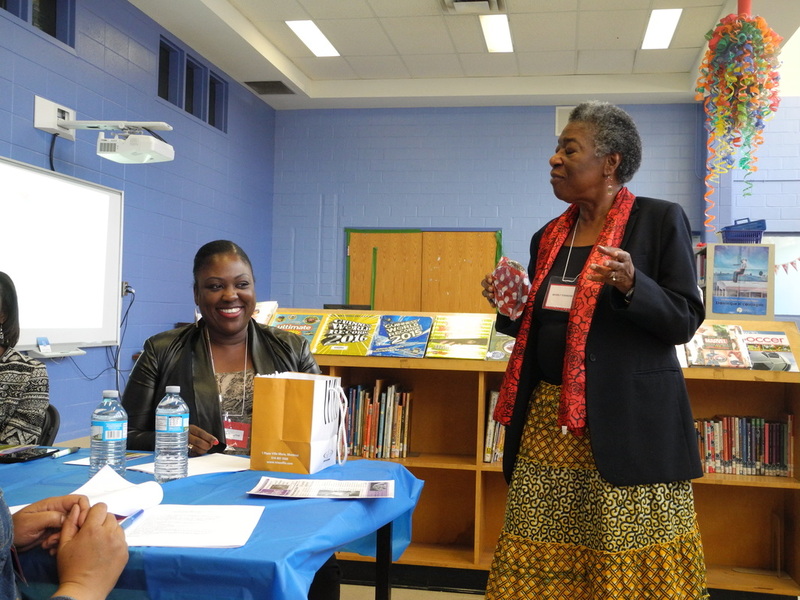 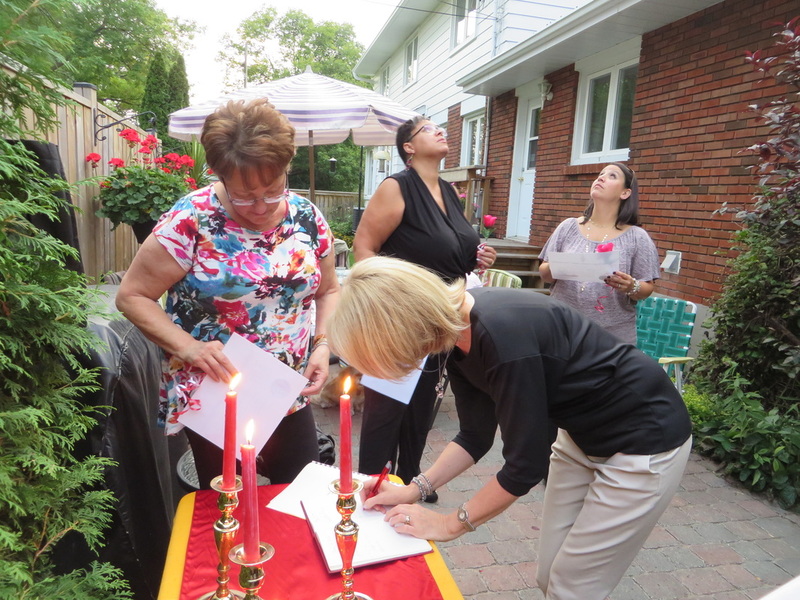 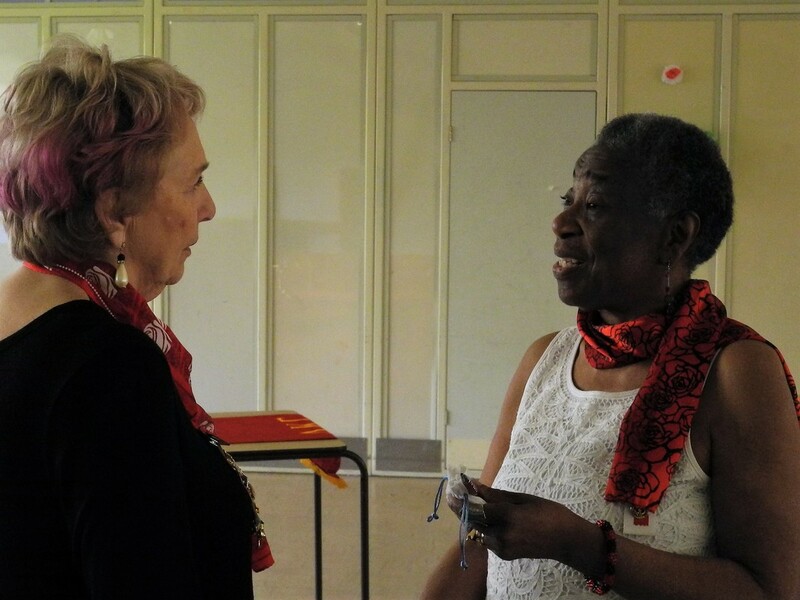 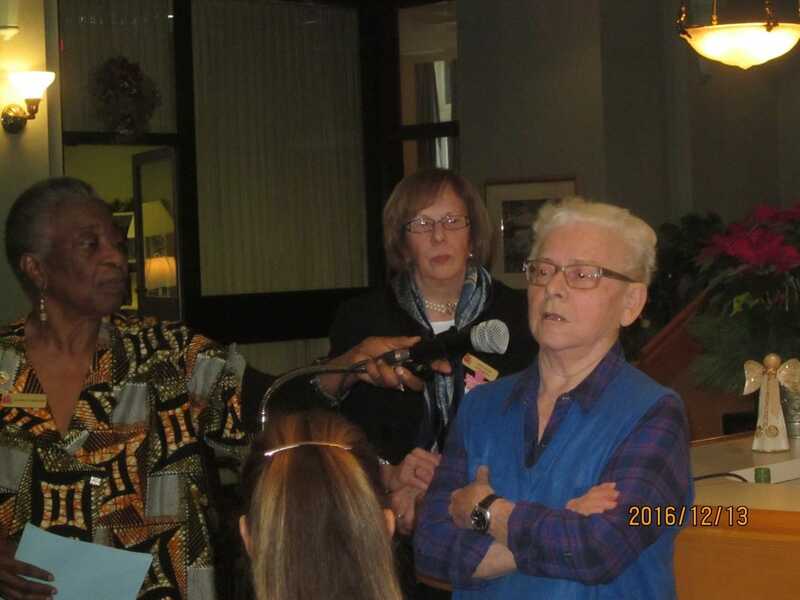 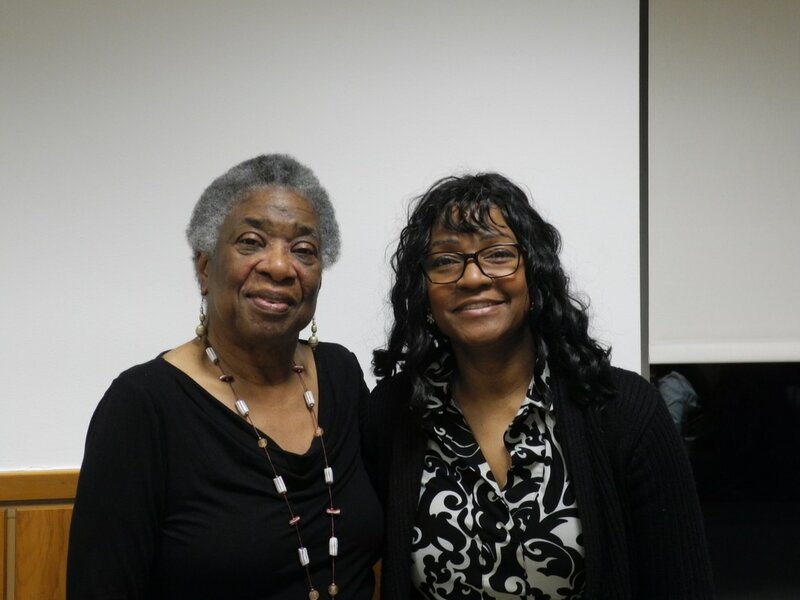 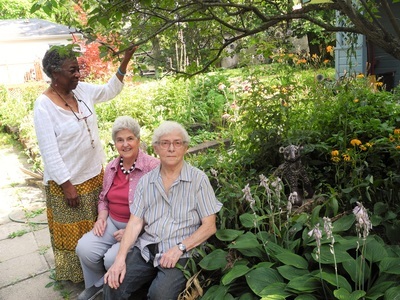 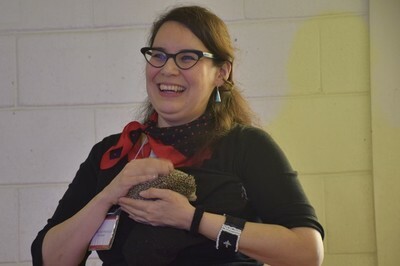 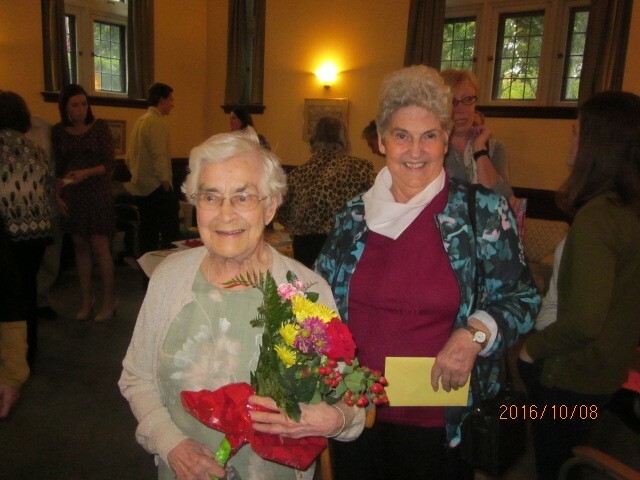 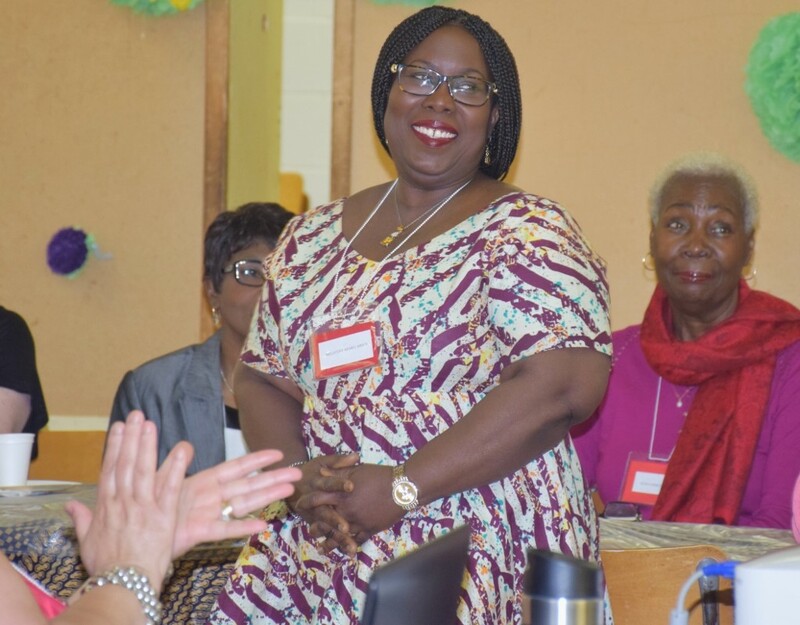 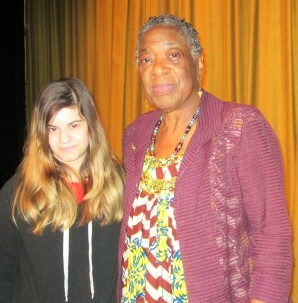 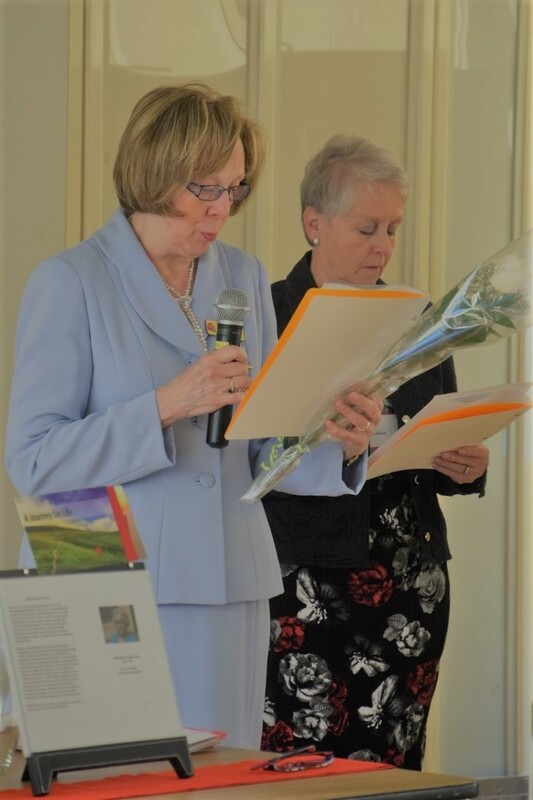 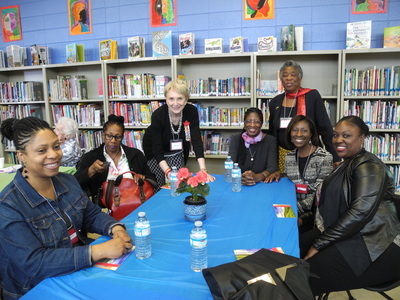 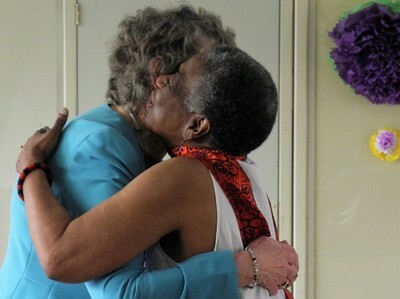 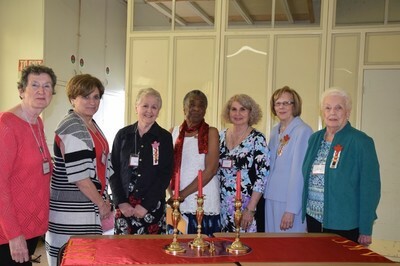 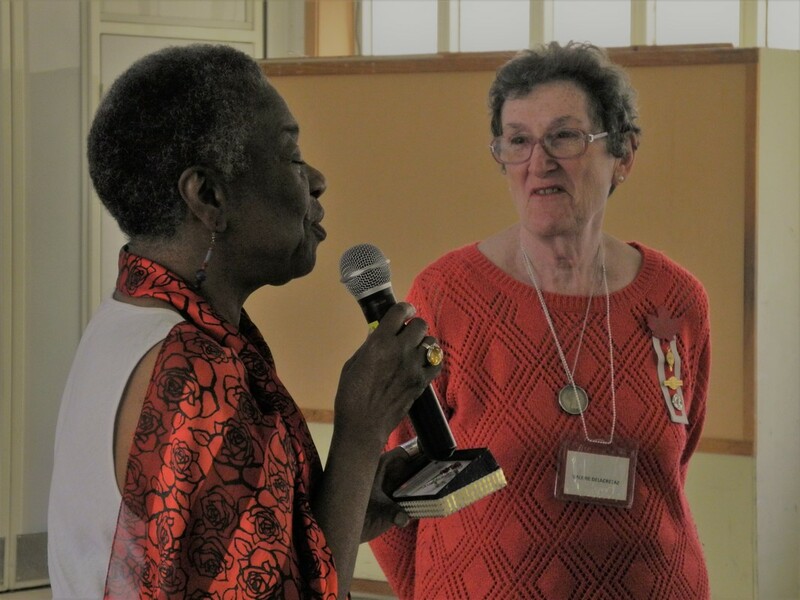 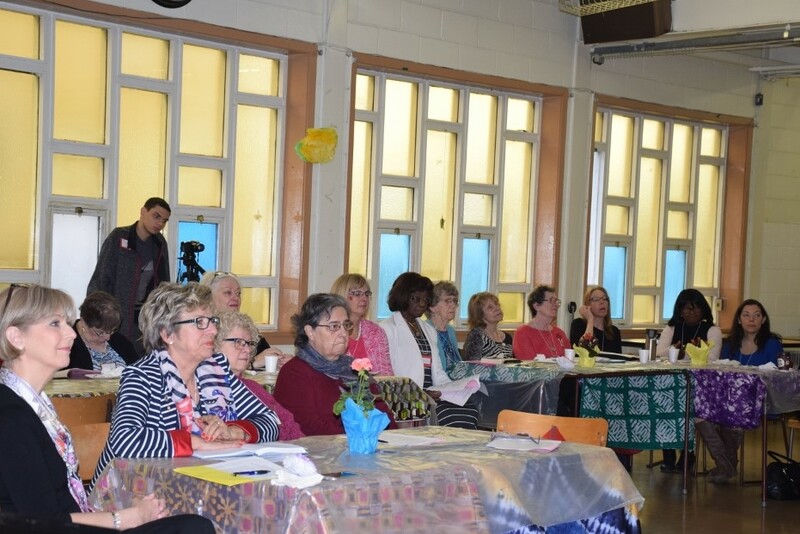 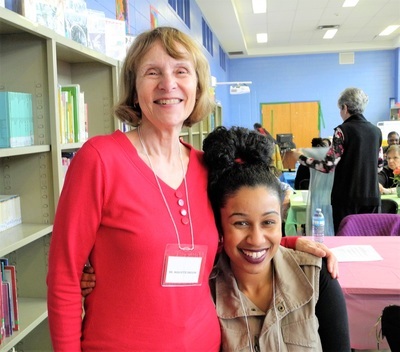 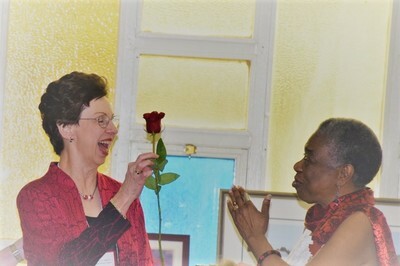 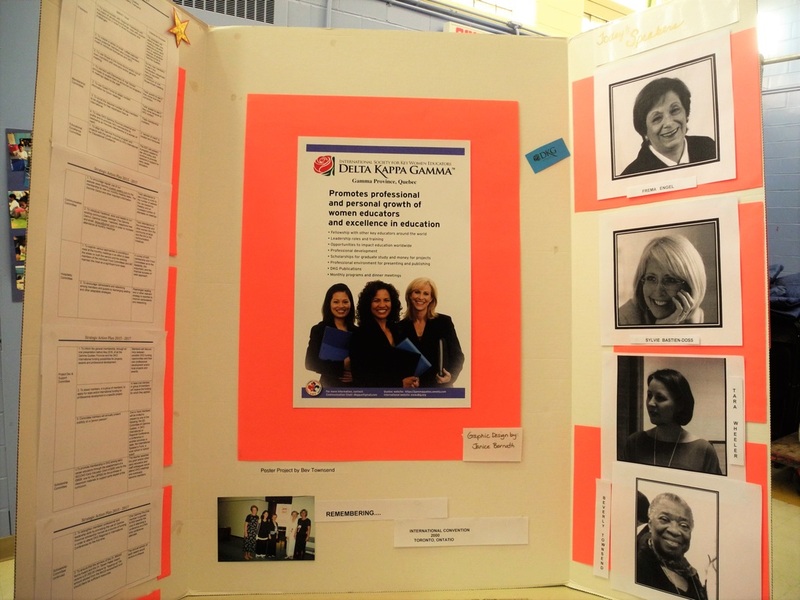 ), pictured left, was nominated by Gamma Province, an affiliate of the Montreal Council of Women, for the Woman of the Year Award . 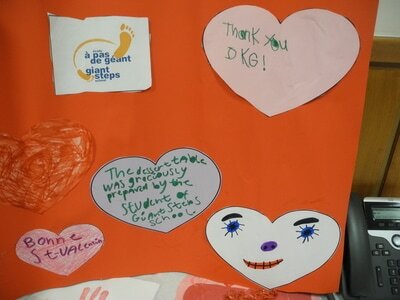 This year's theme was Stop Sexual Violence..
​Ms. Drummond is the Coordinator for the Sexual Assault Research Centre (SARC) at Concordia U.
Tara Wheeler (pictured on the left) is a member of the Educational Excellence Committee. 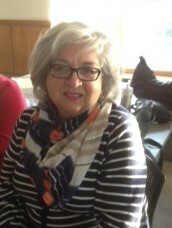 Tara hosted the December meeting. 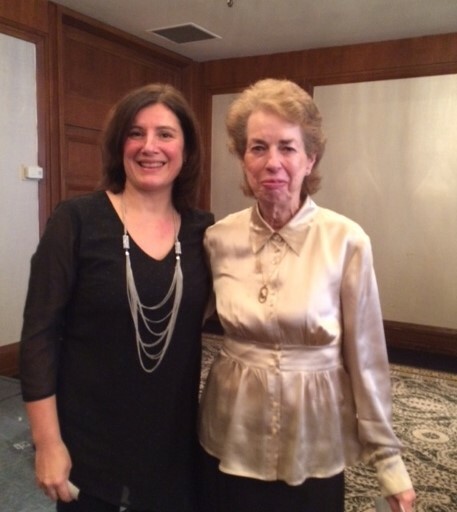 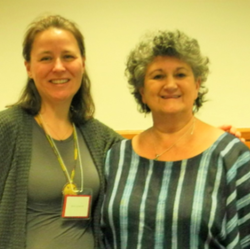 She is seen with our guest speaker, Shara Rosen, Senior Consultant at Strat Com. 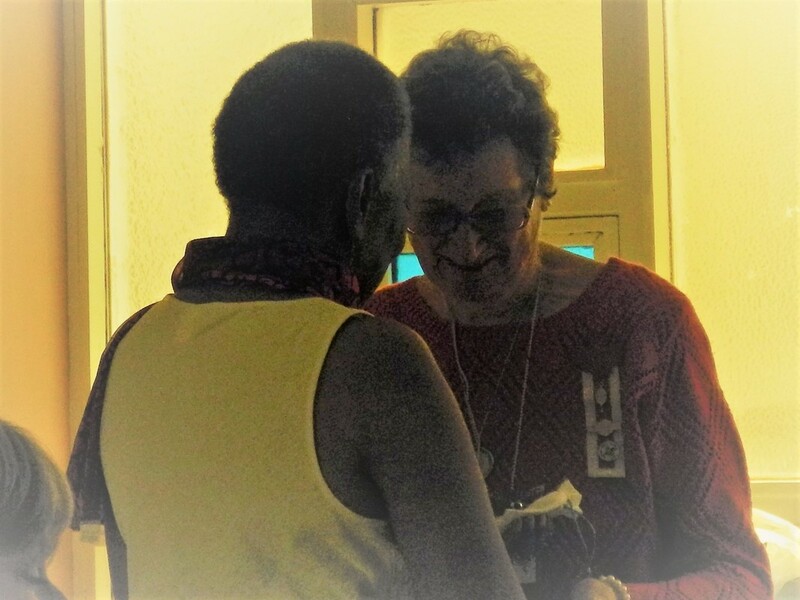 Ms Rosen volunteers in Senegal. 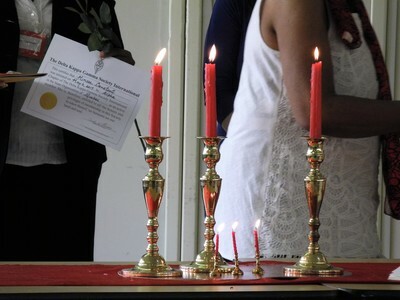 Young women cannot attend school during their menstrual cycles because they cannot afford sanitary napkins. Shara came up with the idea of reusable, washable napkins made of sturdy cotton and absorbable materials. Something so seemingly simple changes female lives. Girls can now attend school and not fall behind in their studies. 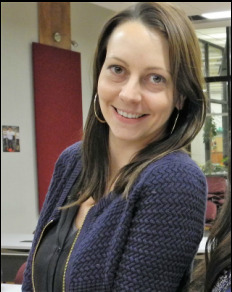 Shara also helps set up mobile maternity clinics. Google Shara Rosen for more information on Sénégal Santé Mobile. Donations are always appreciated. 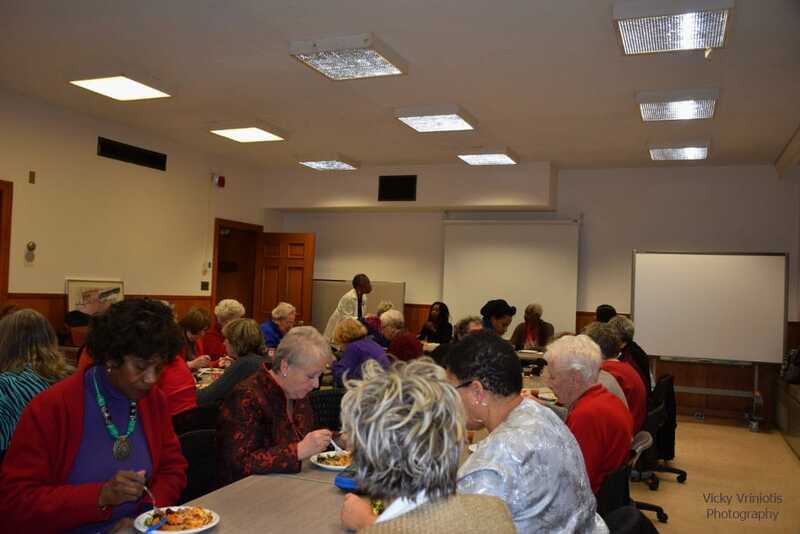 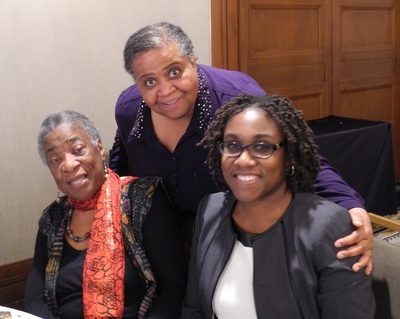 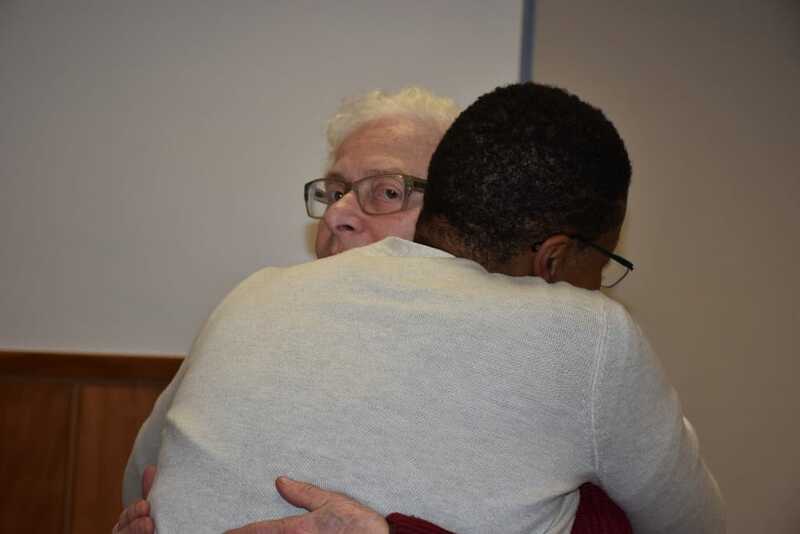 Since we did not have a January meeting for the first time in years, some Gamma Province members decided to warm up the winter by celebrating with Dr. Mildred Burns, our mentor. School administrators, teachers and educational personnel often face overwhelming and challenging interpersonal experiences with colleagues, staff members, or parents. 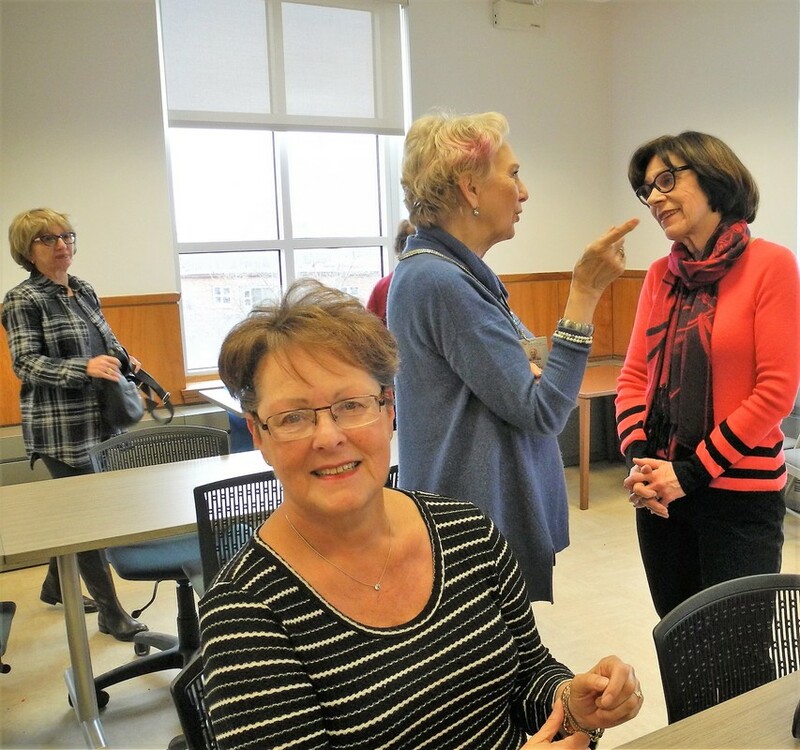 DISC® is a powerful approach which helps educators discover more about themselves, better understand adults they work with, and adapt their communication style to improve their relationships. 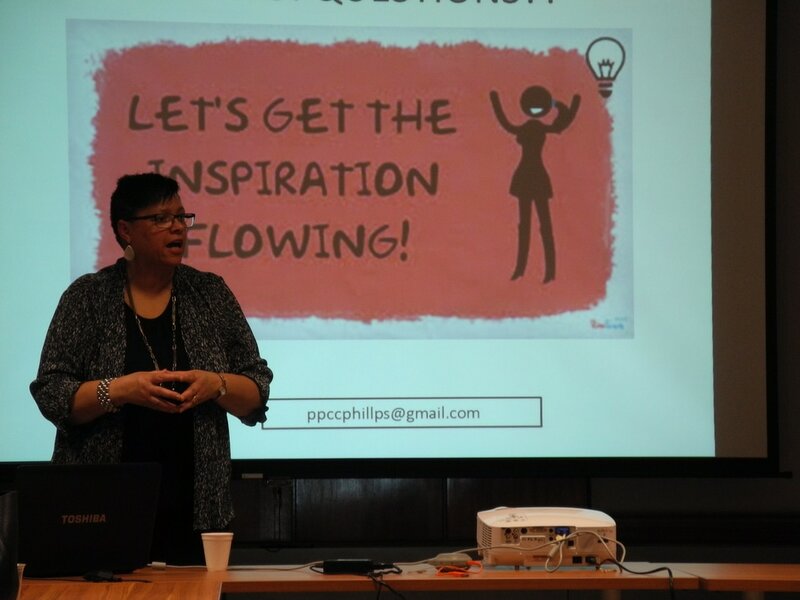 A life changing session! 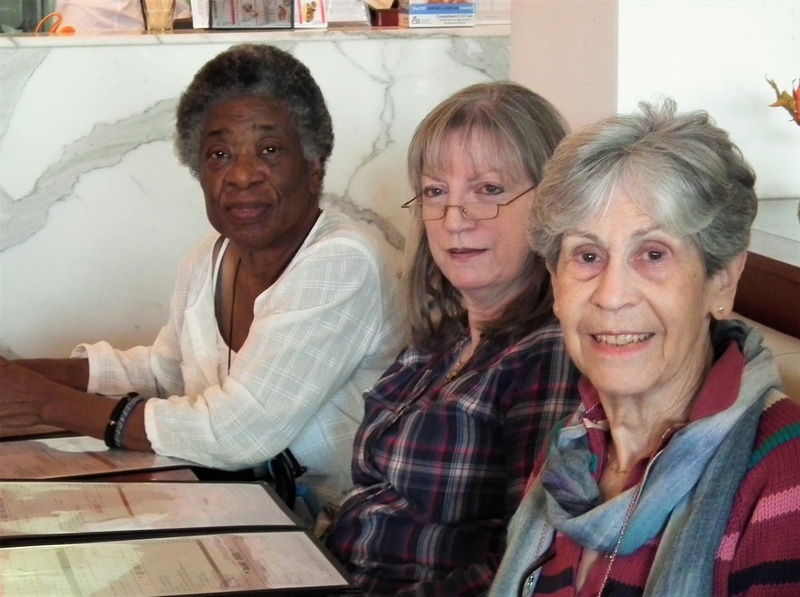 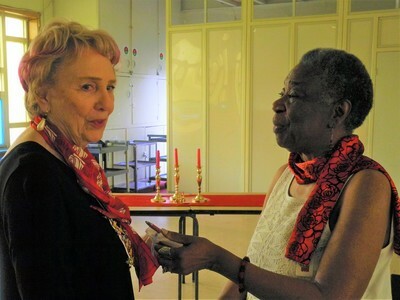 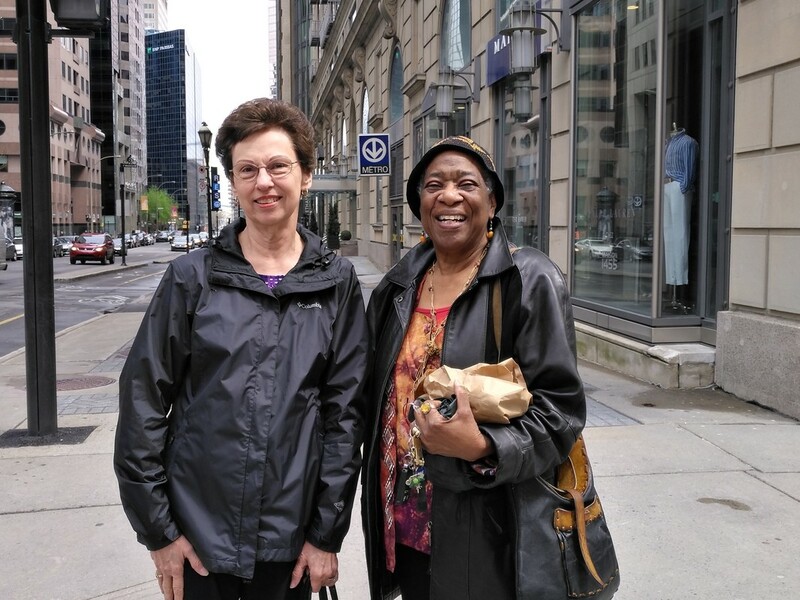 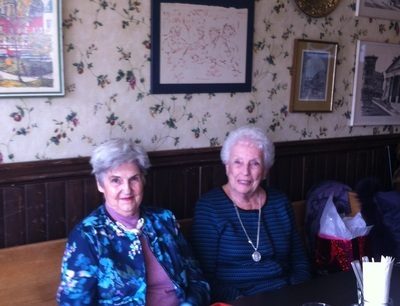 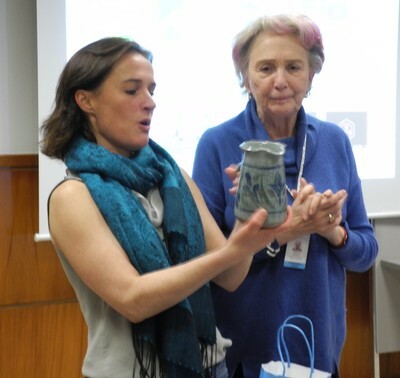 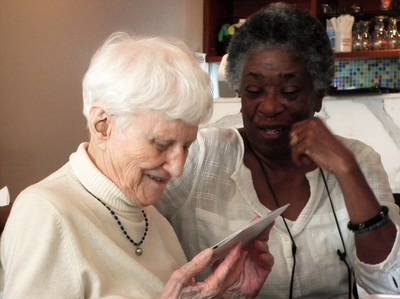 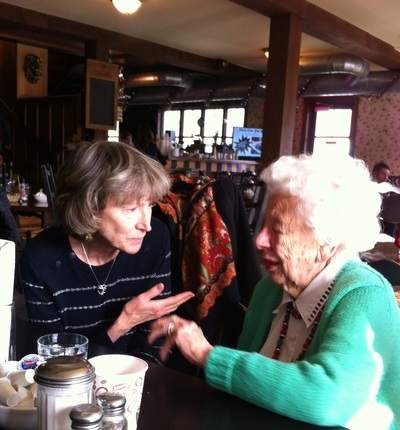 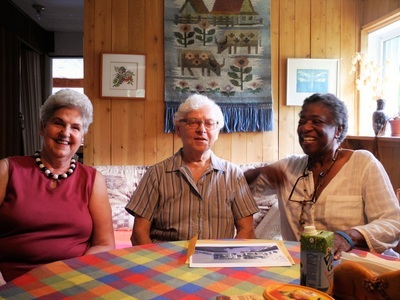 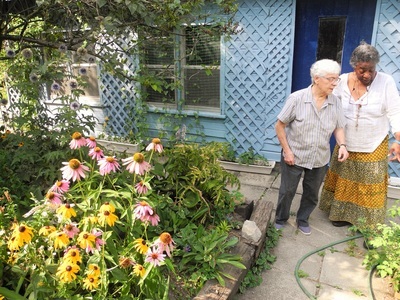 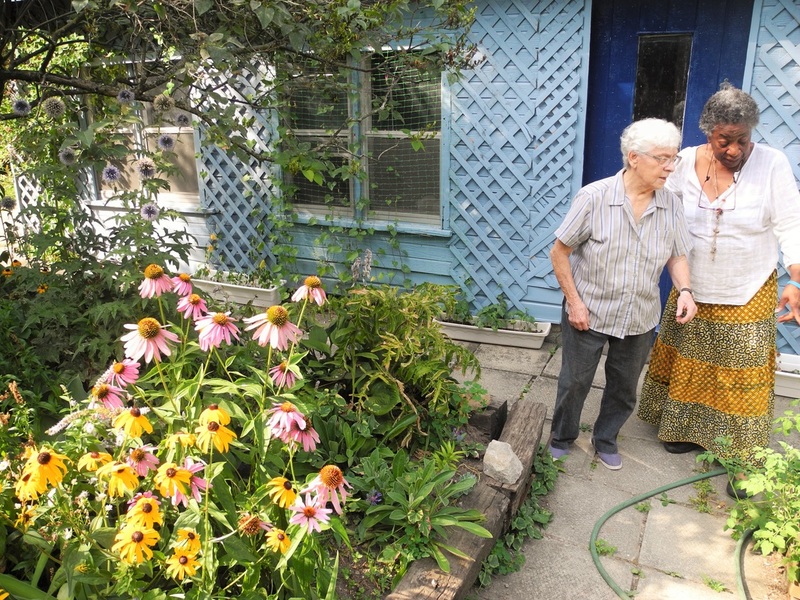 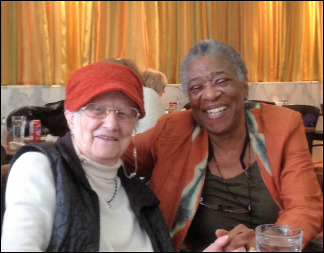 Sylvie (left) is seen with Rose Szasz, our resident artist, a talented potter and watercolourist. 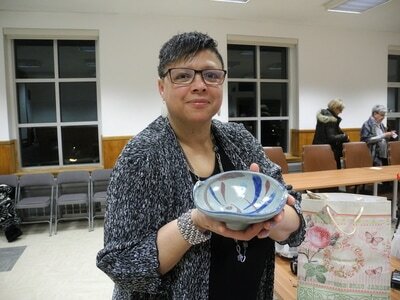 Sylvie displays Rose's beautifully crafted gold-gilt bowl. 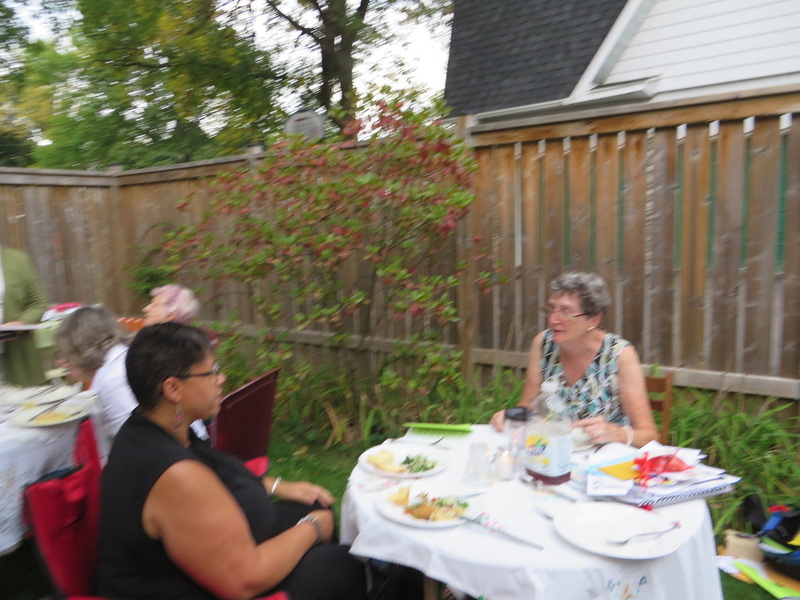 Four of our seven applicants for the World Fellowship Scholarship were able to share dinner with our members and listen to our guest speaker, Sylvie Bastien. 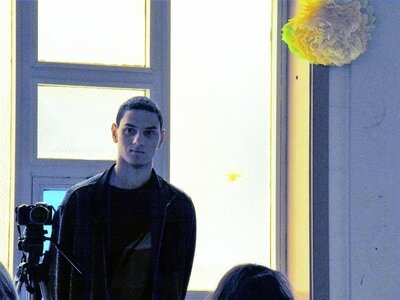 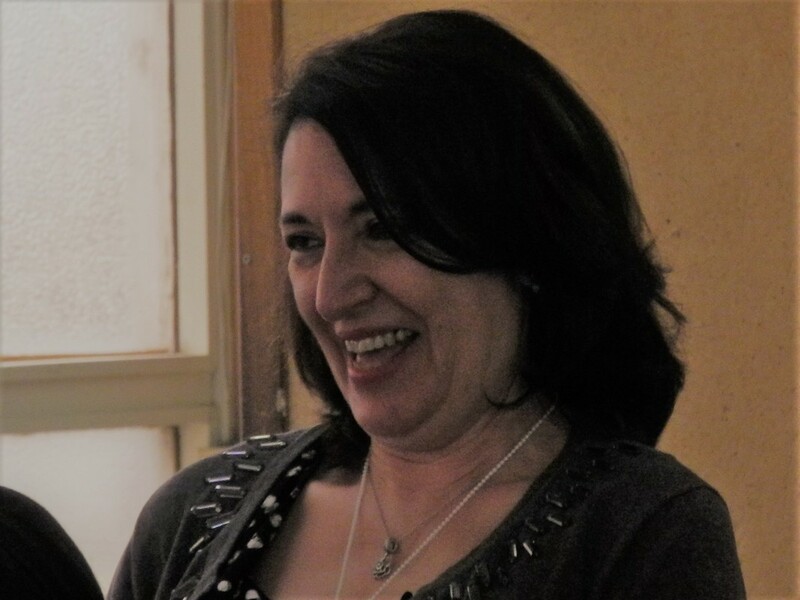 Ipek Mehmetoglu (Turkey), a doctoral student in Architecture researching the relationship between early twentieth century art, architecture and the everyday lives and spaces of women. 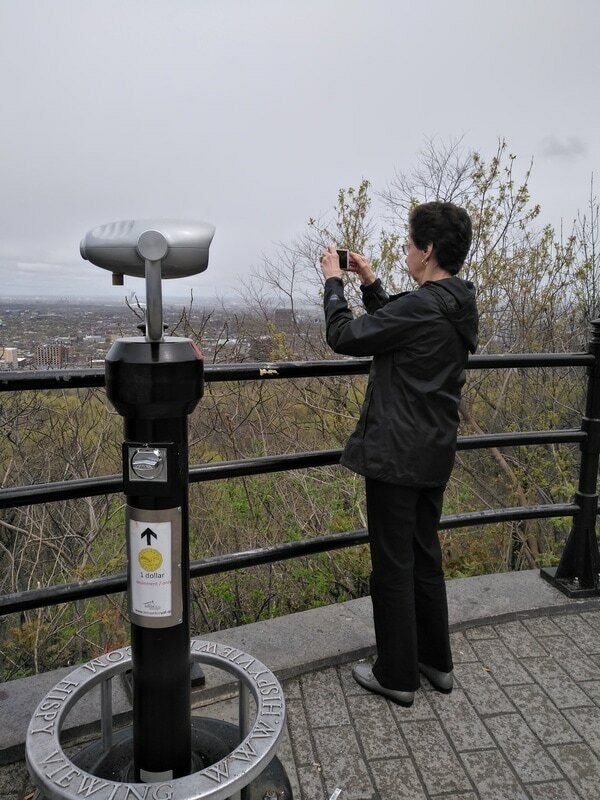 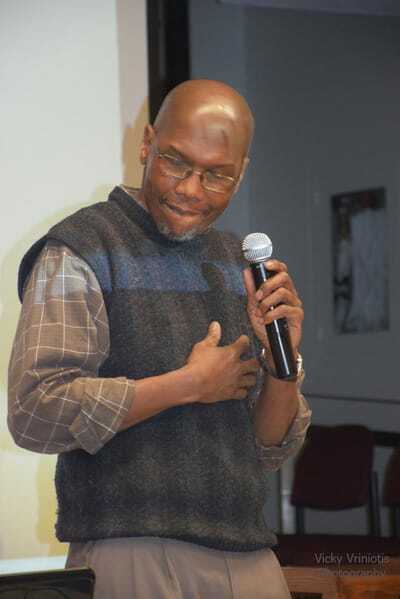 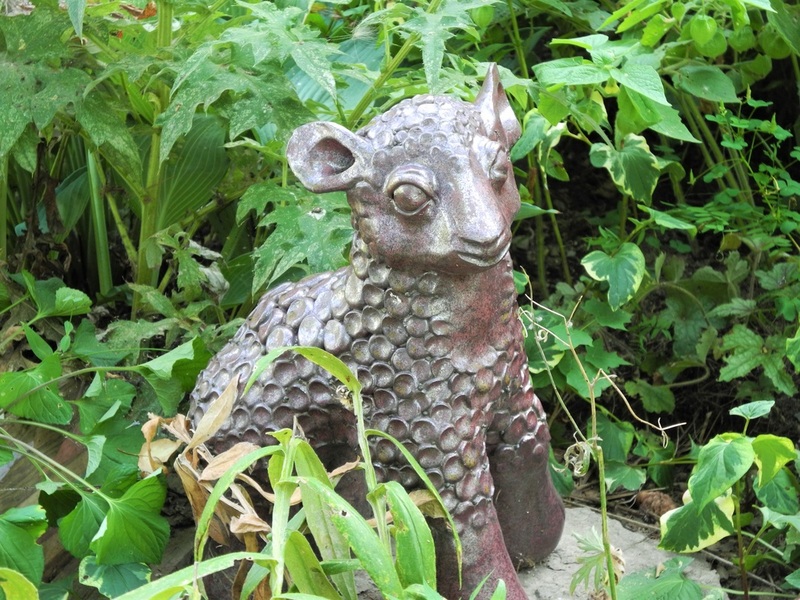 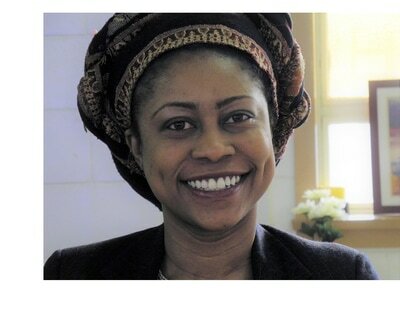 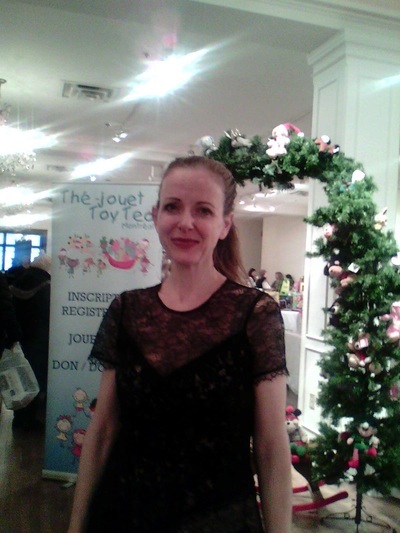 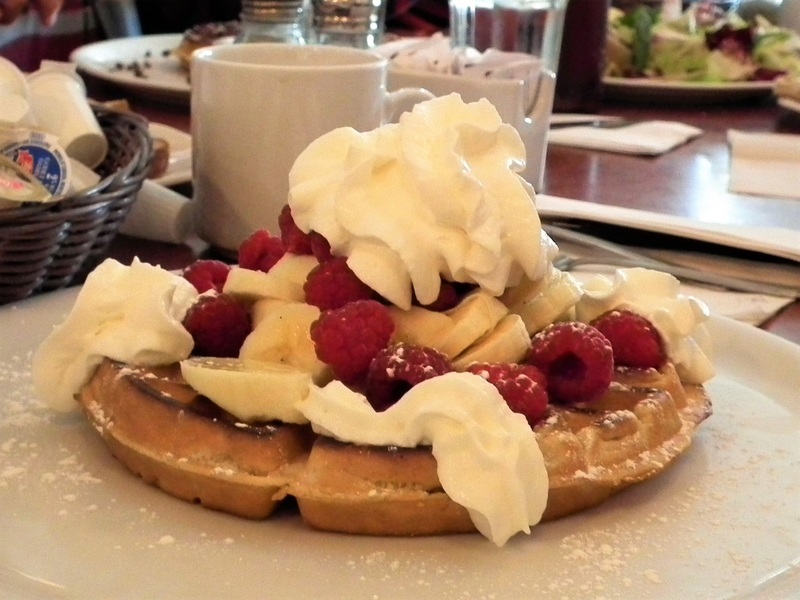 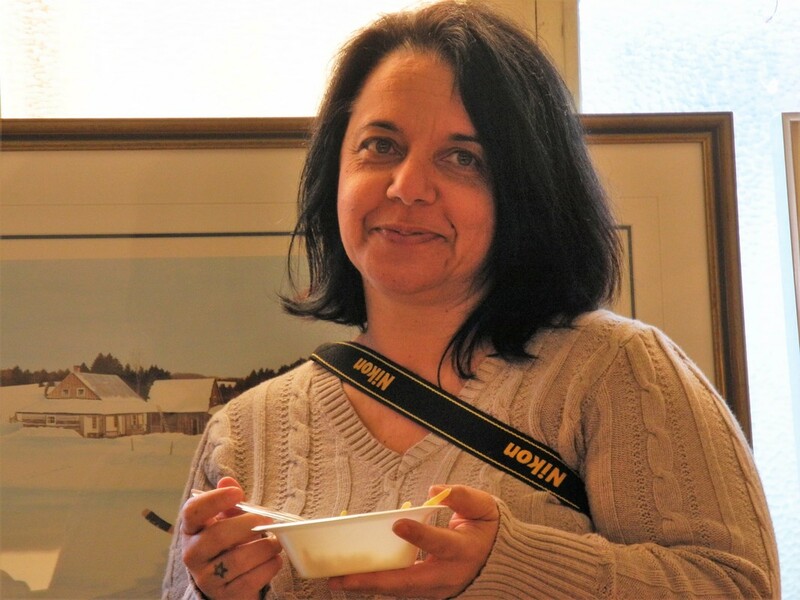 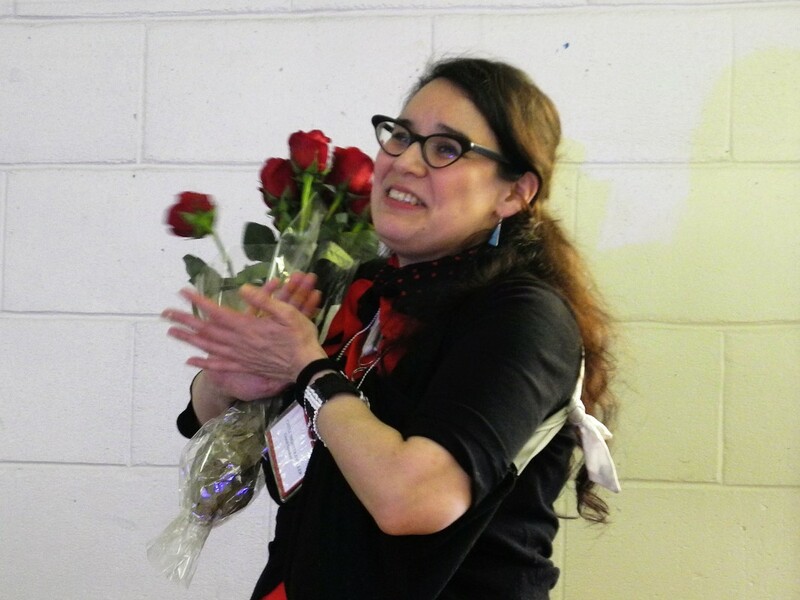 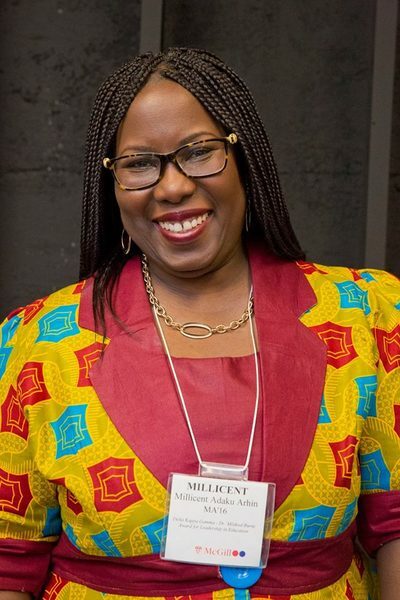 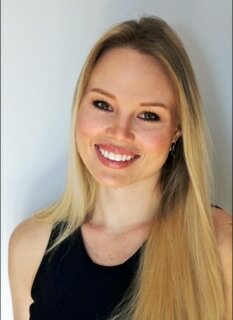 "I attended McGill University where I earned a Bachelor’s degree in Education as an Elementary Generalist. 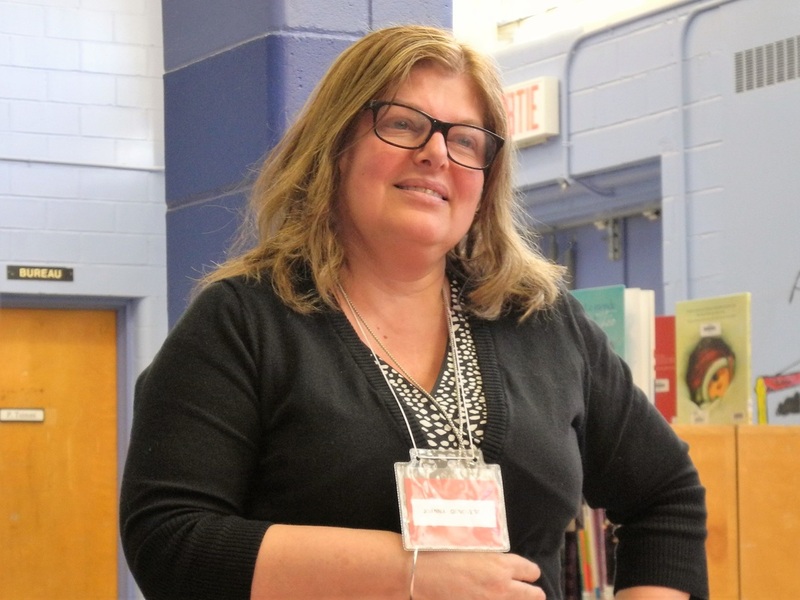 I started my teaching career at Howard S Billings High School (NFSB), working with students with learning disabilities in Grades 7 and 8. 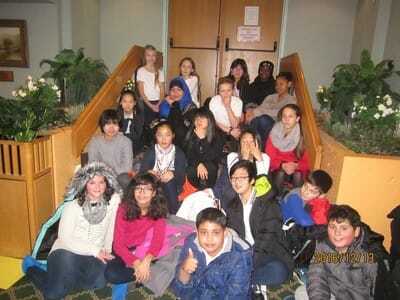 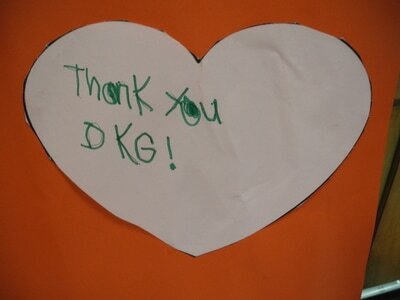 While I enjoyed the experience, I truly wanted to work at the elementary level. I transferred to a special needs class at St. Willibrord, (NFSB) where I spent 6 years teaching in the Senior Learning Center. 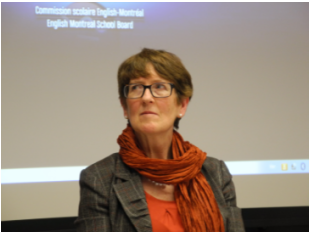 During my time in the Learning Centre I enrolled in Graduate studies at Concordia University in the Child Studies Program. 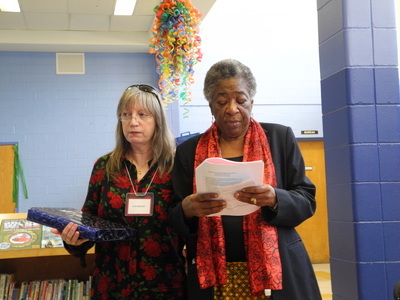 My focus was specifically in reading development. 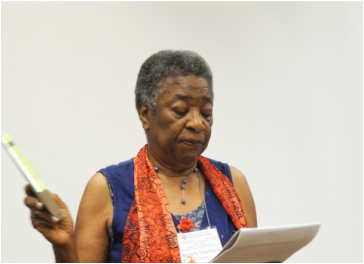 I continue to work with my thesis advisor, Dr. Sandra Martin-Chang, in research on reading and I am a member of the Society for Scientific Research of Reading. 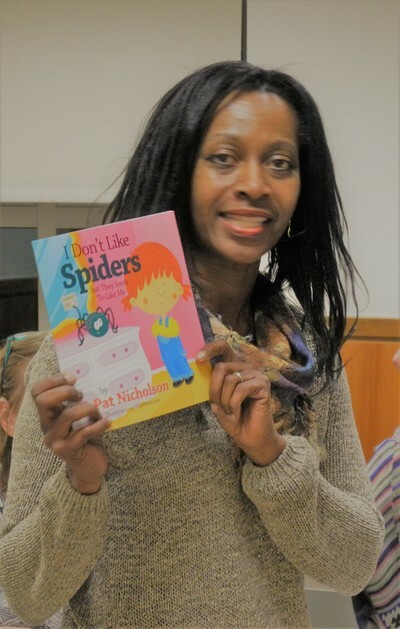 I am currently teaching a grade 1-2 class at Gault Institute in Valleyfield where I recently launched a reading homework program as a means of increasing reading scores amongst our student population. " 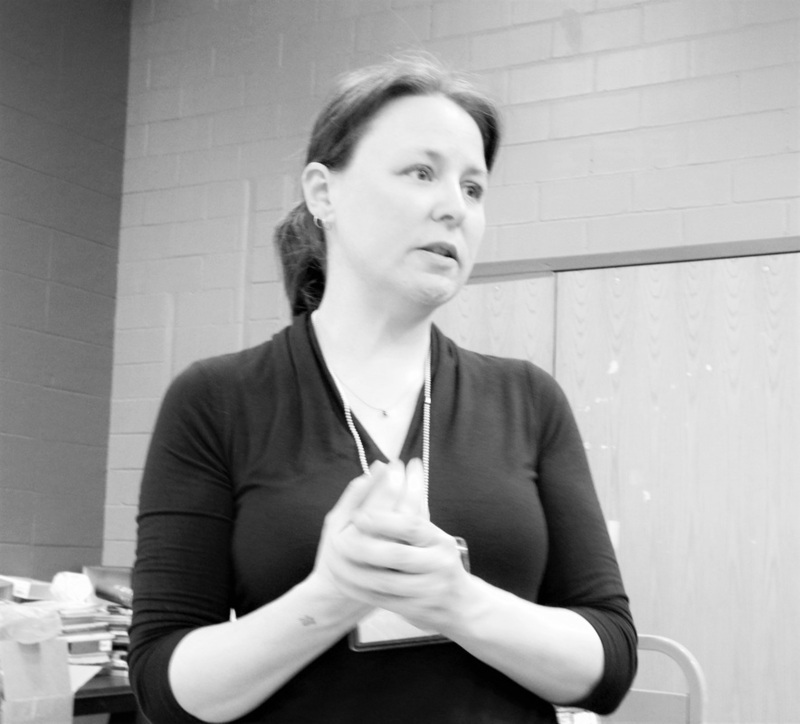 ​Linda spoke to us on the effects of contextual reading and feedback on orthographic development which is the topic for her master's thesis. Her study was based on 25 participants in grade 2 with the mean age of seven. 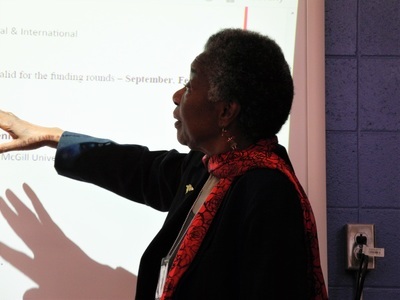 Her conclusion is that students need three areas to improve their reading skills: phonology (sound), orthography (print) and semantics (meaning). 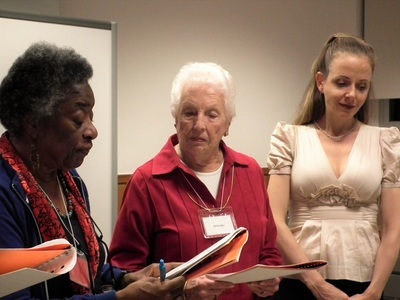 A repetition of these three components led to more success in reading skills. 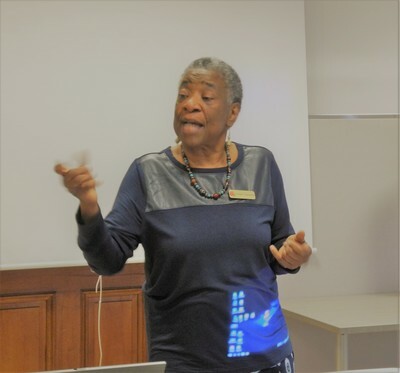 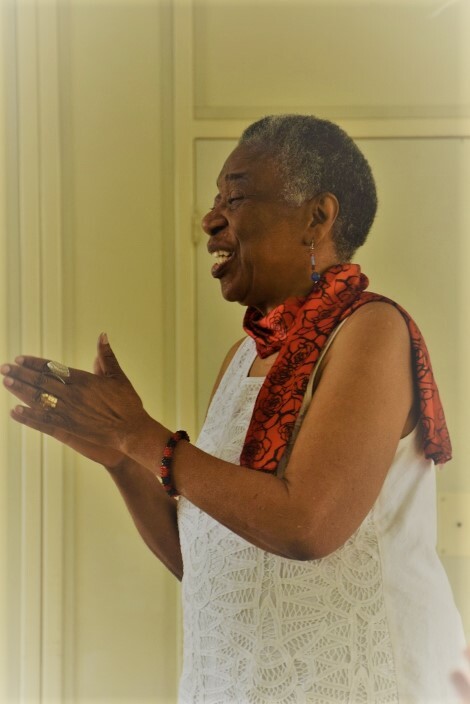 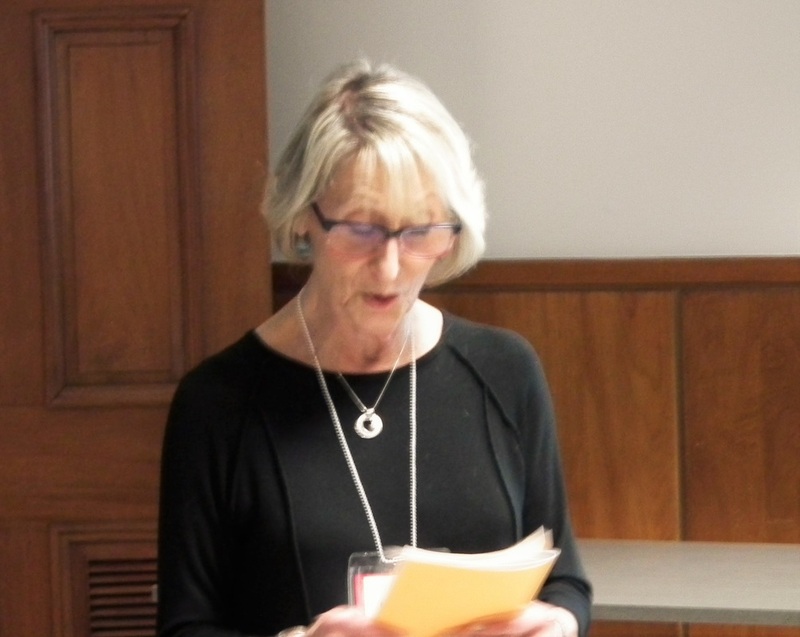 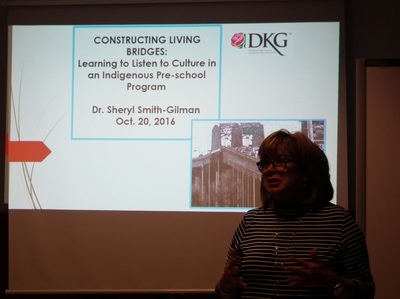 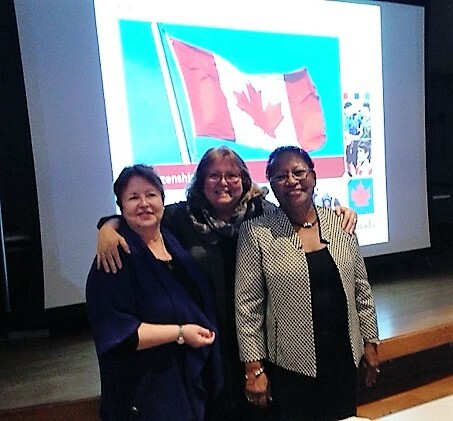 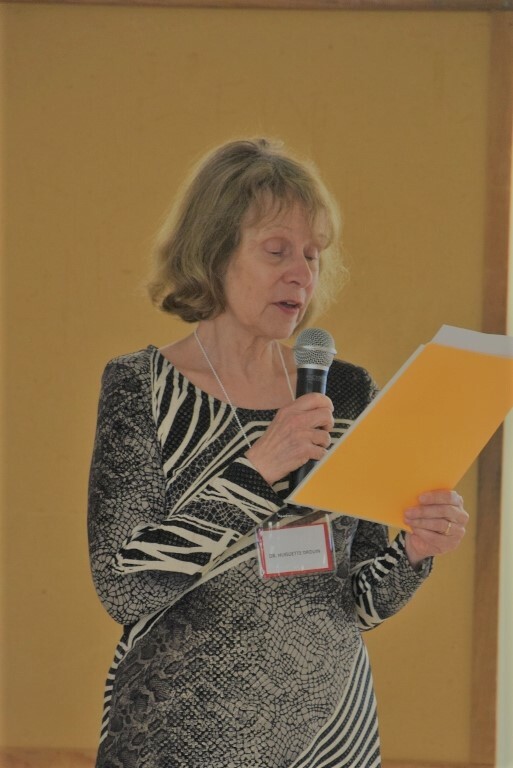 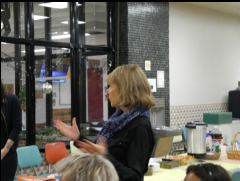 Evadne Anderson spoke to Gamma Quebec members on Buddhism Meets the Goal of Global Awareness at the Coach House at McGill University. 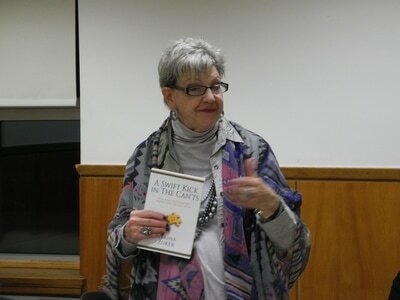 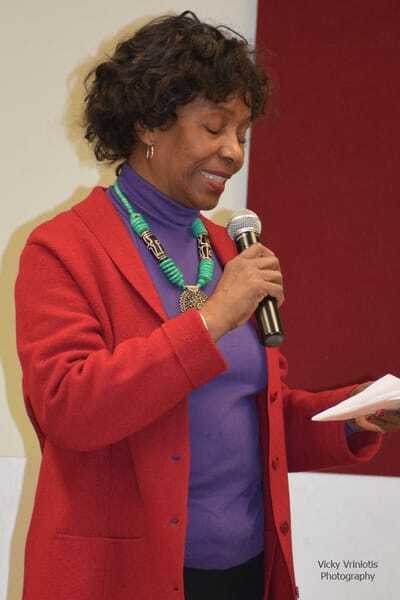 Prof. Anderson gave a brief history of the branch of Buddhism that she follows, and explained how the daily rituals of this practice enriches her relationships with family, friends and the world. Our theme for Beverly Townsend's first Annual General Meeting: What's Your Passion. 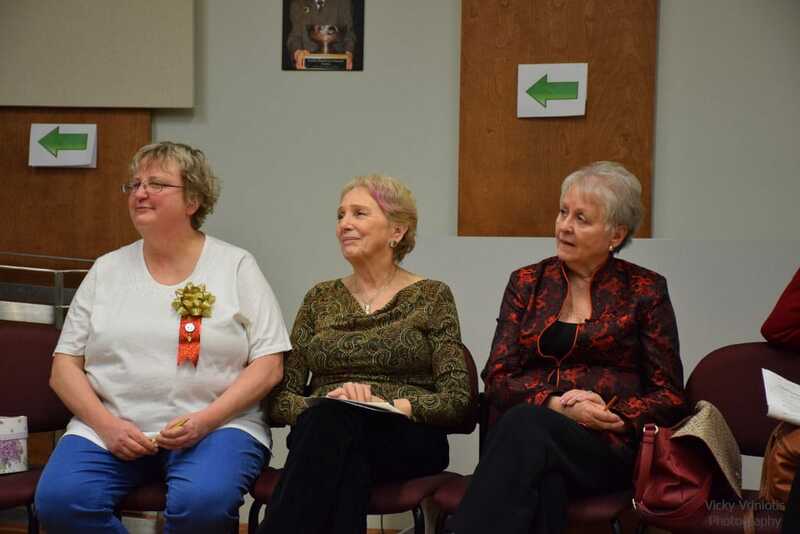 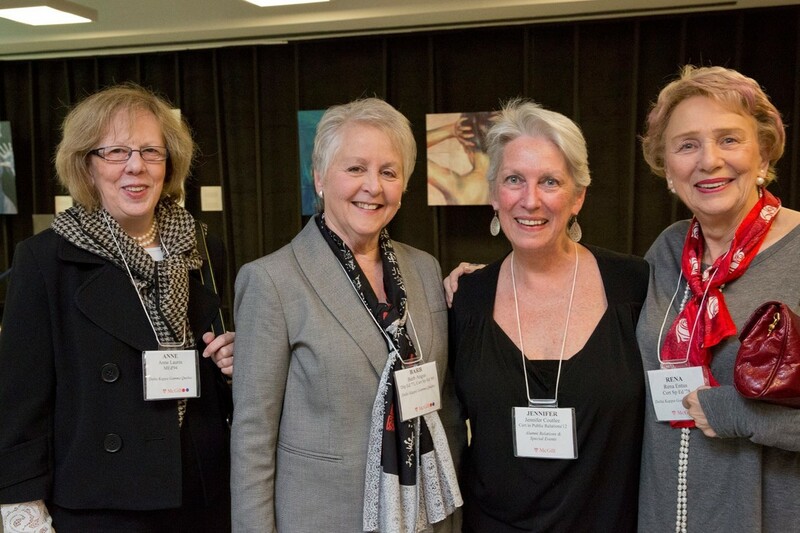 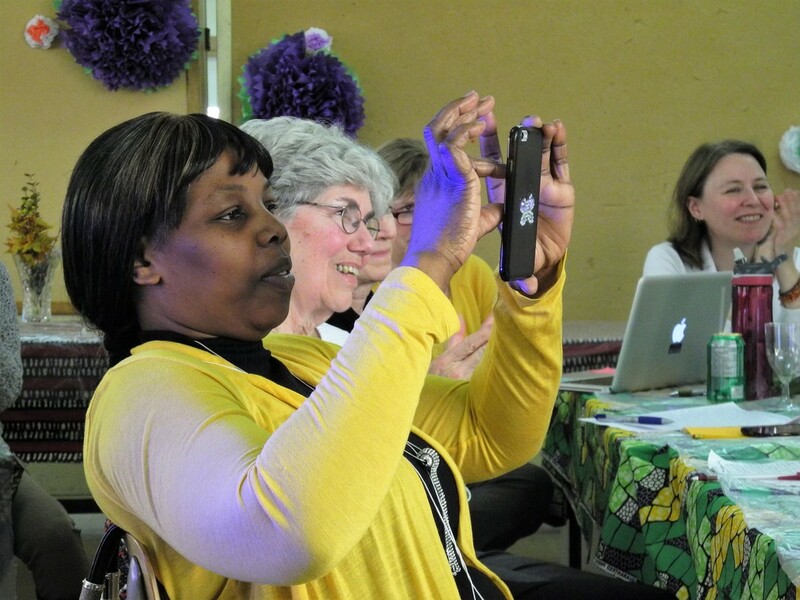 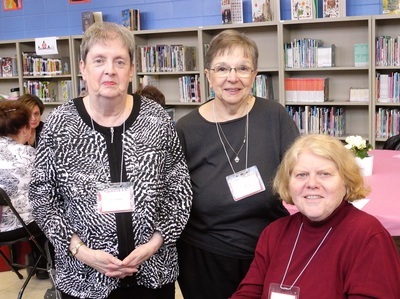 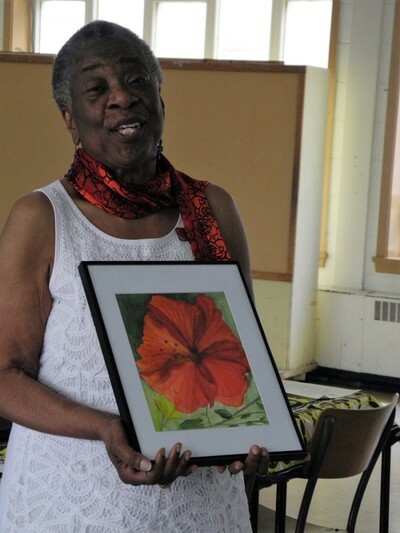 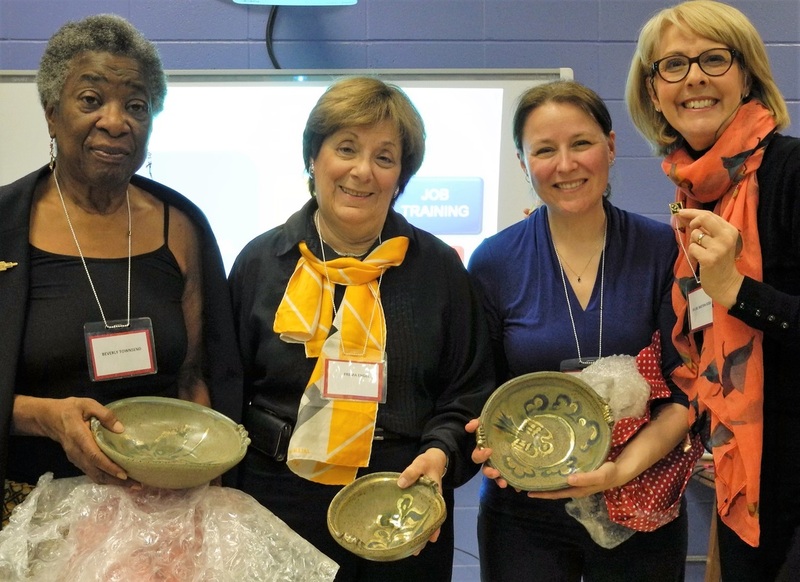 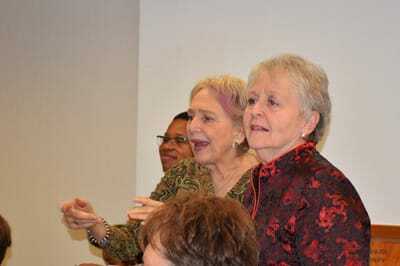 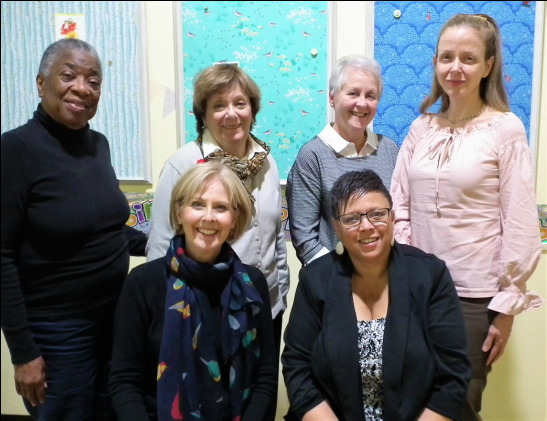 Bev Townsend, Frema Engel, Sylvie Bastien-Doss and Tara Wheeler shared their passions. 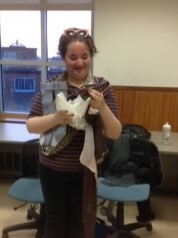 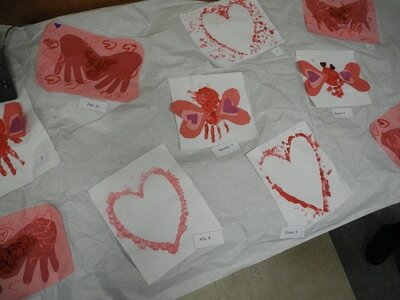 One of Coronation School's passions: Creativity! 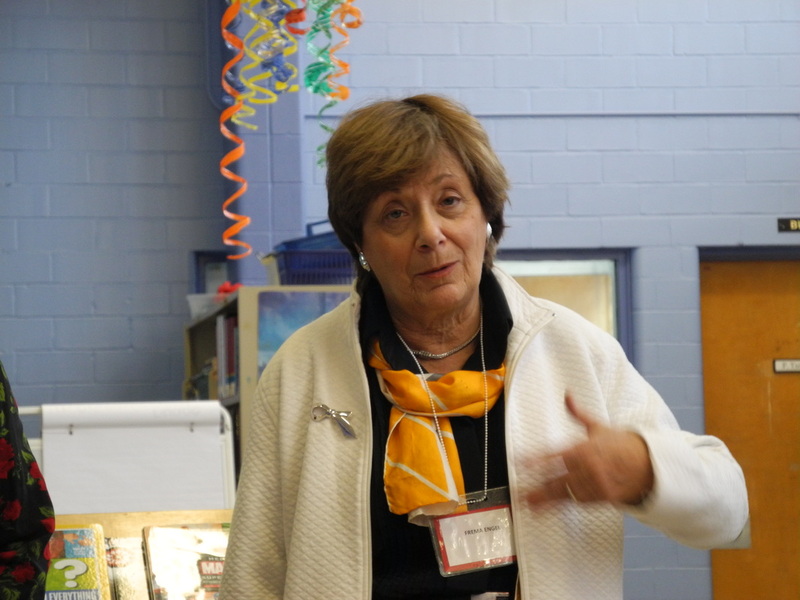 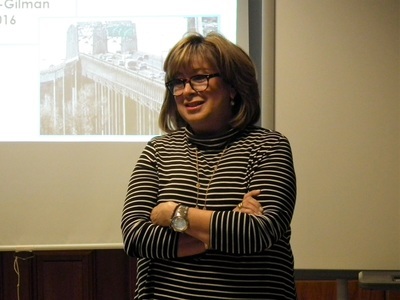 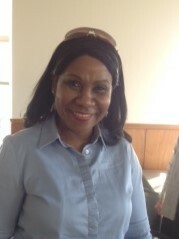 Joanna Genovezos, Principal, hosted our meeting at Coronation School. 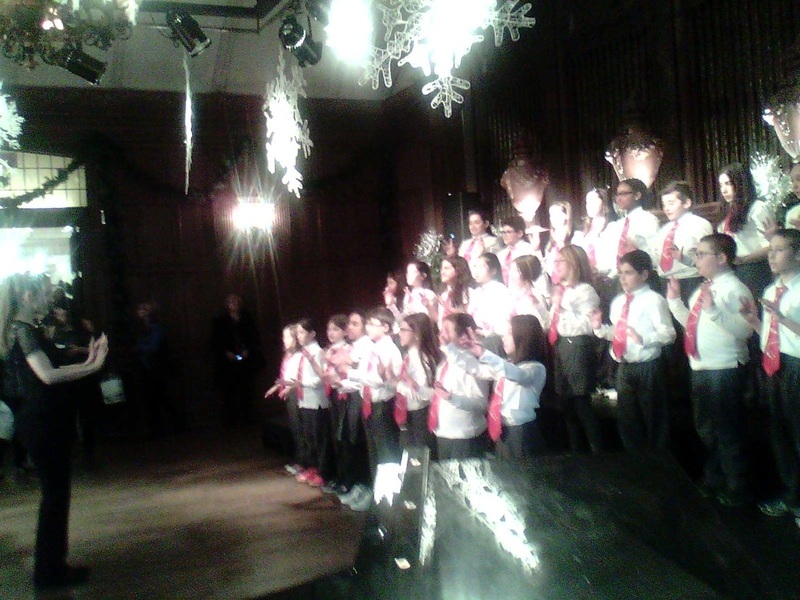 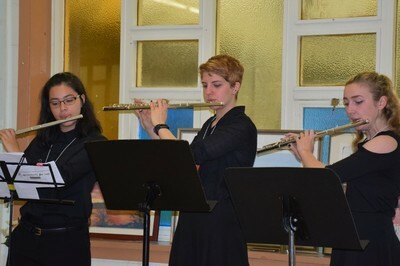 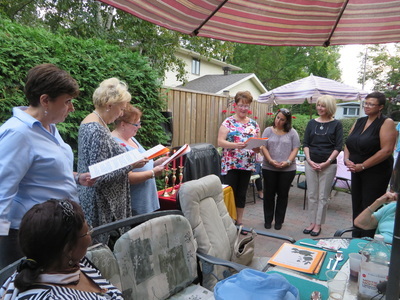 The atmosphere was light and airy, and creativity shone through the innovative steel band. What a welcome! 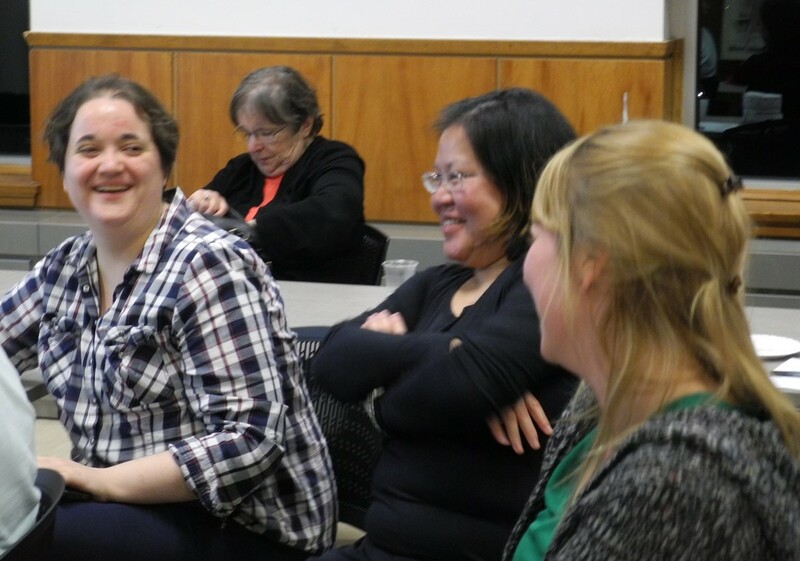 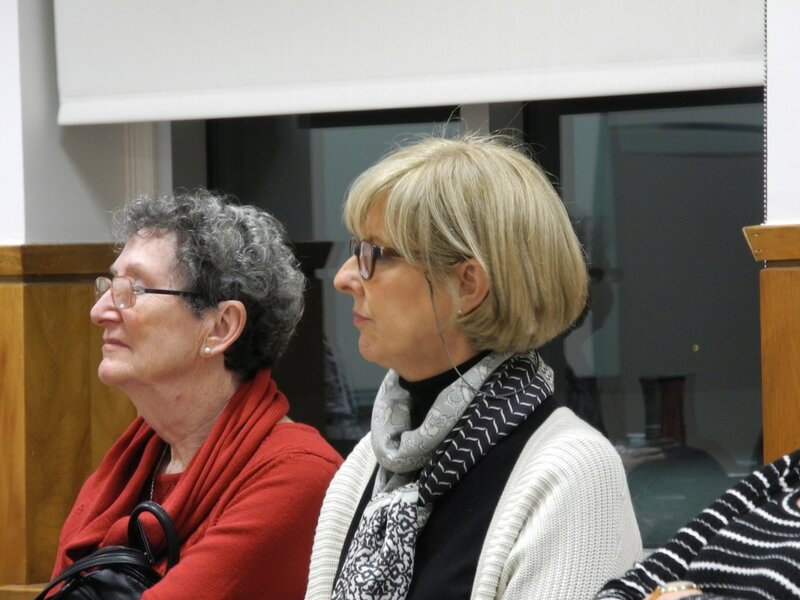 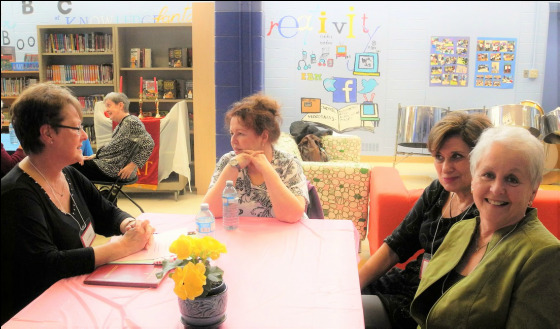 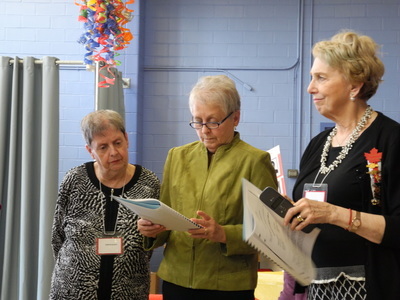 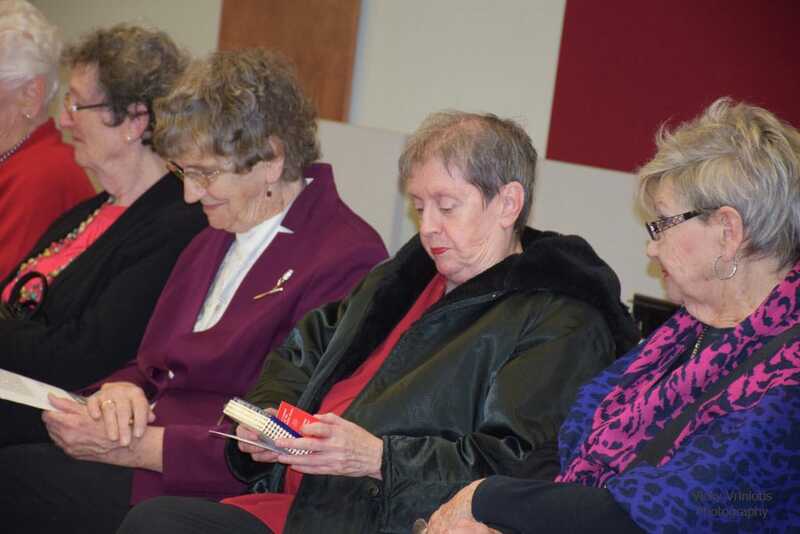 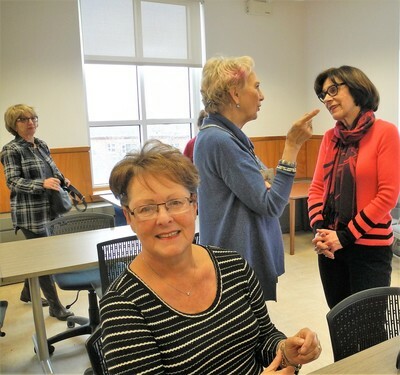 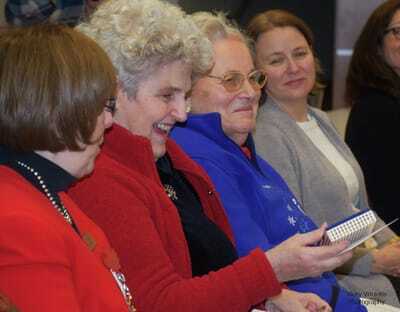 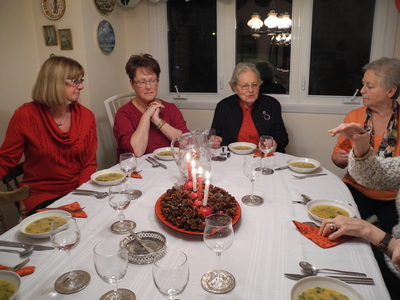 Judy Szamosi (left) and Linda Phelan (centre) chat; Mindy Spiegel (right of Linda) and Barb Angus enjoy the conversation. 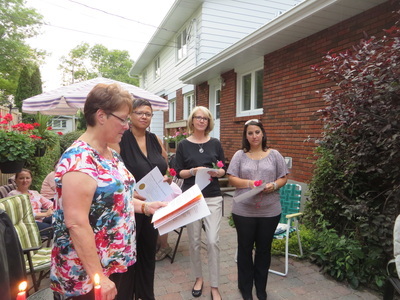 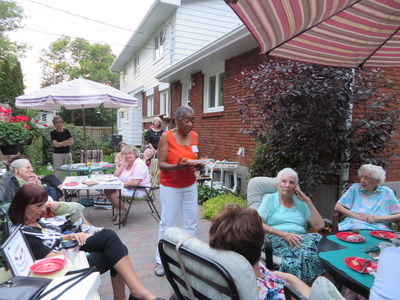 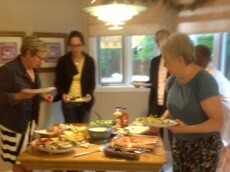 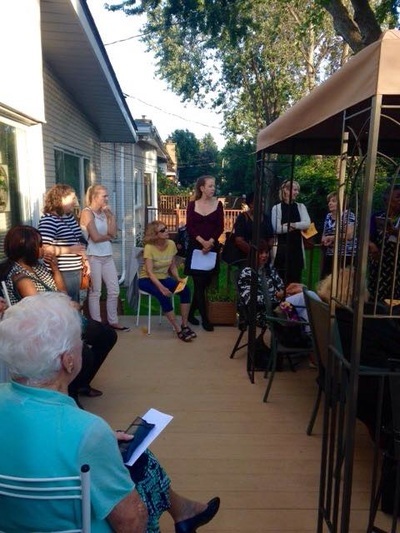 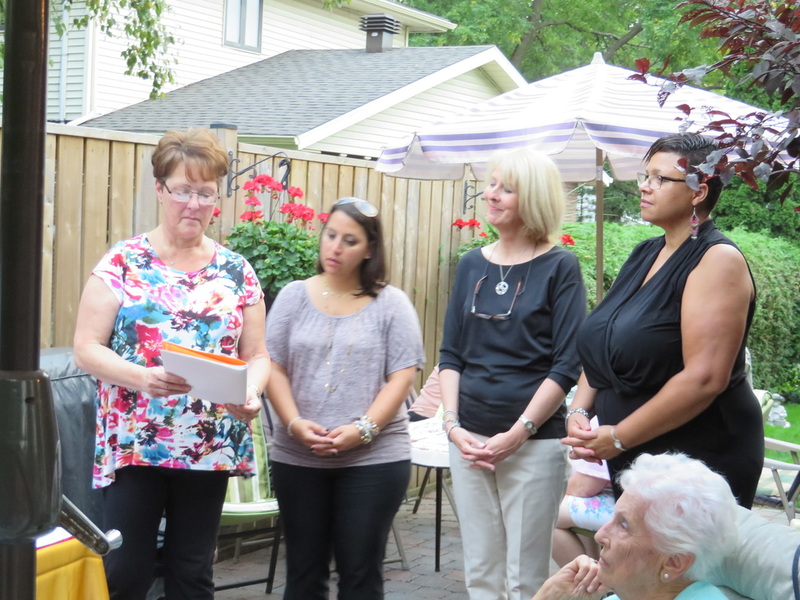 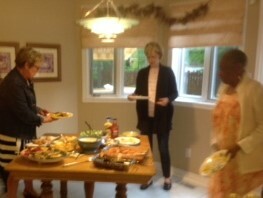 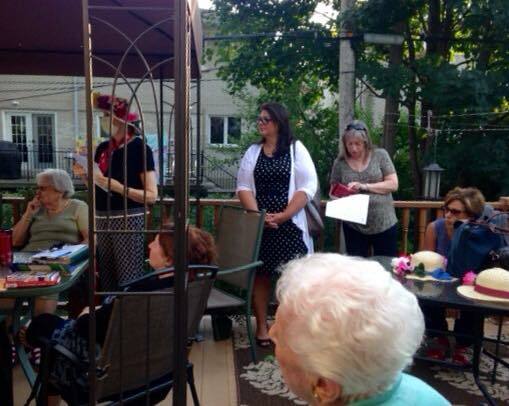 It was a lovely summer evening at Judy Szamosi's home on September 13th. 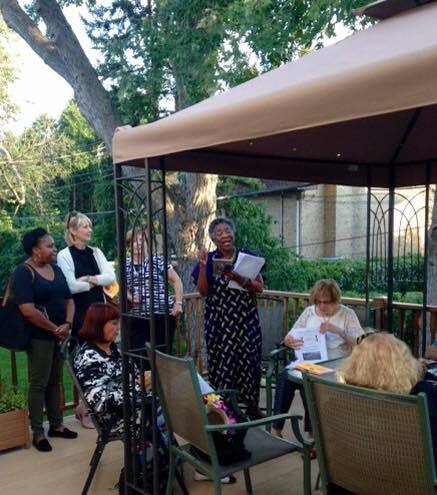 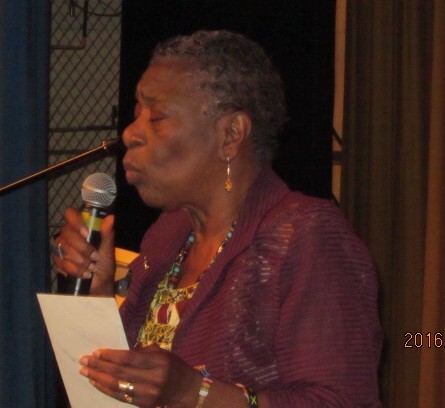 Beverly Townsend conducted the meeting outdoors. 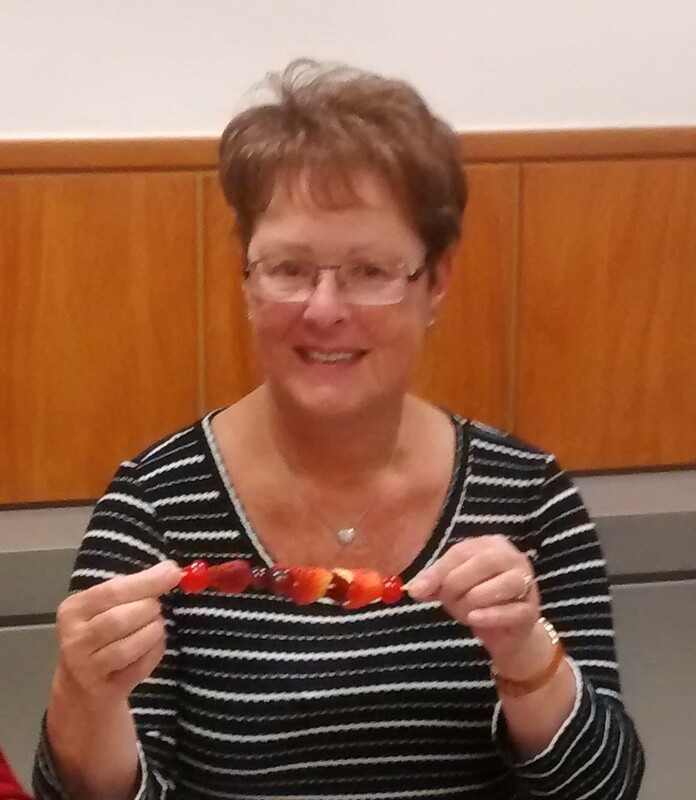 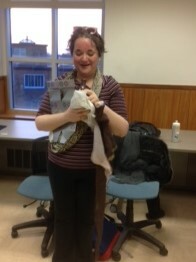 We had six new guests attend the meeting, and we initiated a new member, Ardis Root. 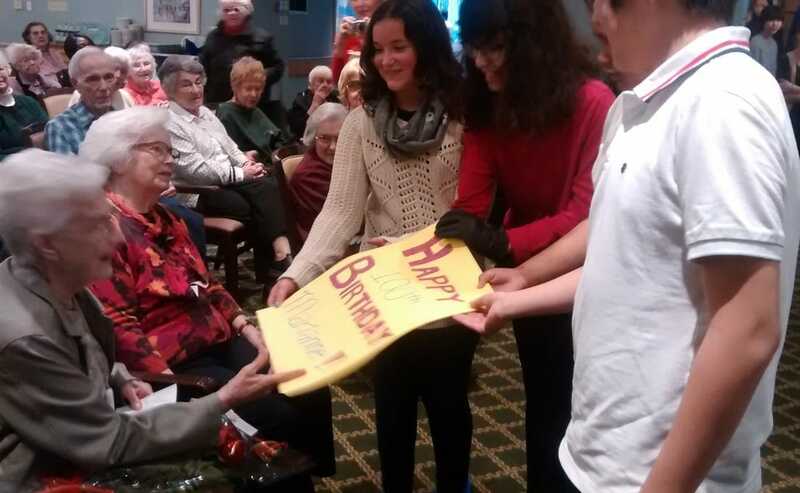 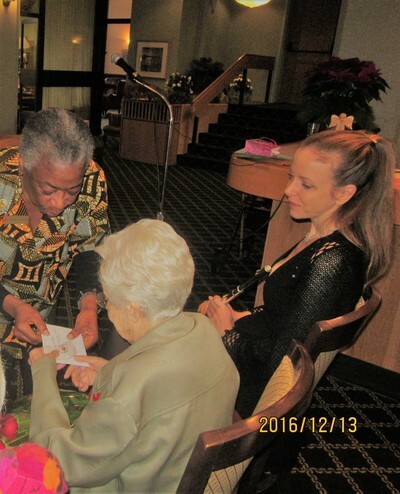 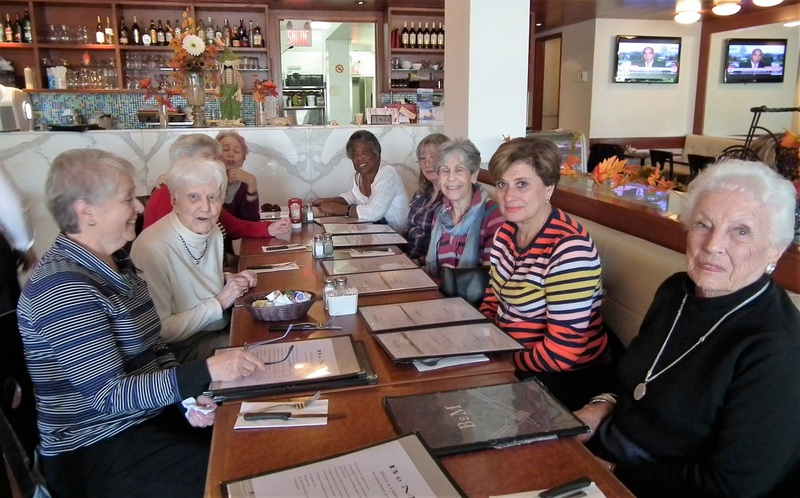 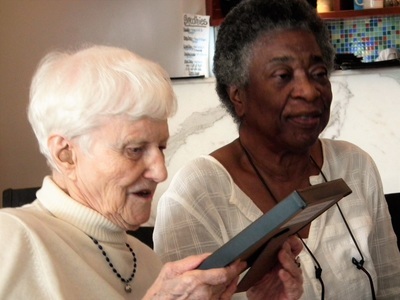 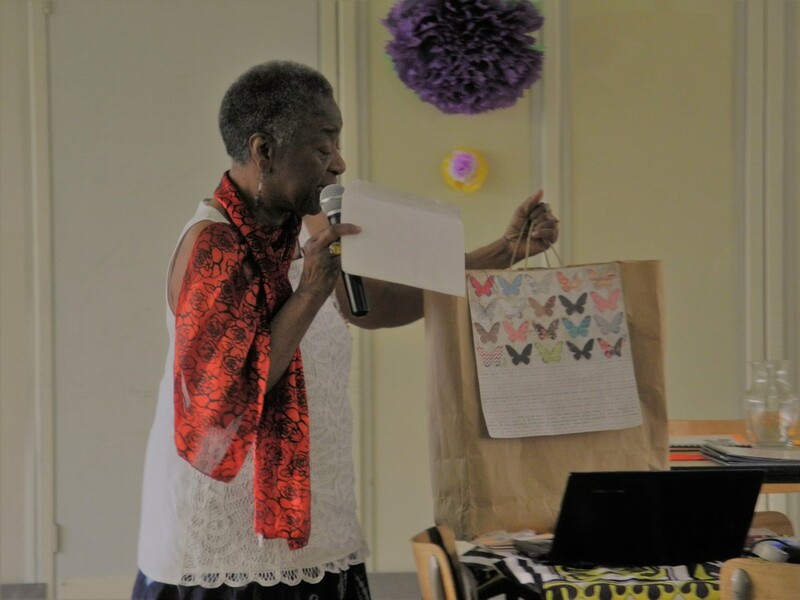 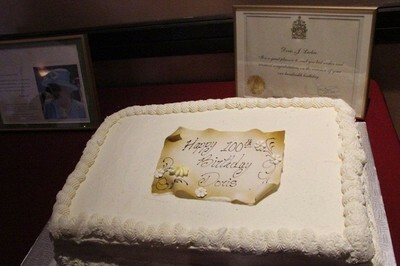 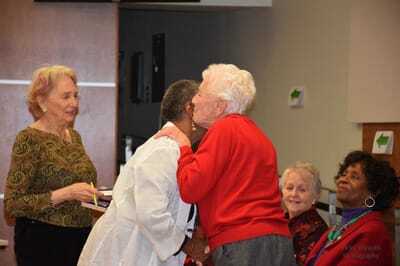 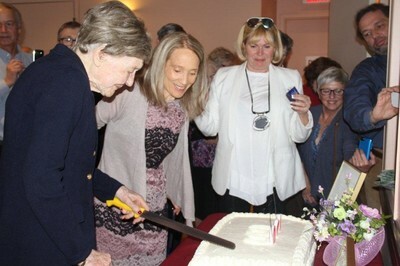 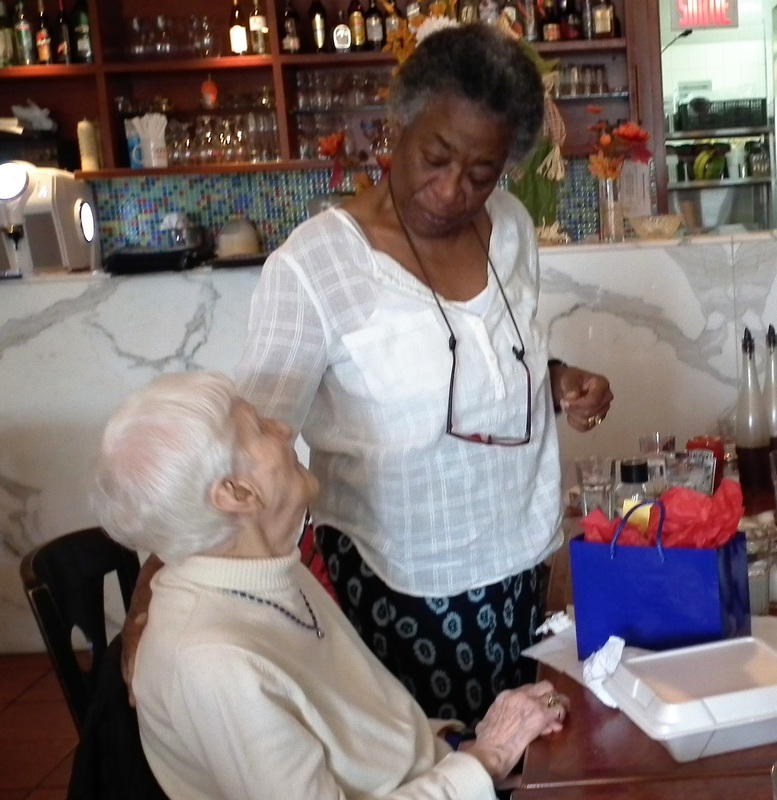 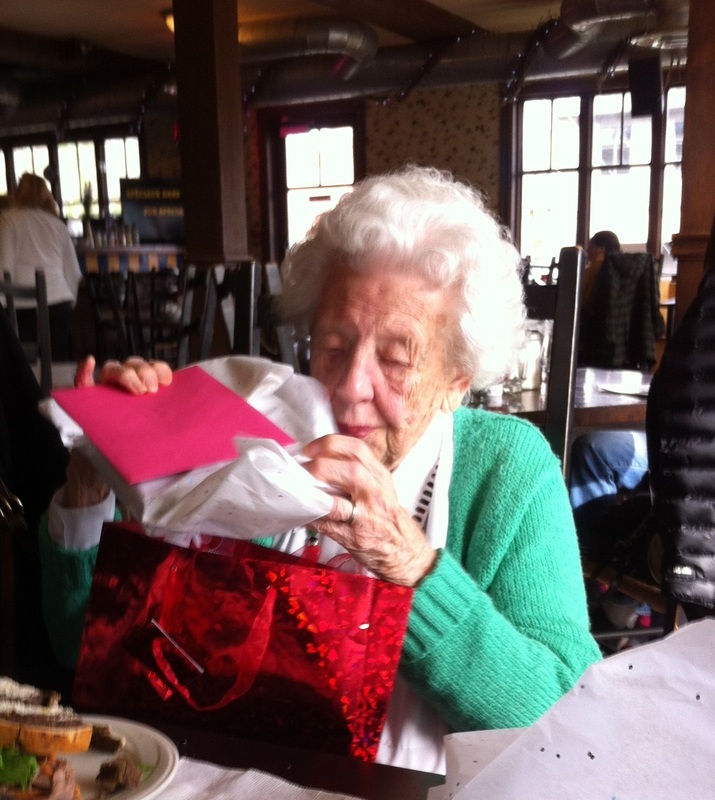 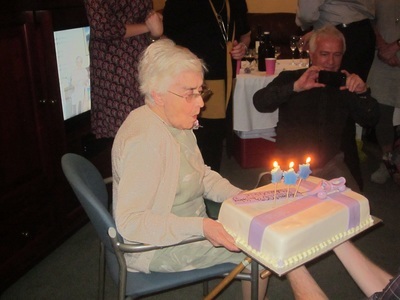 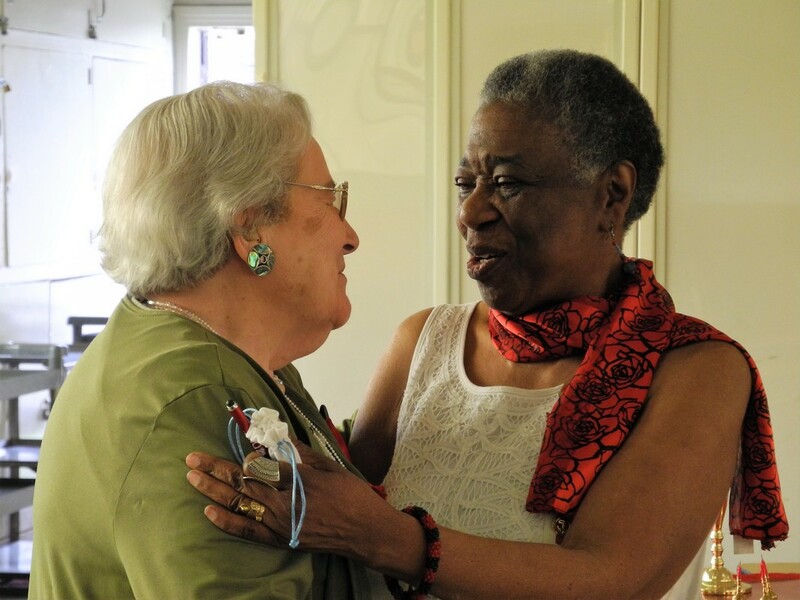 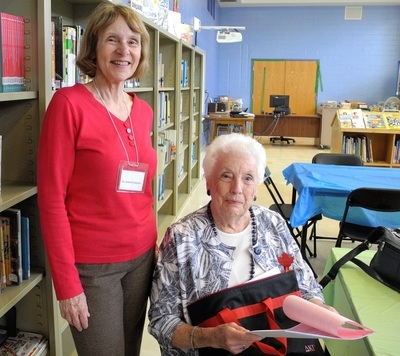 We celebrated Marianne Davis's 100th Birthday Party! This year's theme for WOTY was on suicide prevention. 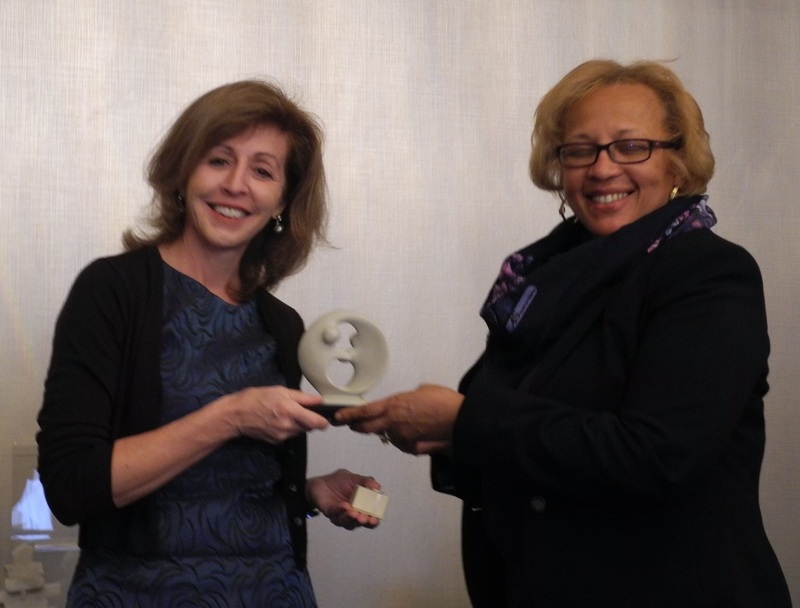 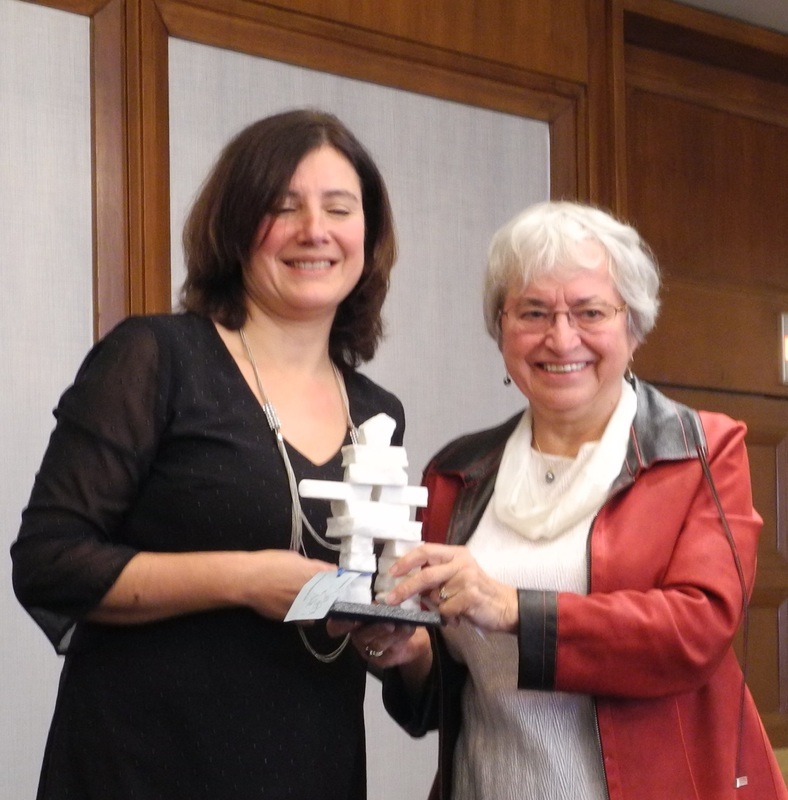 This year's award went to Dr. Seguin, a specialist in this field. 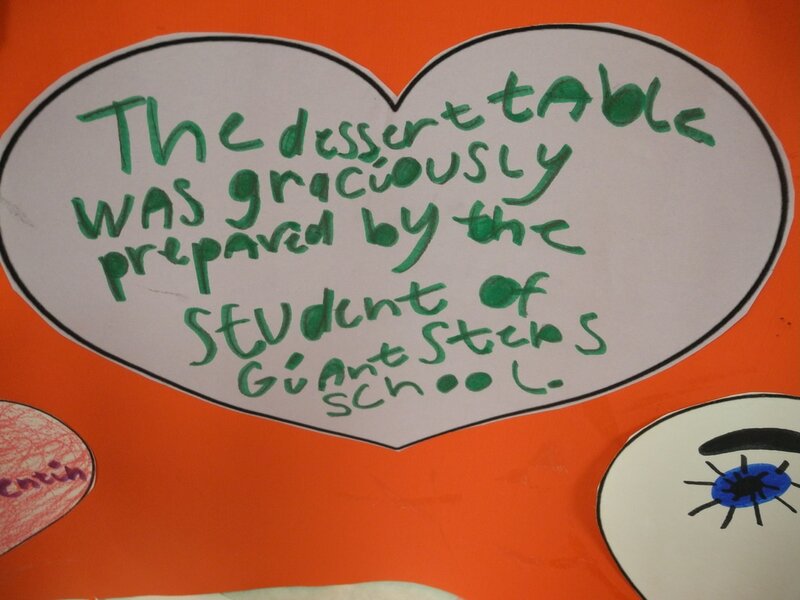 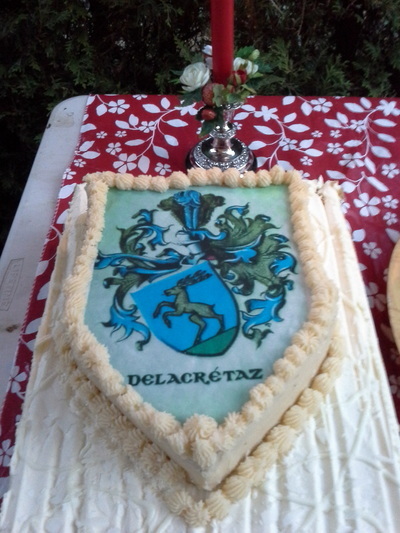 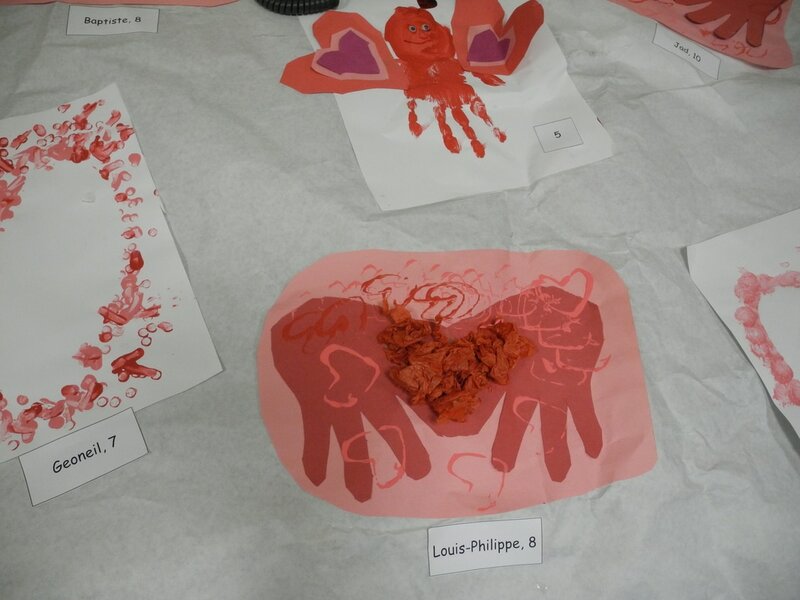 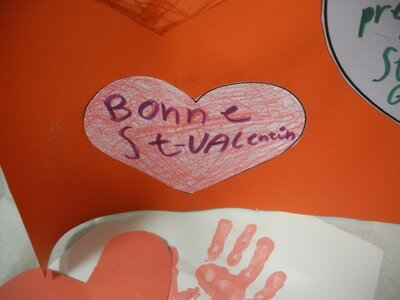 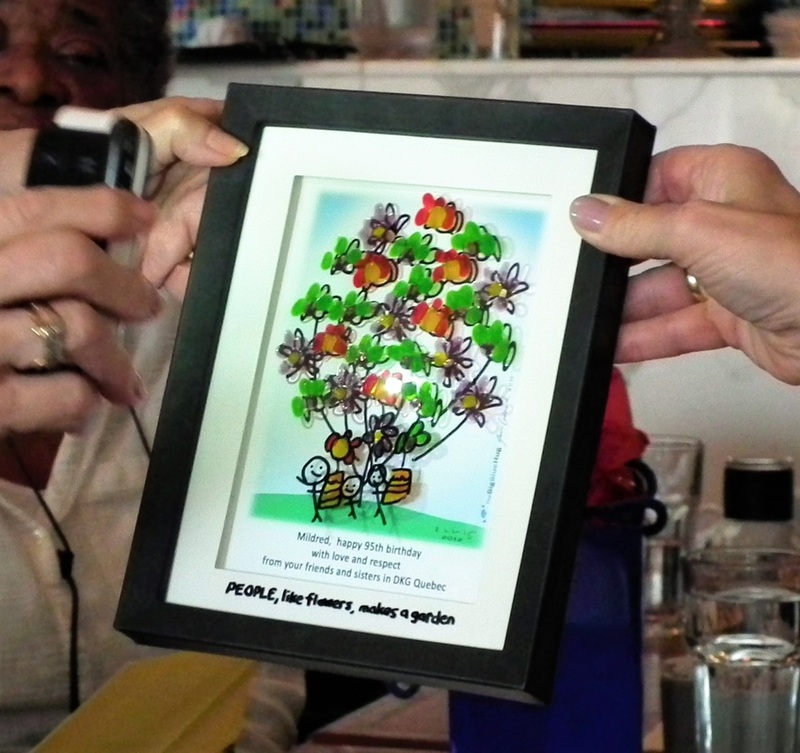 The students from Giant Steps, a school for autistic children, made a St. Valentine's Day table cloth decorated with their handprints, hearts and butterflies as well as a poste and red desserts to celebrate the occasion and to show their appreciation for the donation given to them by members of DKG Quebec. 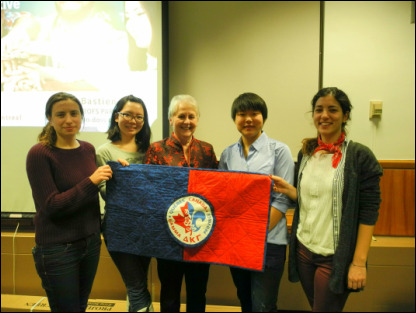 ​Five of the seven students short-listed for nomination to the World Fellowship Award accepted our invitation to join us this evening. 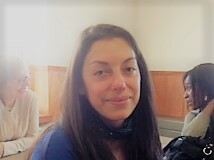 They are from left to right: Meghar Kumar from India, Doctorate in Urban Planning, Urban transport needs and priorities and concerns of the urban poor; Mina Anadolu from Turkey, Doctorate in neuroscience, Molecular underpinnings of autism in the developing brain; Gabrielle Bertier, from France, Doctorate in Human Genomics, The use of genomic data for the benefit of patients; Sharleen Gomes from India, Master's in Rehabilitation Science, Orthopedic Physiotherapy to improve the walking mechanism following hip replacement; and Ibukunoluwa Adekoya from Nigeria, Master's in Counselling Psychology, Career development experiences of immigrant women from African countries. ​Barb Angus, Chair of the Scholarships Committee, is pictured left of the women, and our President, Beverly Townsend, is on the extreme right. Kate Arthur is from Kid Code Jeunesse, and teaches children to write codes for computer programming as early at 6-7 years old with a program called Scratch Junior. 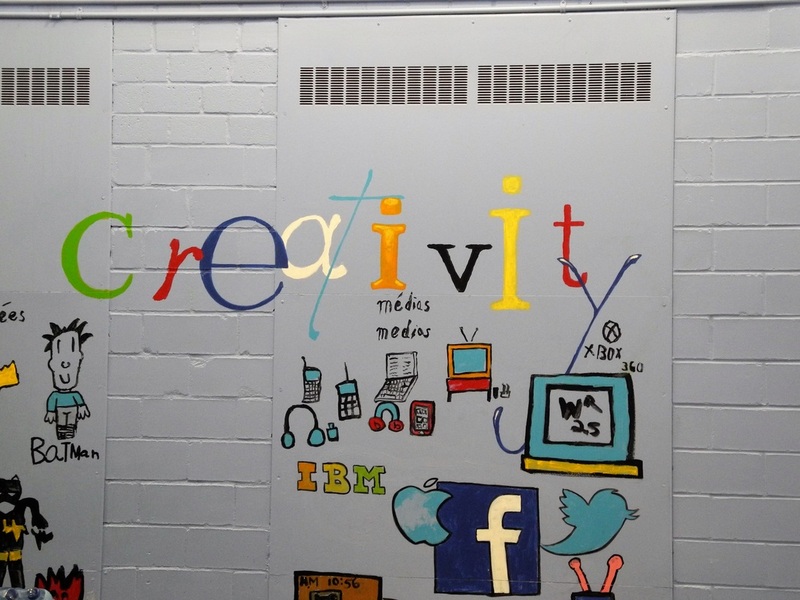 By the time they are 9-11 they are encouraged to create their own apps. 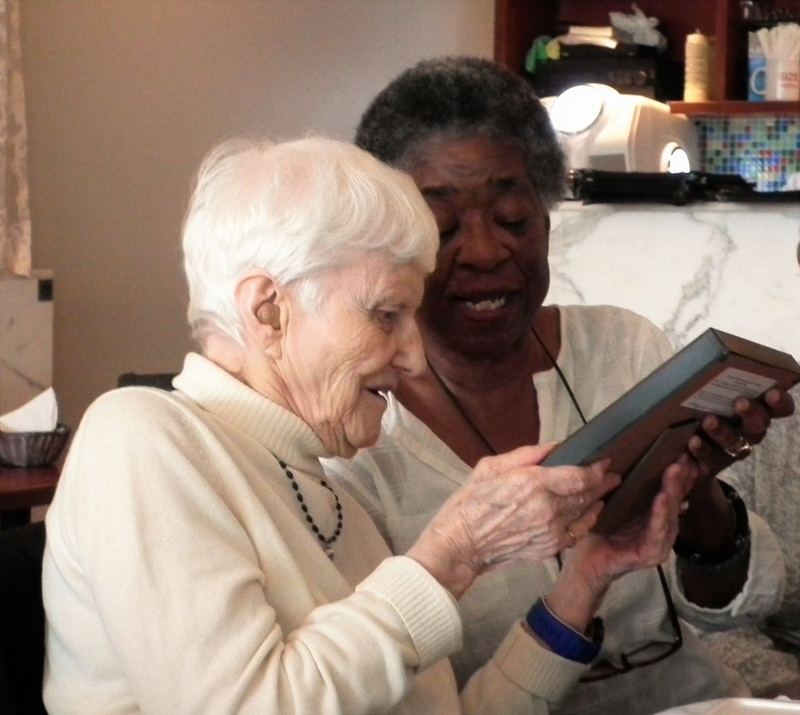 It was a very interesting meeting for the more "mature" members, who found it mind-boggling to say the least, and very exciting for the younger generation who grew up with computers as an extension of their fingertips. 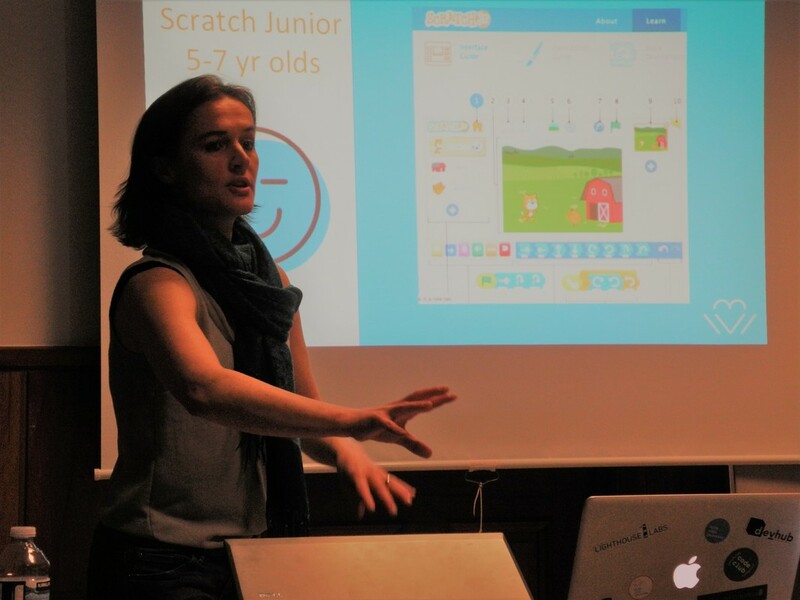 ​Kate pointed out that jobs seekers in the future will need to have an extensive knowledge of programming skills as most of our appliances, cars, and most household items will be run by computers, and their maintenance and repairs will be made by technicians who are savvy in that field. 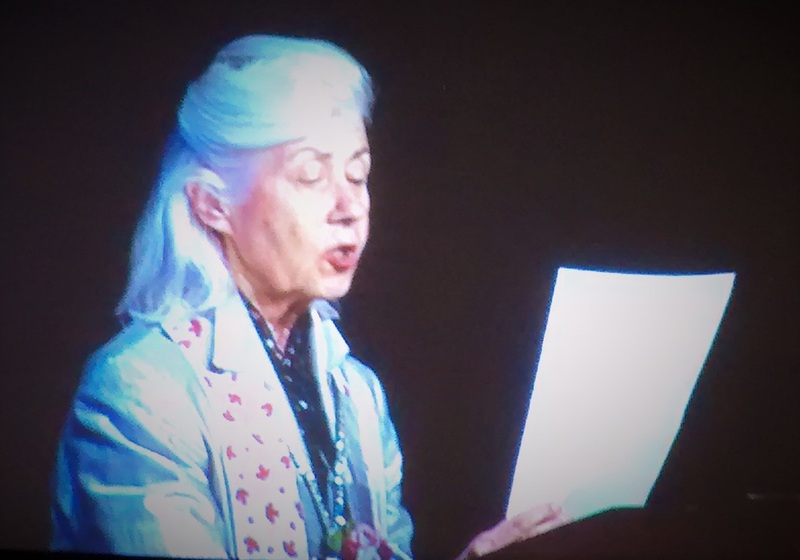 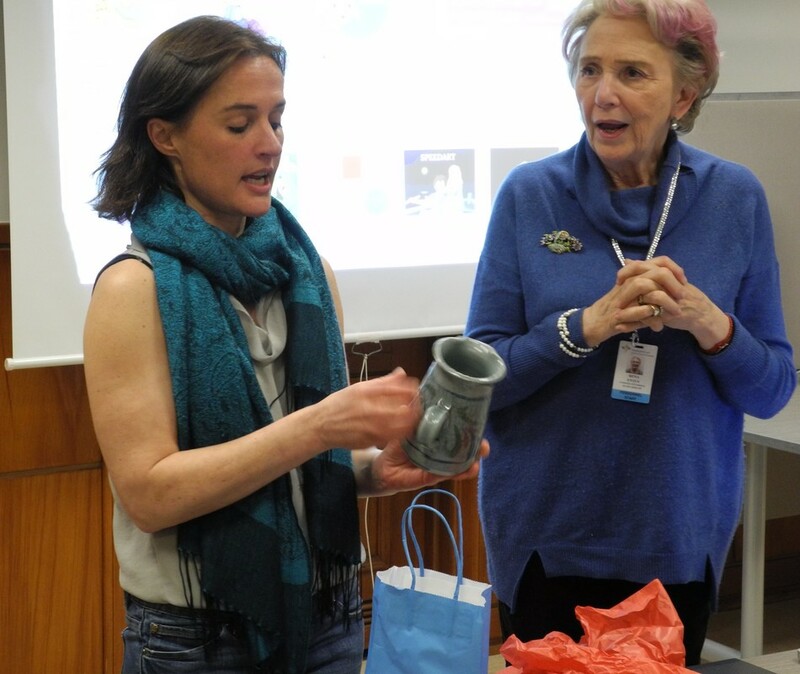 It was an interesting glimpse into the future, and Kate Arthur showed us how to get there. 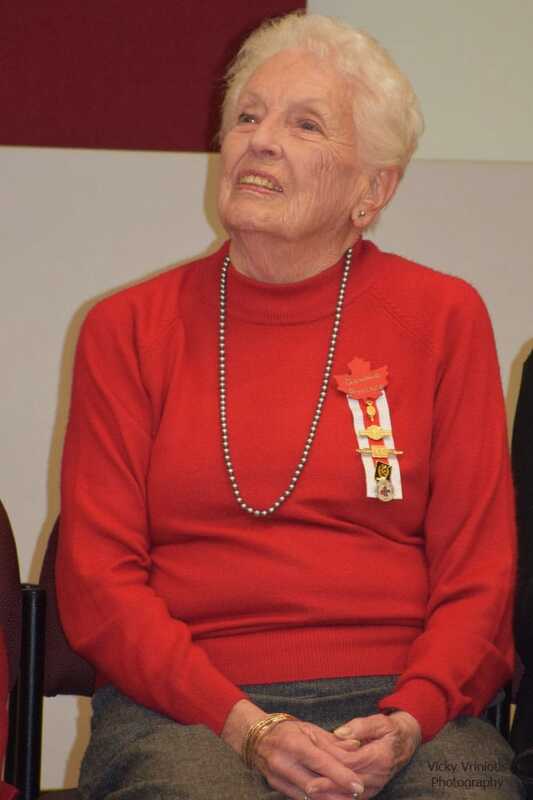 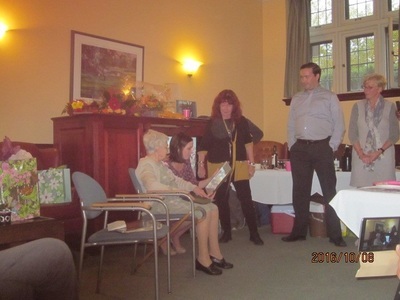 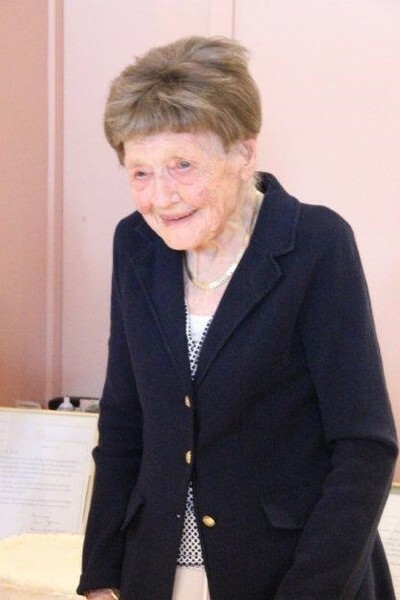 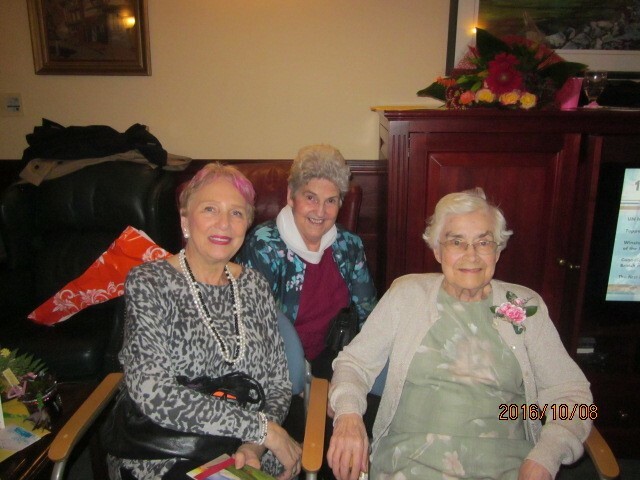 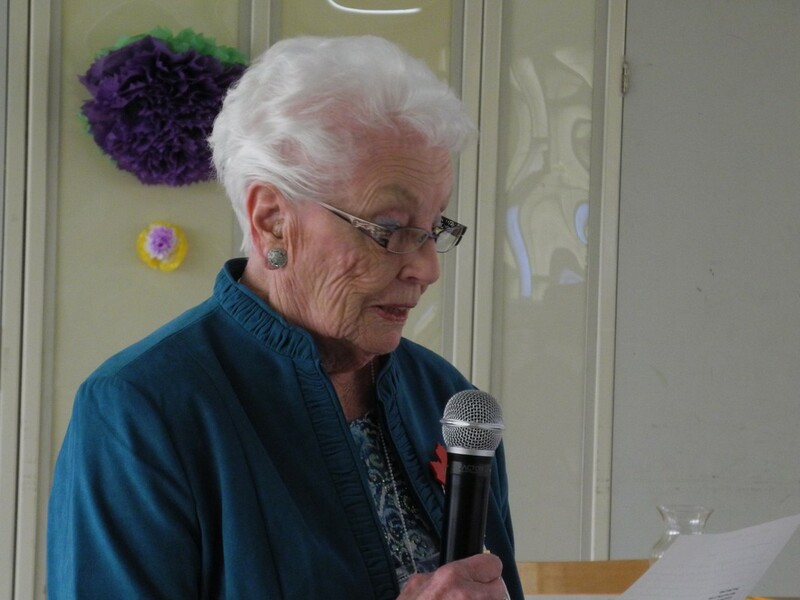 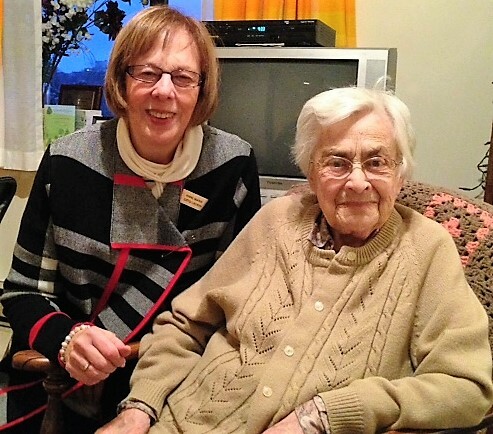 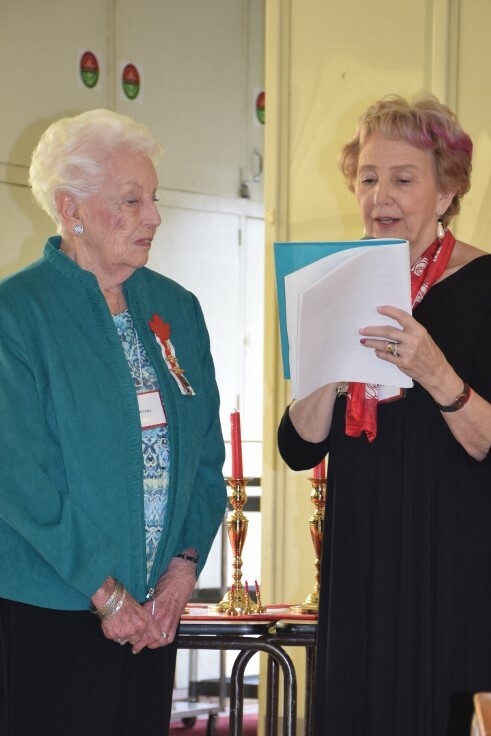 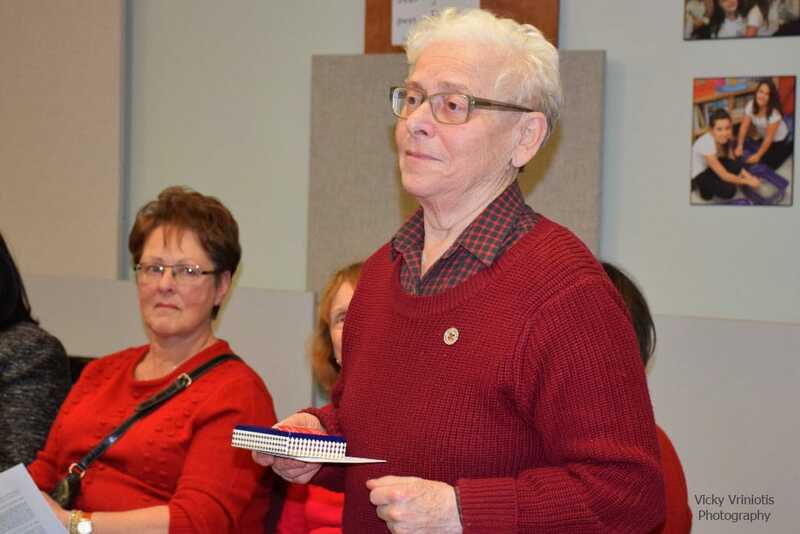 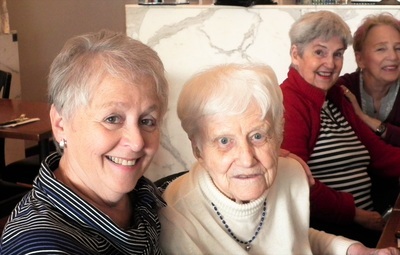 Beryl Ball, Phyllis Bennett and I had the pleasure of attending the 100th birthday of Doris Leckie on March 26th at St. John the Baptist Church in Pointe Claire. 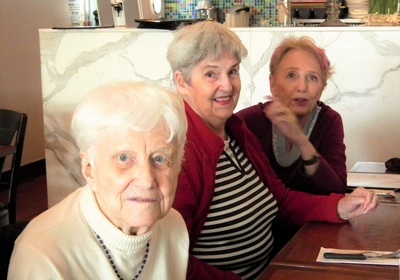 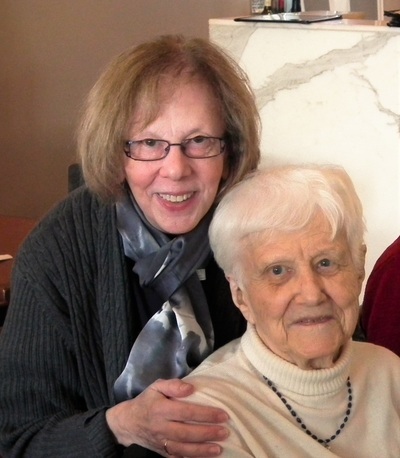 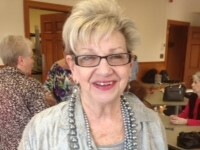 Doris, a longtime member of DKG, moved last year to California to live with her daughter Annie and her family. 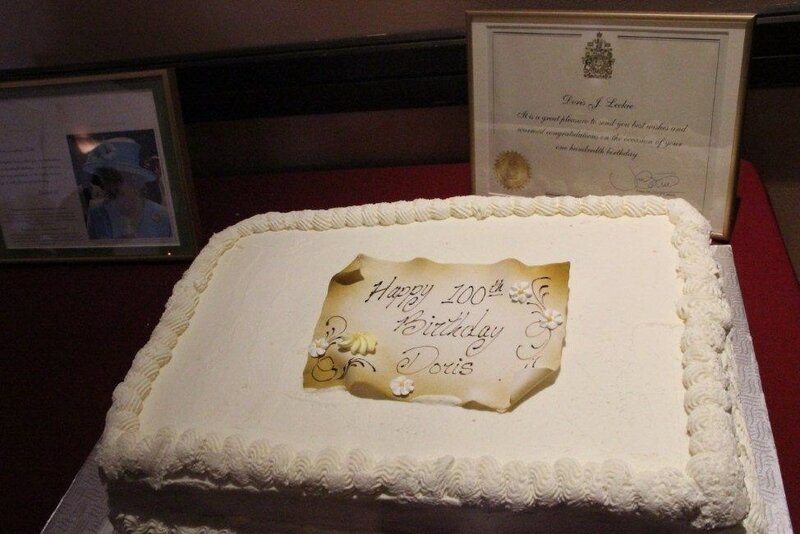 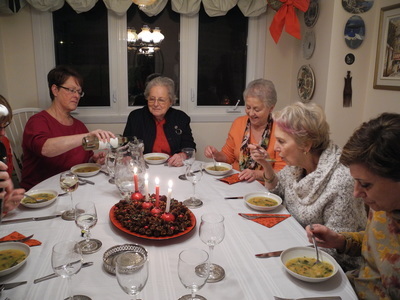 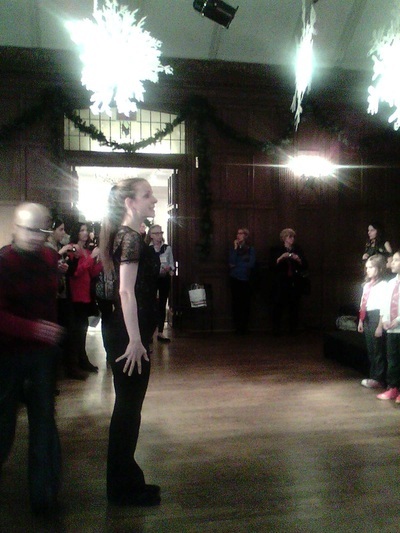 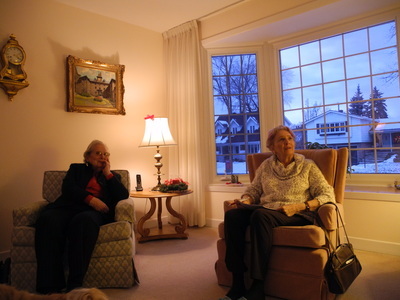 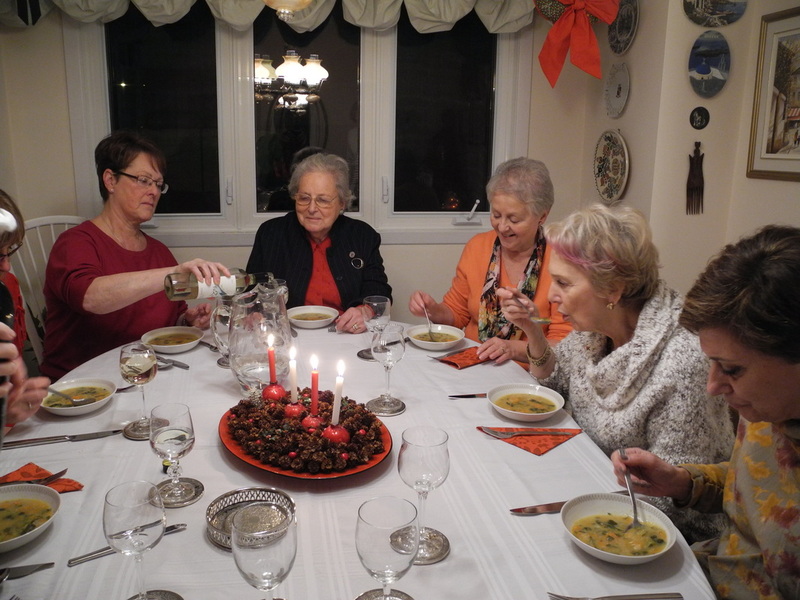 For this celebration, the extended family all returned to Quebec to help Doris truly enjoy this memorable event. 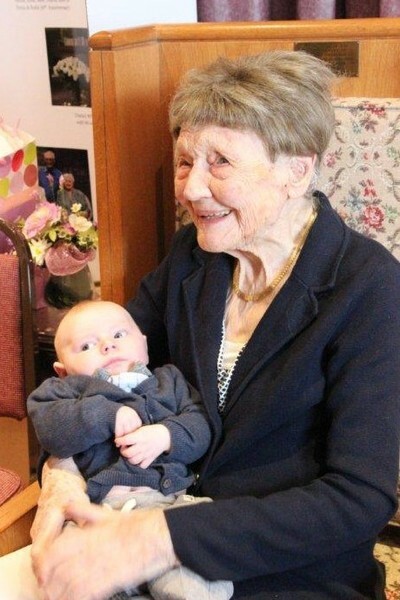 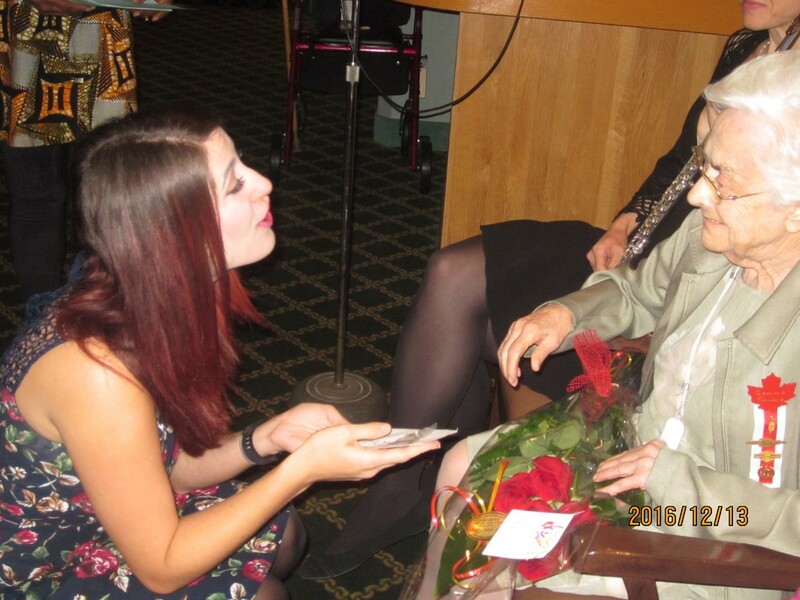 And what an afternoon it was as Doris greeted over a hundred well-wishers in the church hall! 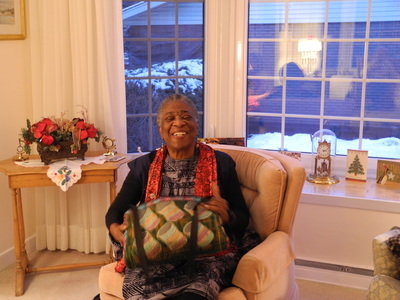 Being a hundred she was honoured to be able to meet and greet everyone as she sat in the Bishop’s tapestry covered chair. 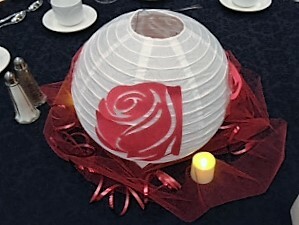 I believe this is the first time that it was ever used for such an event! 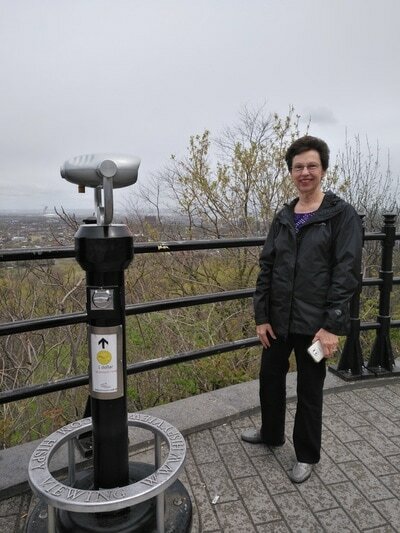 I am currently in my 4th year of my PhD studies at McGill University and I am approaching the final stages of my research, which is centred on the genetics of a rare, paediatric cancer predisposition syndrome. I feel incredibly honoured to have been selected as a recipient of the DKG World Fellowship and I would like to convey my sincerest appreciation to the Society for their recognition. 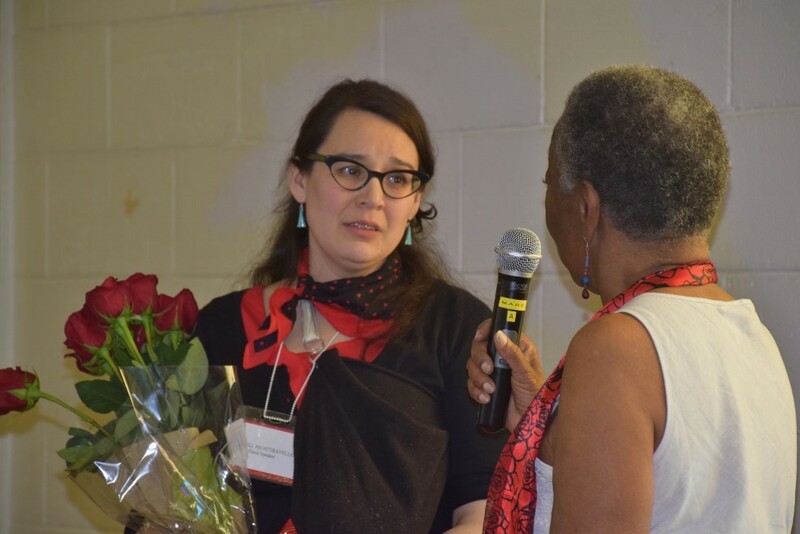 Winning the fellowship will afford me financial security for the remainder of my PhD as it will subsidise my tuition costs and in so doing, will allow me to focus more fully on my research and the compiling of my thesis. 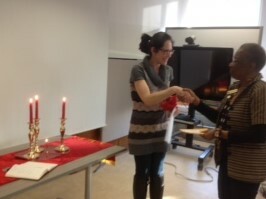 It is a vote of confidence that has given me extra motivation to persevere and work towards achieving my research and career goals. 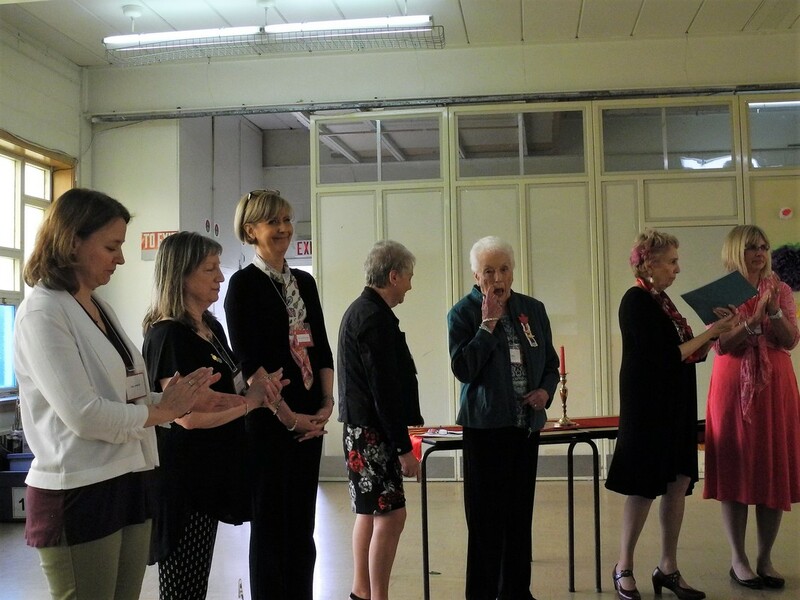 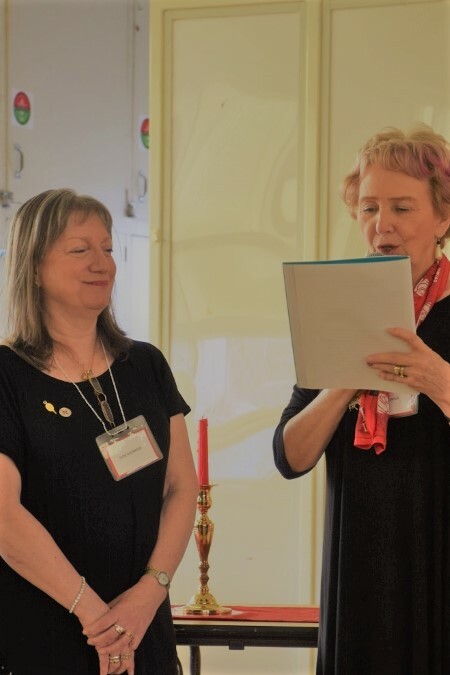 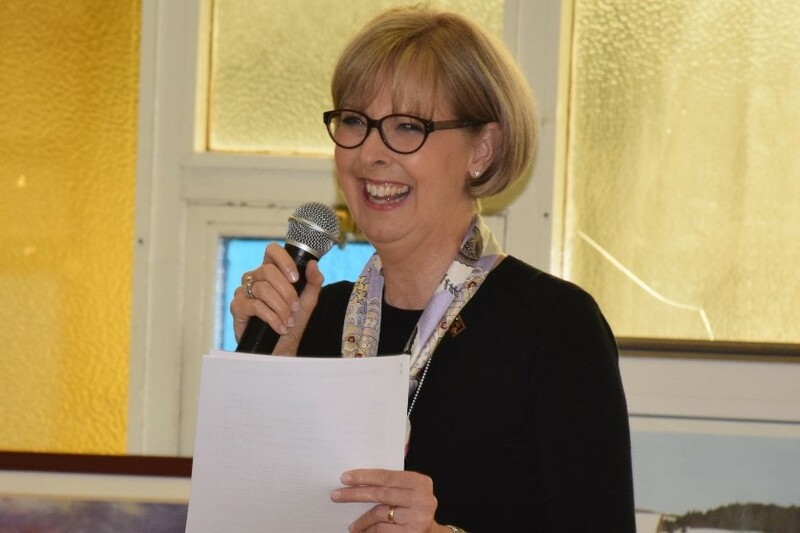 Thank you, DKG Society international and DKG Quebec for the honour! 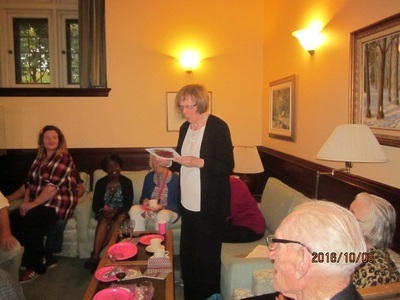 The McGill University Awards Reception is held annually to recognize the various scholarship and awards winners and their donors in the field of Education. 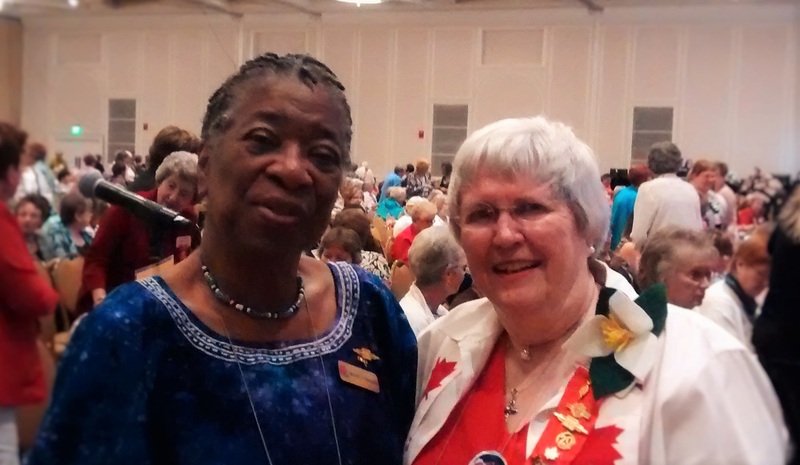 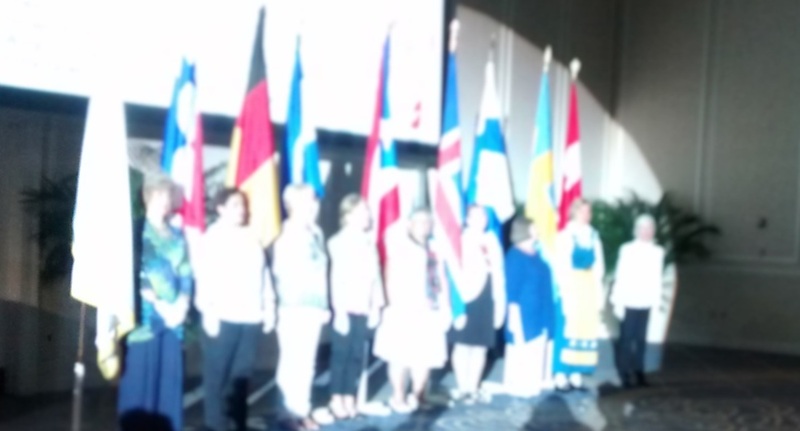 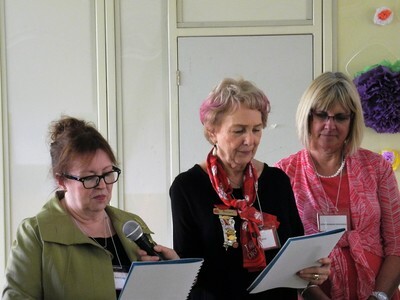 DKG Quebec supports two scholarships: the first is Dr. Mildred Burns Award for excellence in leadership. It is awarded to an outstanding student in leadership studies at the graduate level; the second is the Sarah Paltiel Scholarship given to an outstanding undergraduate student in their first year of study in the field of education. 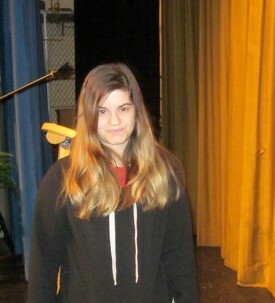 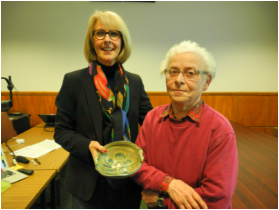 Unfortunately, our Sarah Paltiel award winner, Emily Mennard, was unable to attend. 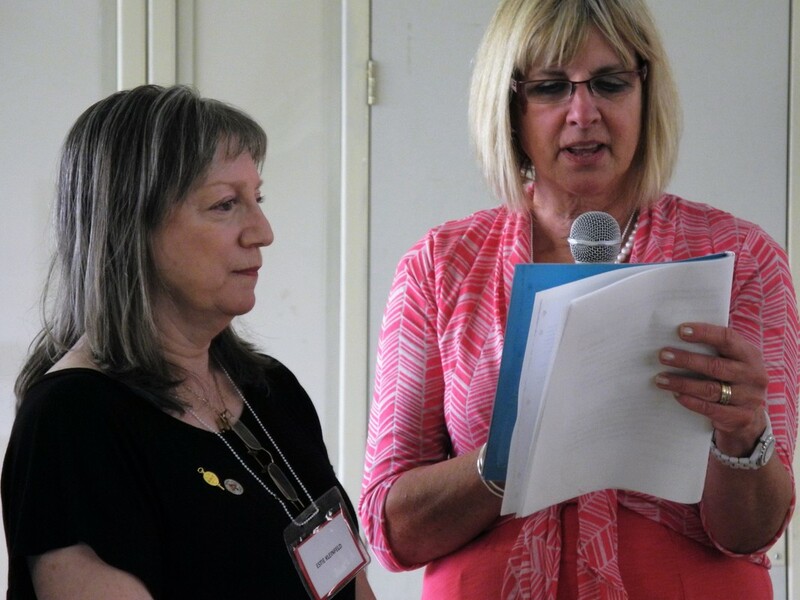 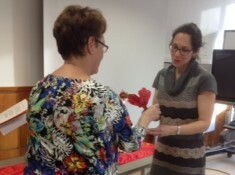 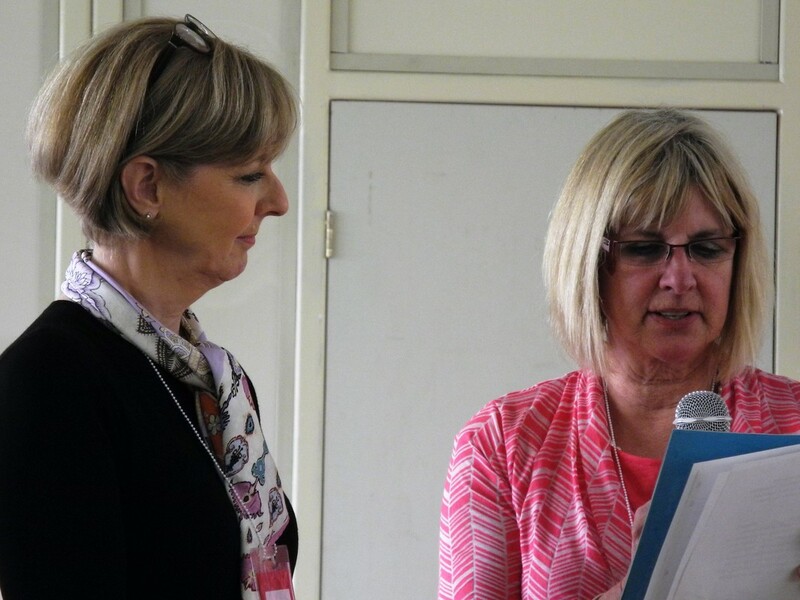 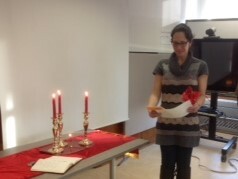 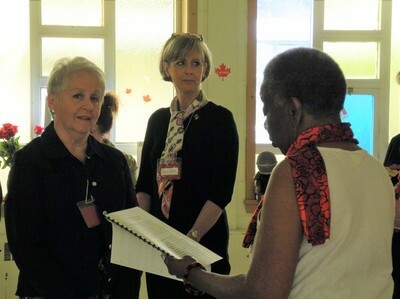 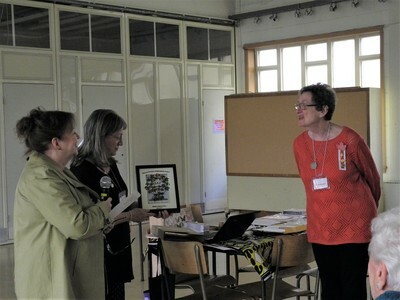 She sent a letter of apology to DKG Quebec with great appreciation for the award. 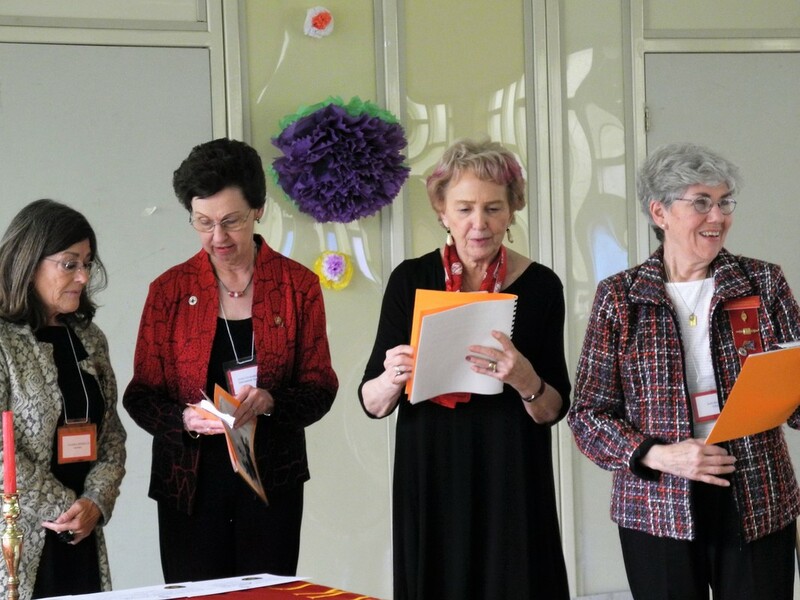 A more eligible version will be included in The Gamma Gamut. Last night's meeting was my last general meeting of my presidency and it was indeed memorable. 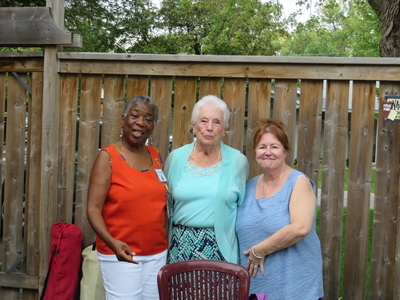 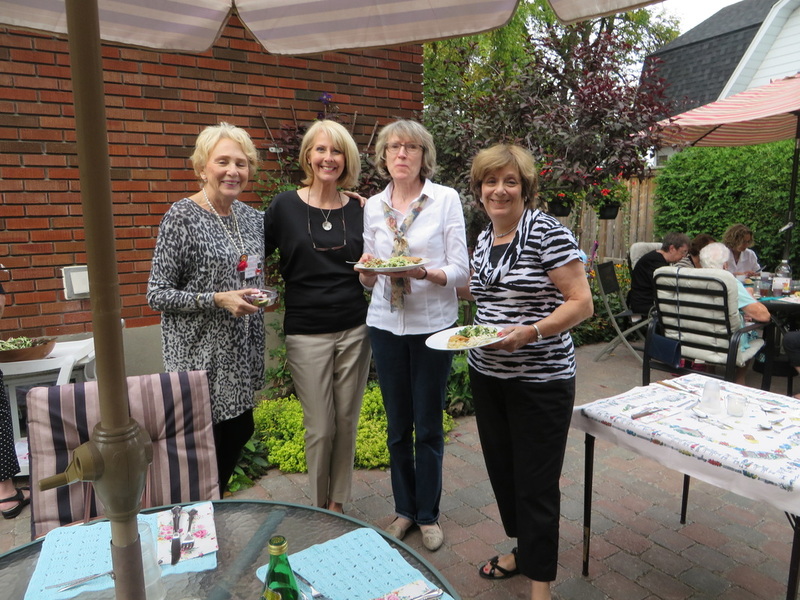 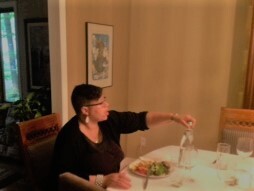 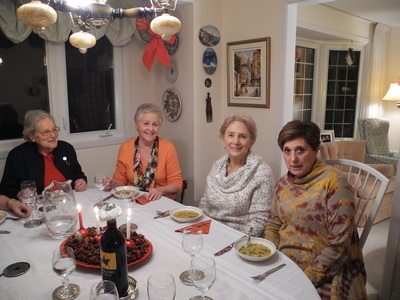 Thanks to the members of the Hospitality Committee - Robyn, Daniella, Maureen & Mona - under the leadership of Hugette Drouin, who successfully catered for 26 attendees although only 20 were expected. 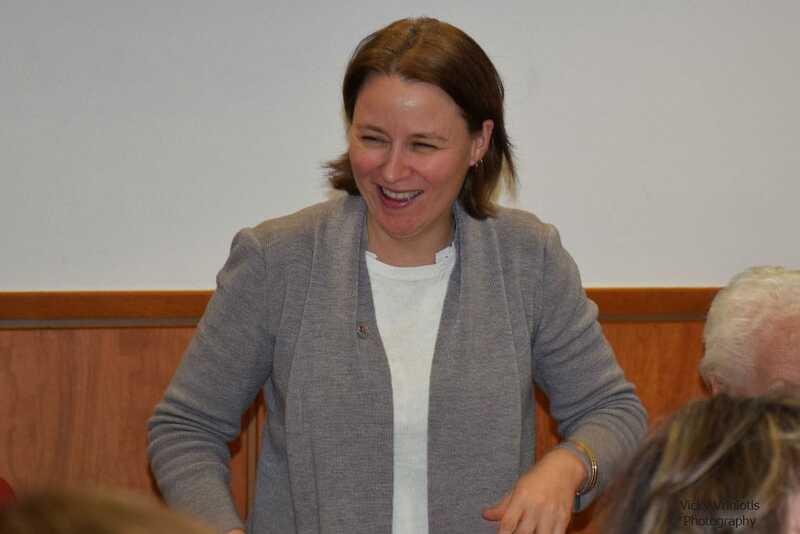 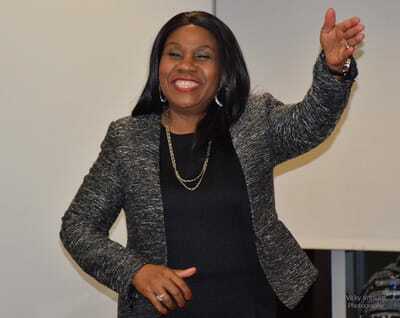 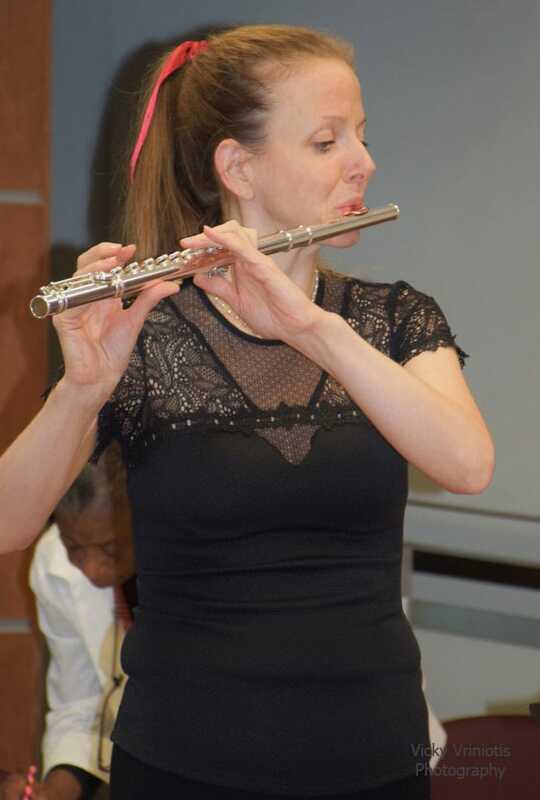 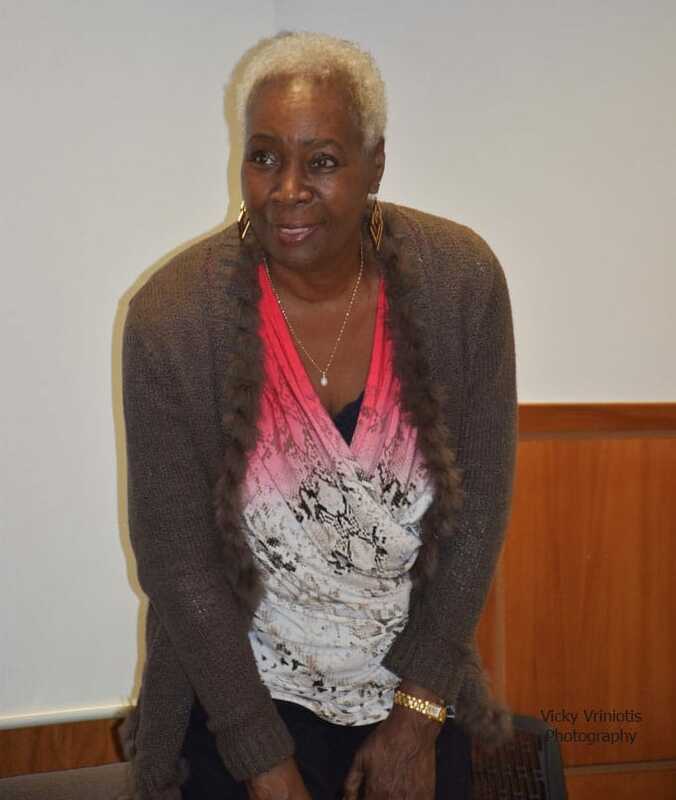 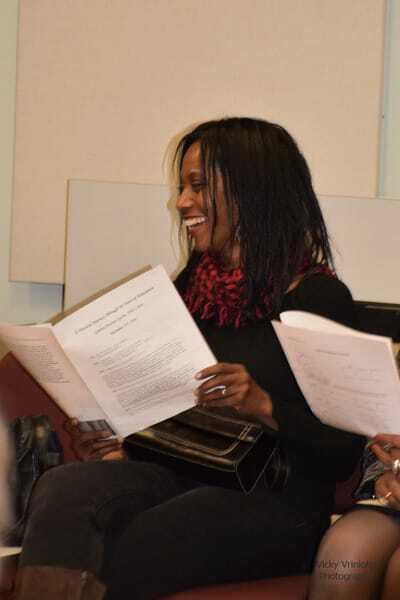 Also, due to the unexpected absence of our scheduled guest speaker, one of our guests, Iris Erdile from Giant Steps "stepped up to the plate" and carried us through some relaxation exercises she uses with her students. She became an effective substitute teacher. 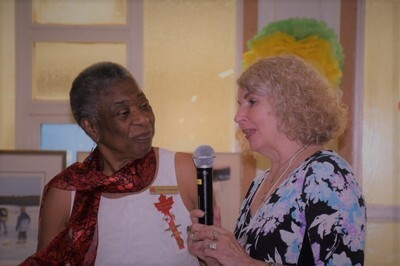 Little would she know that this morning, at 8:00 a.m. when I visited Betty Constant's class at Coronation School, the exercises which she taught us were used to prepare the class to begin their day's activities. 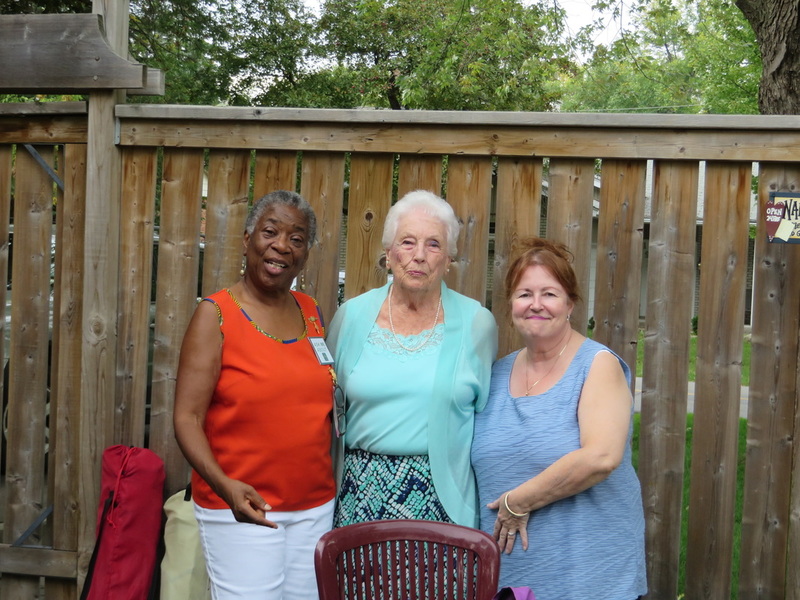 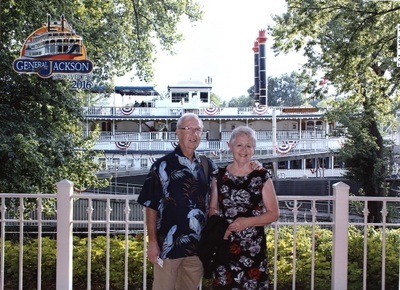 ​ We were fortunate to have a 'bevy' of returning guests and members who we have not seen for awhile which made for very warm animated exchanges. 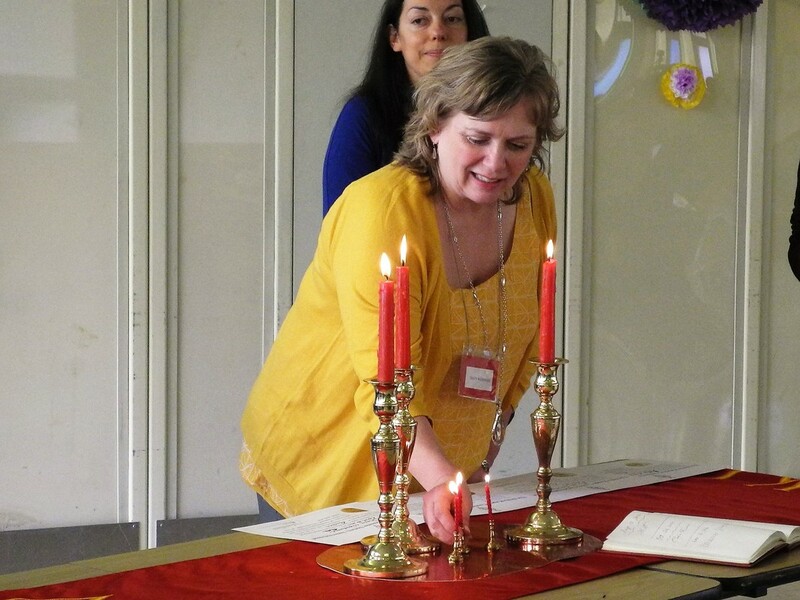 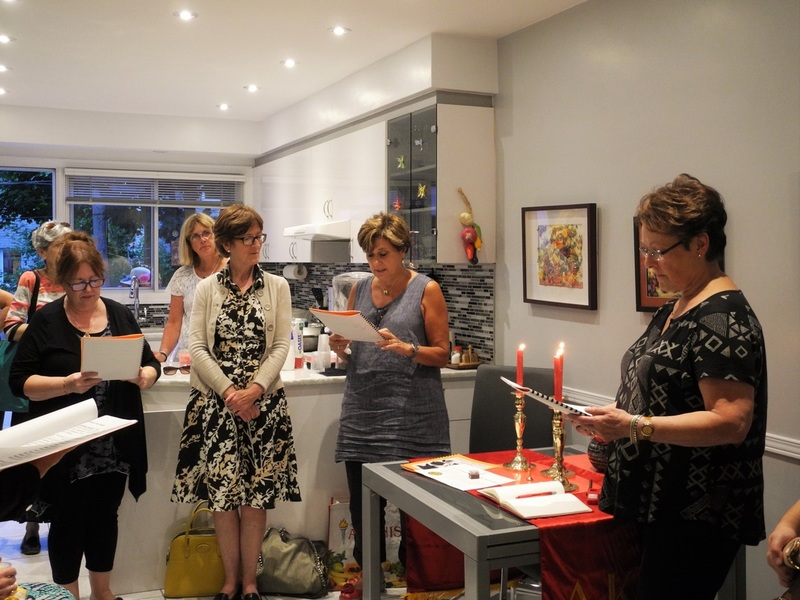 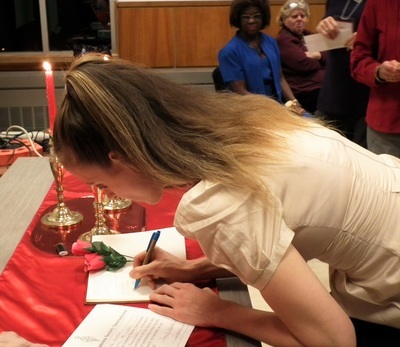 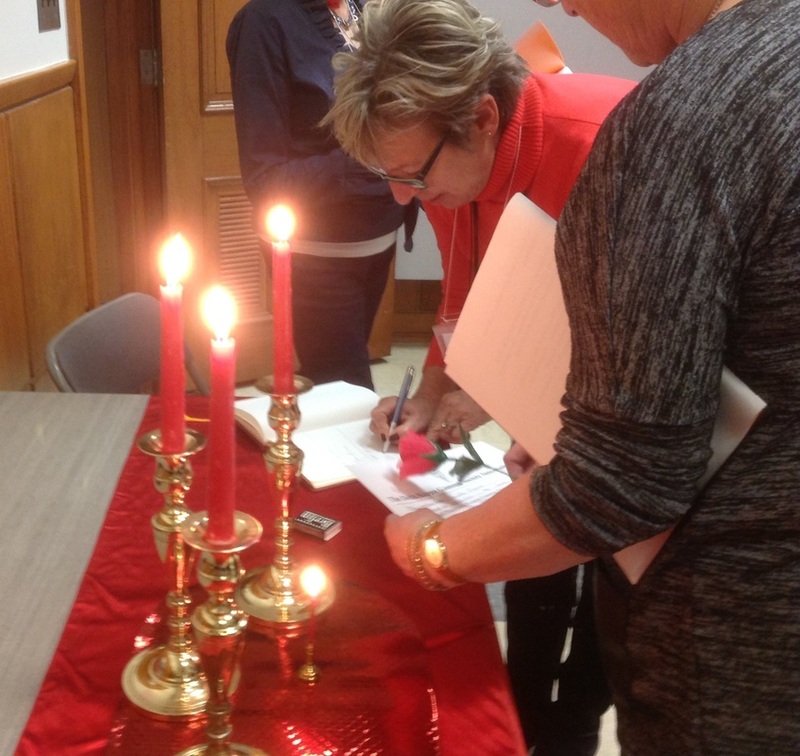 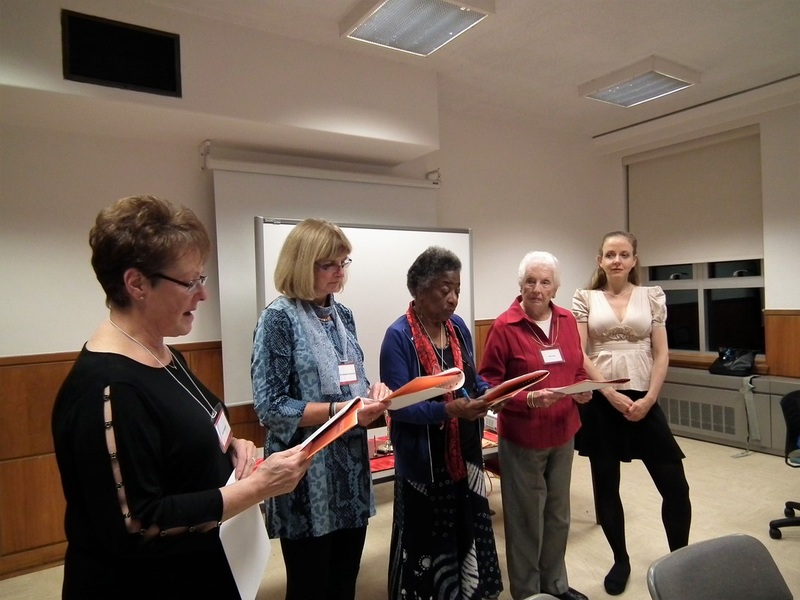 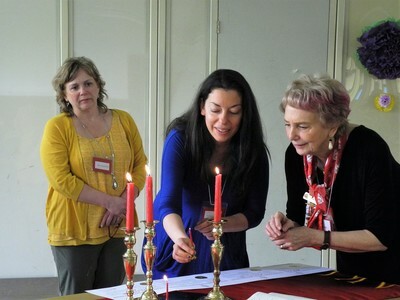 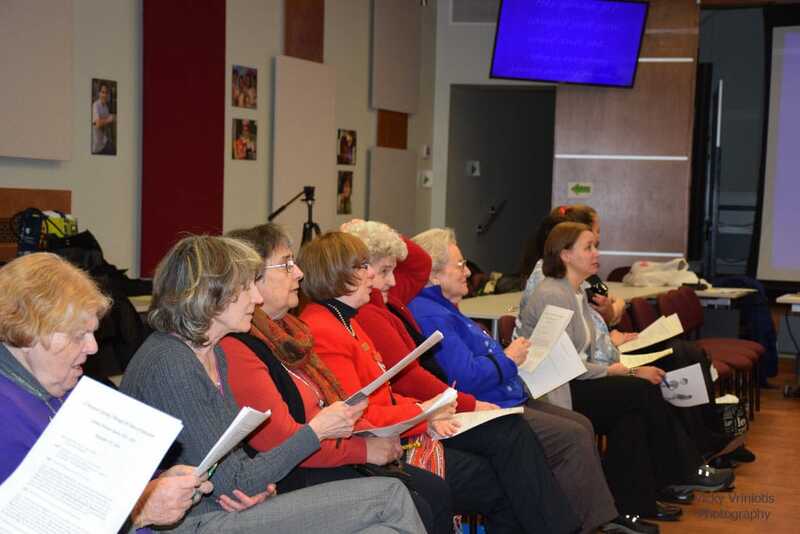 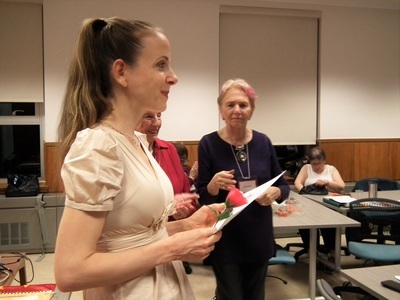 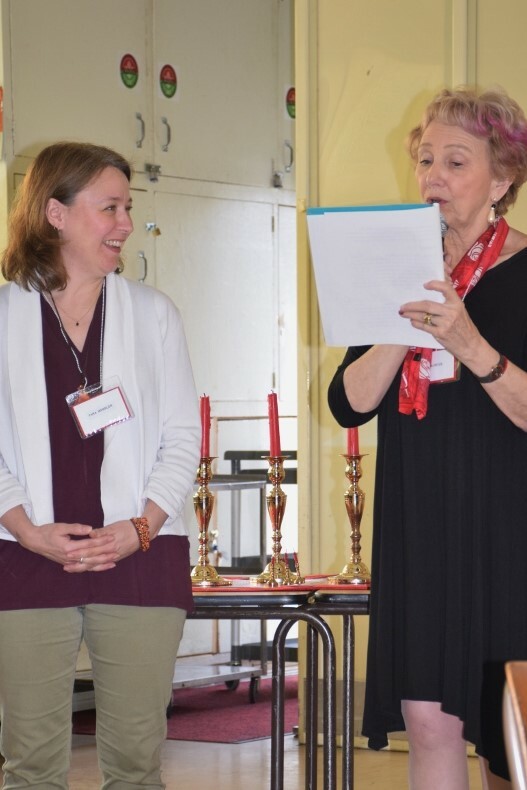 ​ With her initiation last night, we welcome Susan Strunc, a Lindsay Place music teacher, as our newest DKG Quebec member. 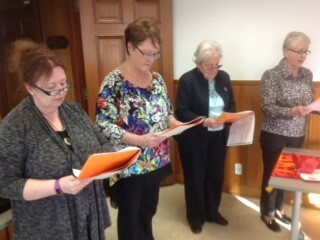 Also present, were four (4) prospective members whose initiation will take place at the May 6 Convention & AGM. 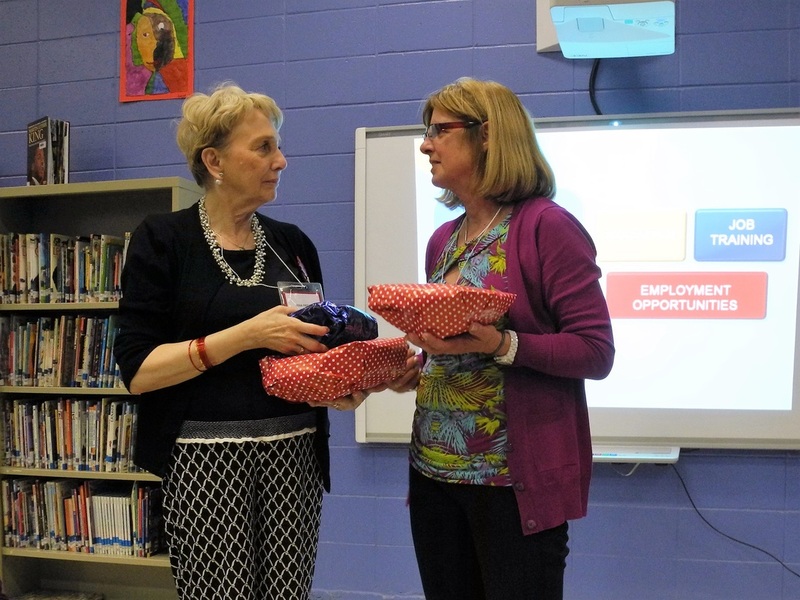 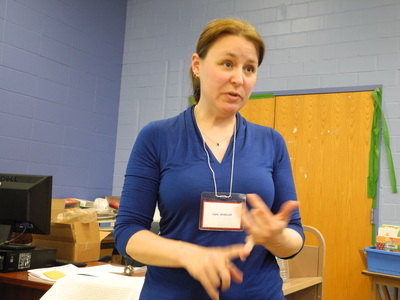 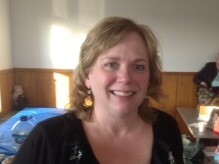 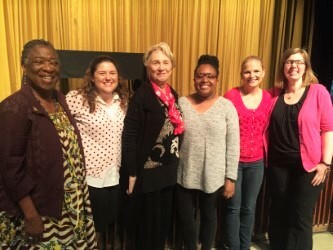 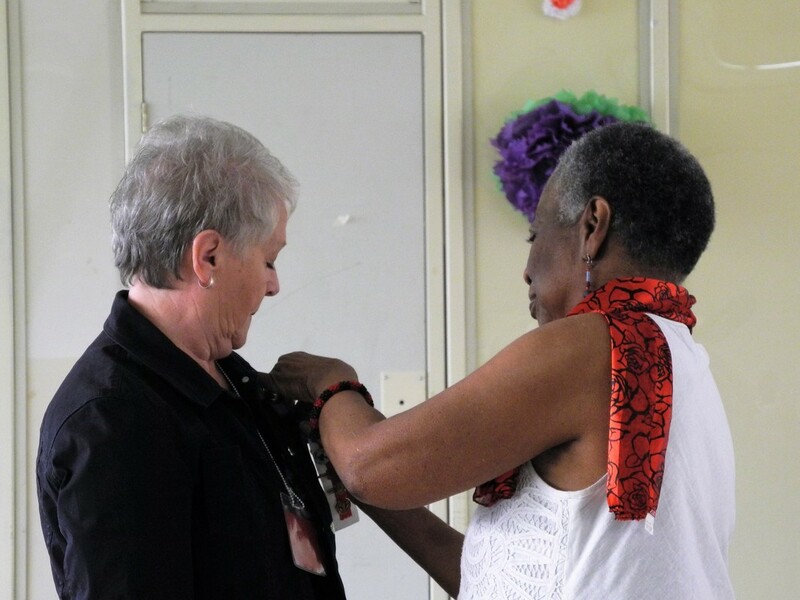 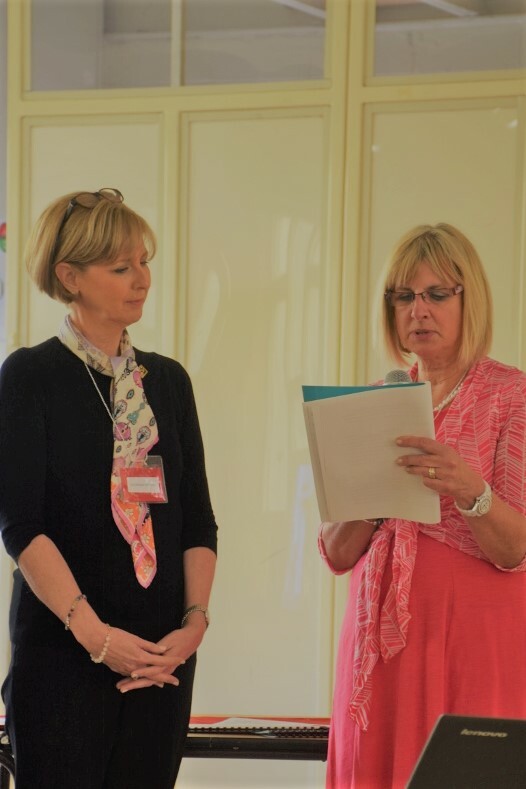 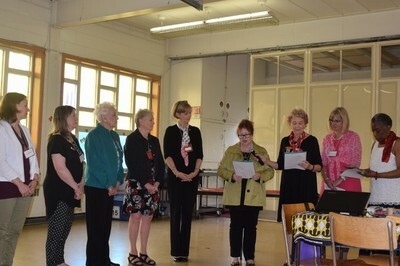 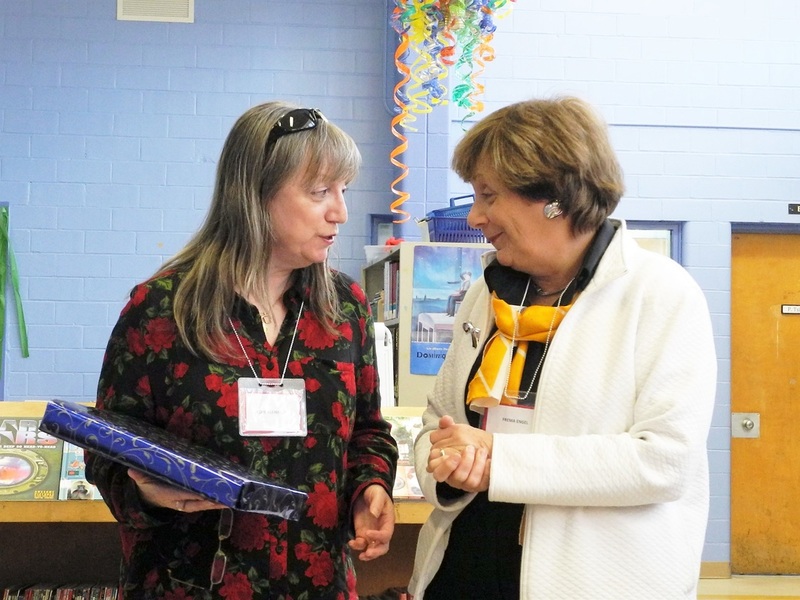 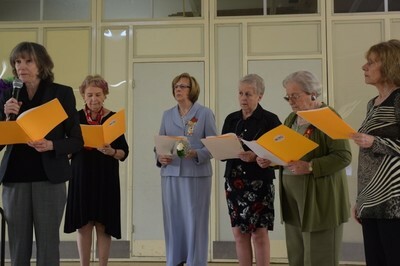 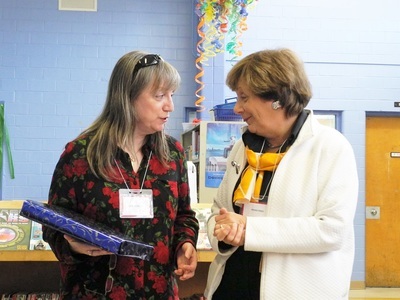 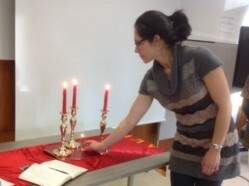 Susan Stunc, a teacher at Lindsay Place High School, was initiated on April 24th. It is always a moving ceremony, very solemn and poignant Three tall candles represent the three pillars of our society: Friendship, Helpfulness and Loyalty. 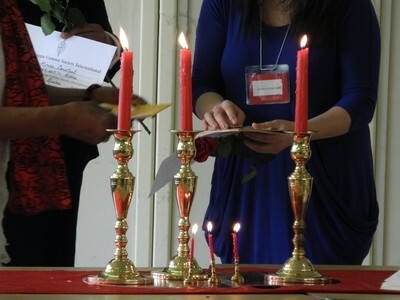 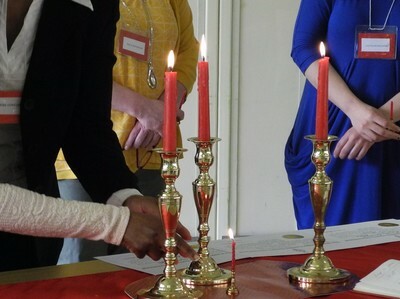 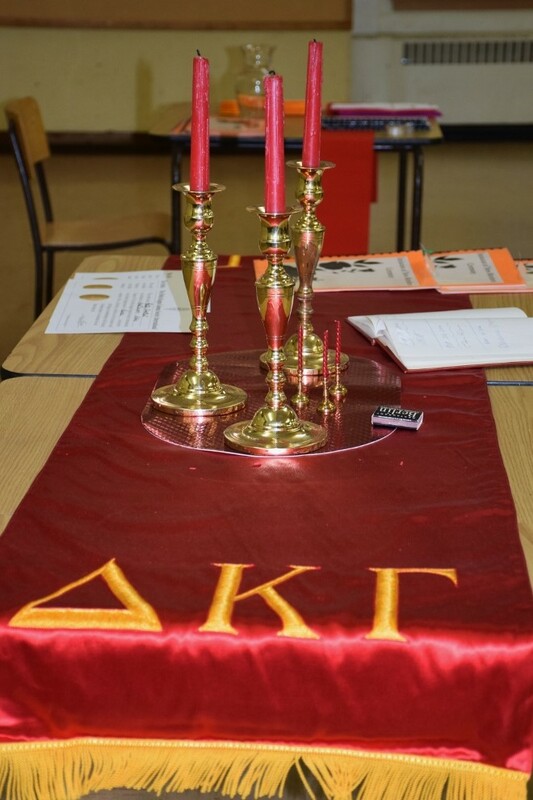 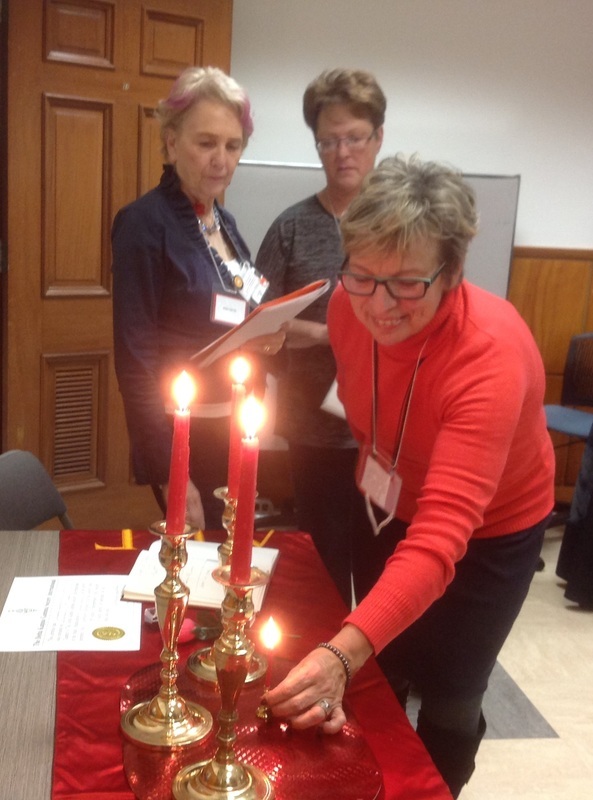 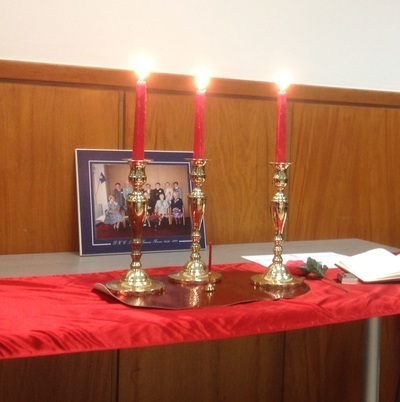 By lighting the smaller candle from one of the three lit flames, the initiate signifies her willingness to accept DKG values. 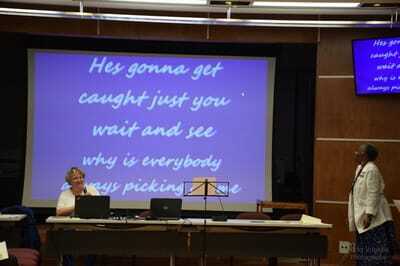 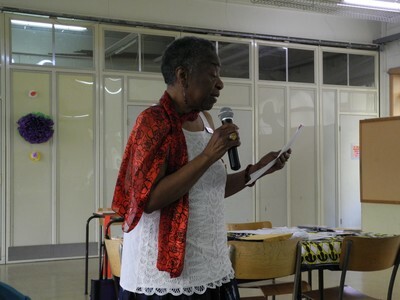 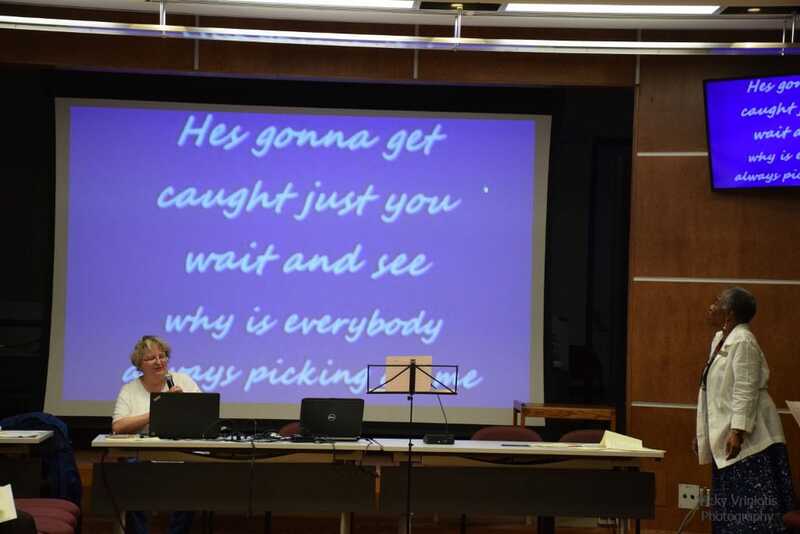 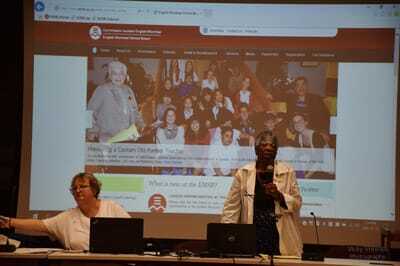 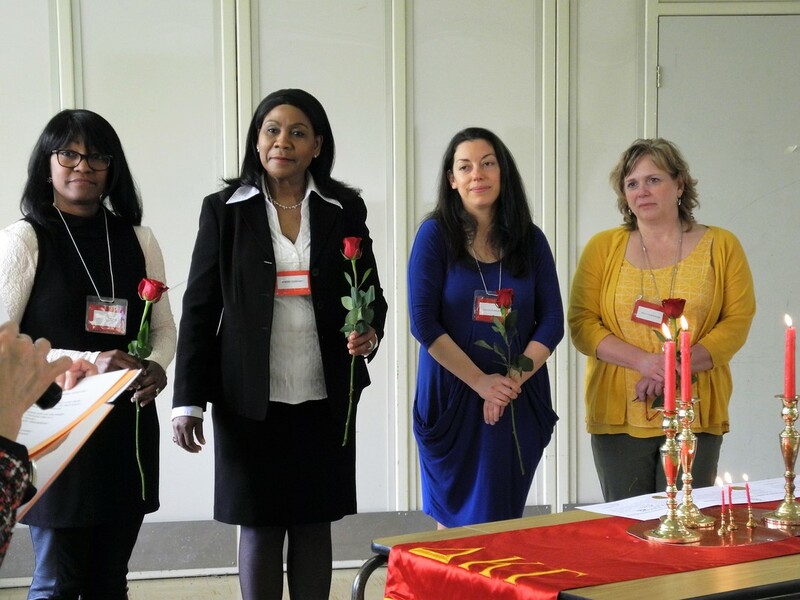 We held our May Convention and Annual General Meeting on May 6th. 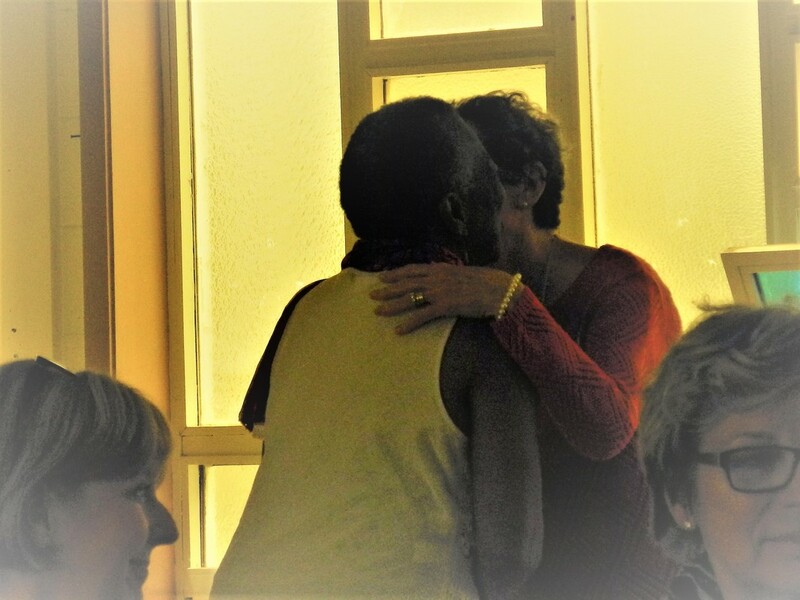 ​It was a fun-filled and very emotional day as we bade a final farewell to Marianne Davis, with her great-nephew, David Morgan, in attendance. 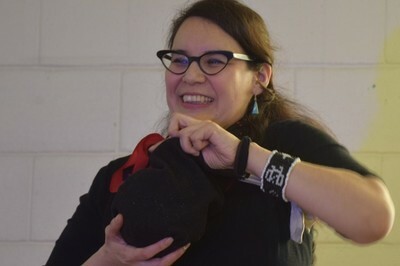 We also shed many tears as we listened to Cheli Nighttraveller speak about the aftermath of the Residential Schools across Canada and the lasting devastation that will take many generations to overcome the emotional scars. 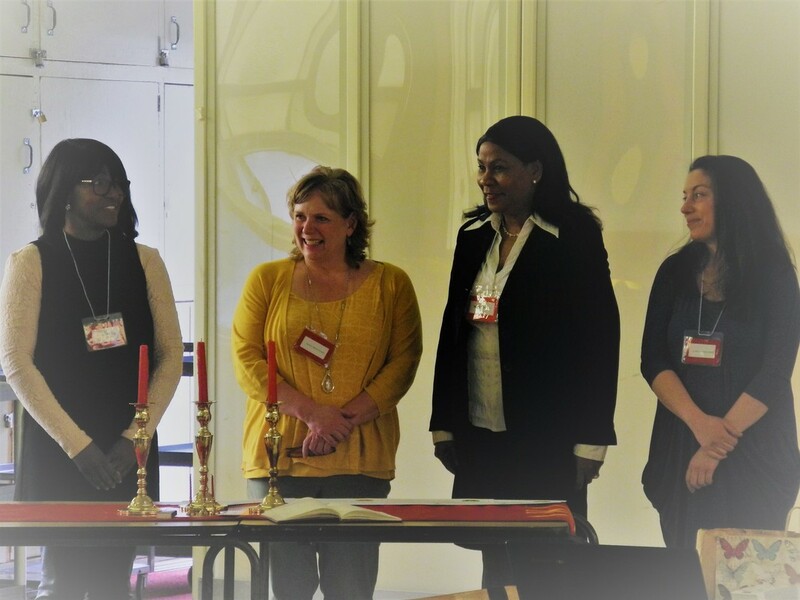 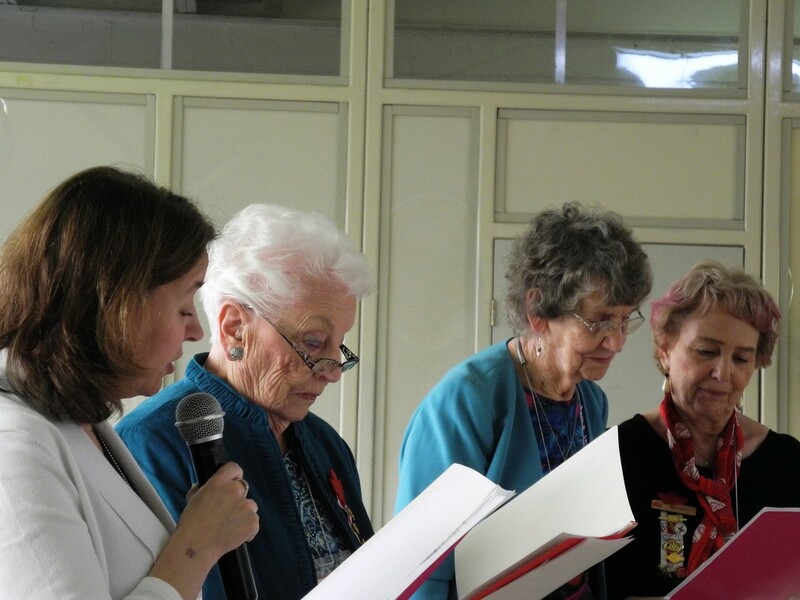 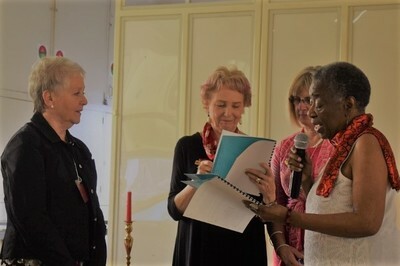 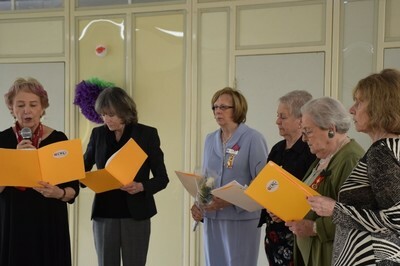 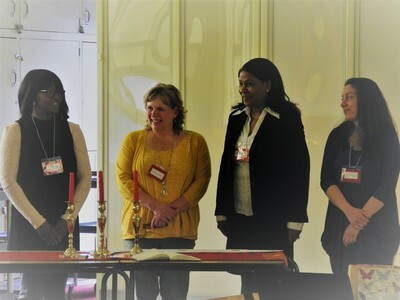 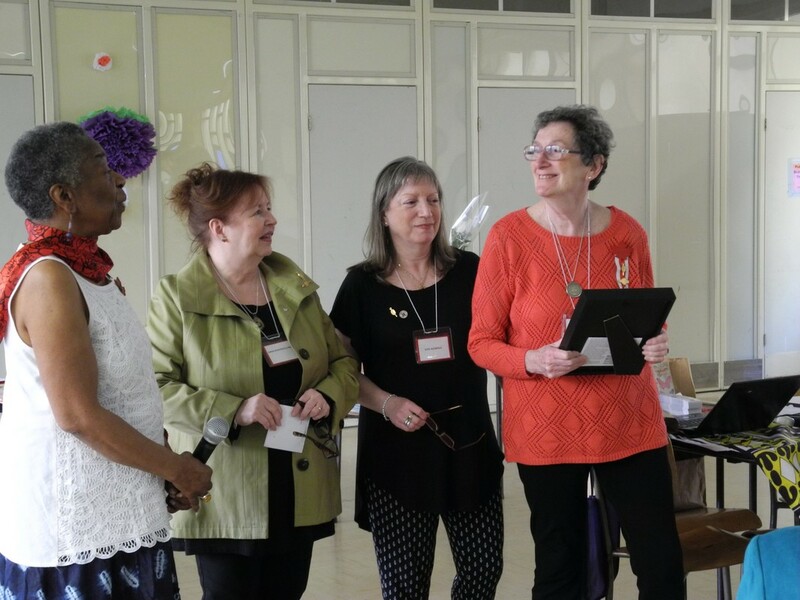 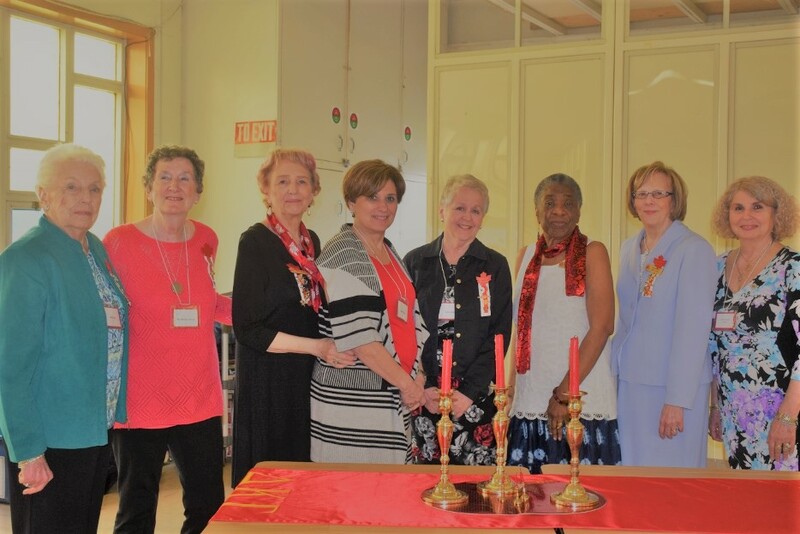 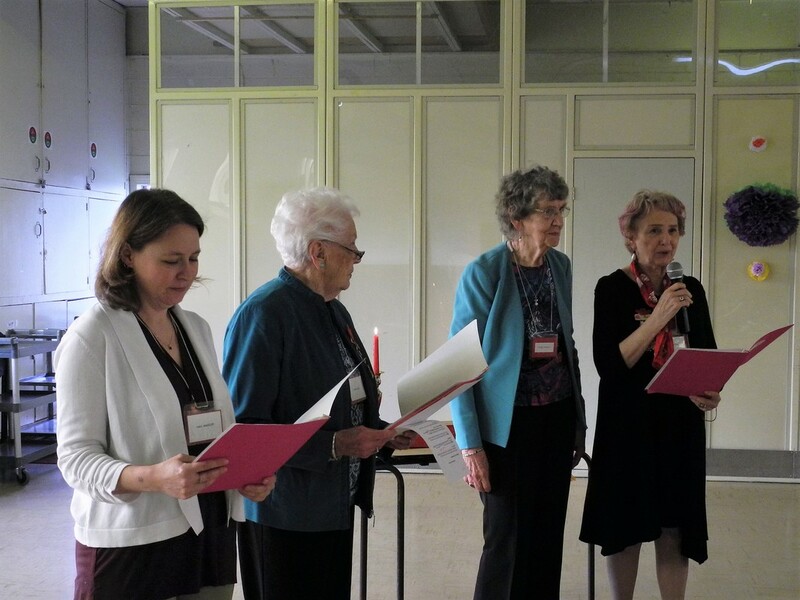 ​It was also a very heart-warming day, as we initiated four new members: Betty and Mimose Constant, Nathalie Malhamé and Tracy Woodward. We also had a warm greeting from our good friend from Germany, Merika Heimbach, who brought us good wishes and a candle of friendship. 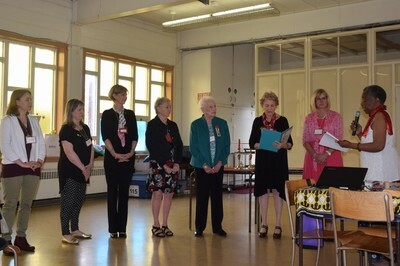 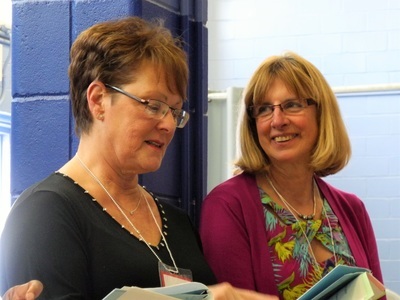 Merika's good friend, Anne Bailey from Plattsburg, N.Y. was also in attendance with promises to keep a closer cross-border relationship with DKG Quebec. 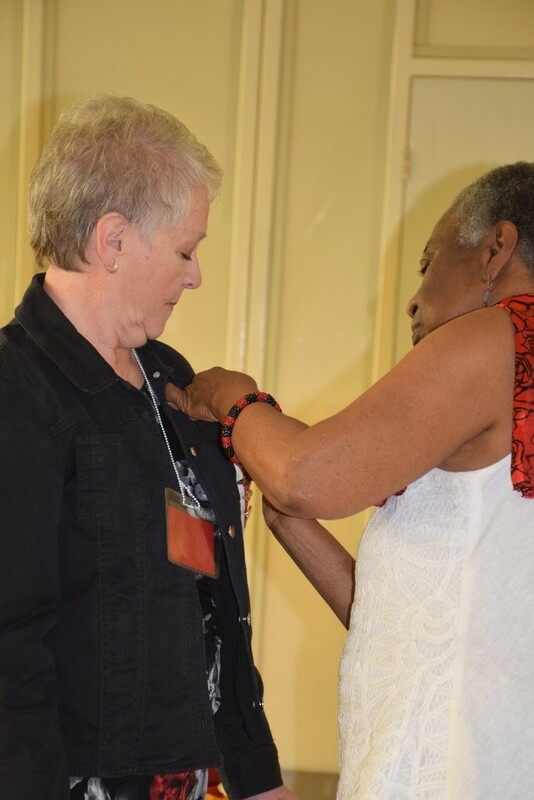 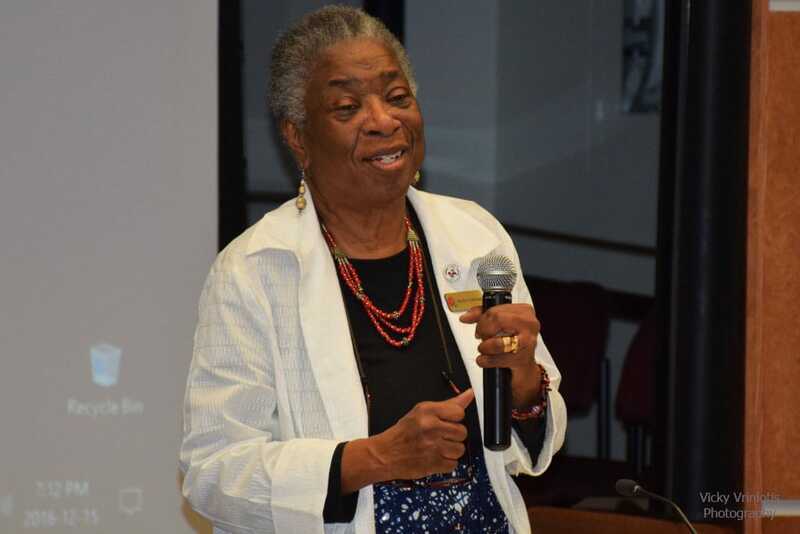 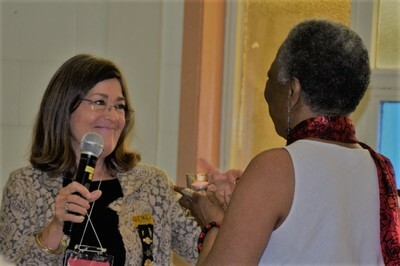 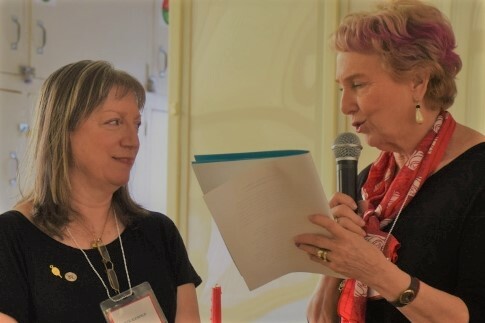 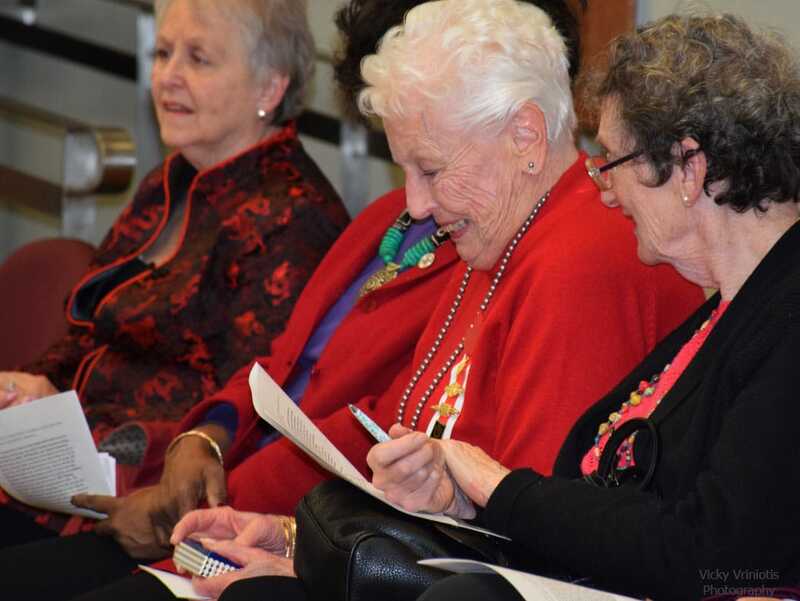 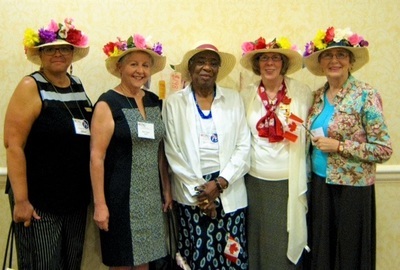 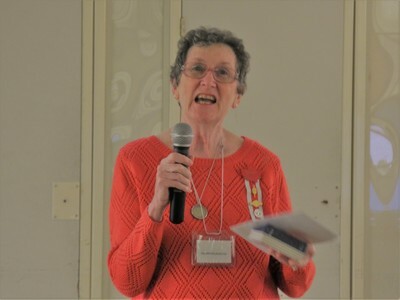 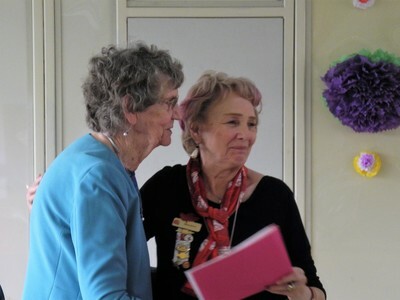 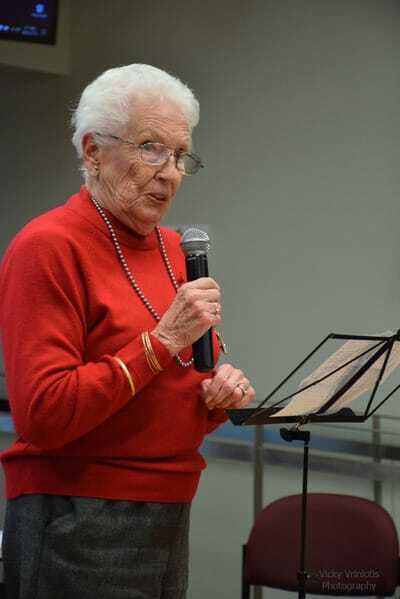 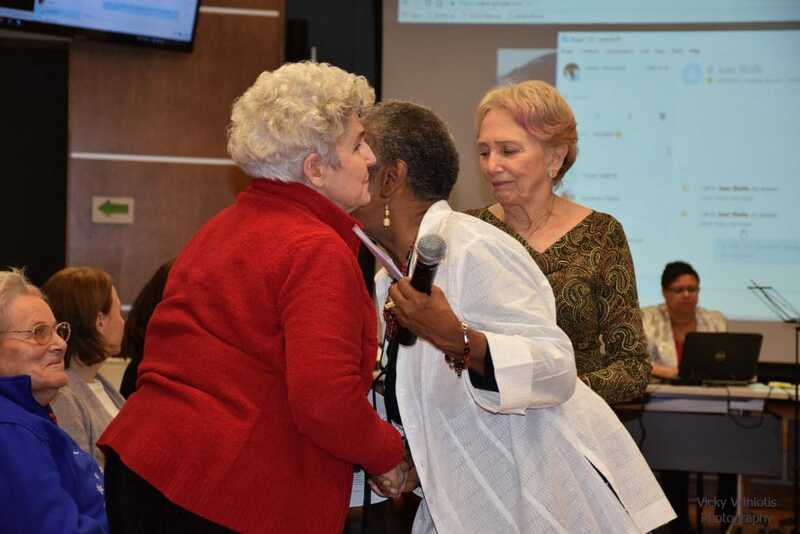 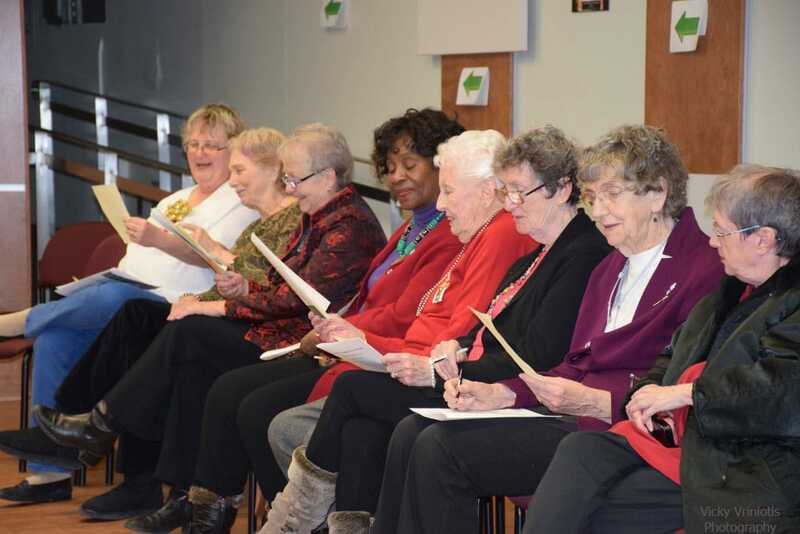 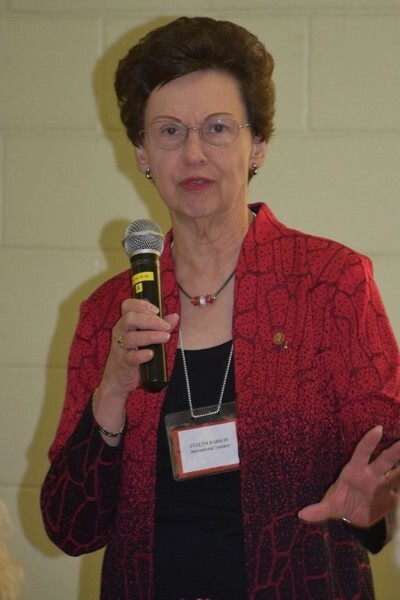 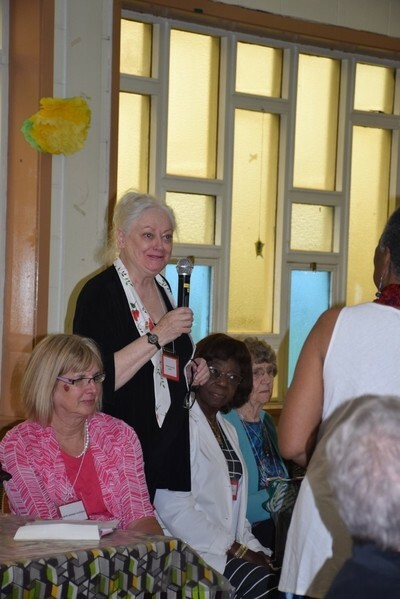 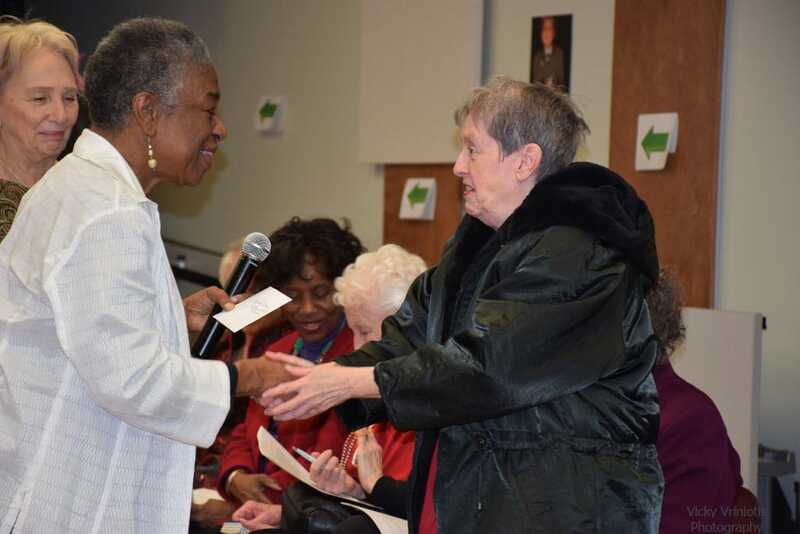 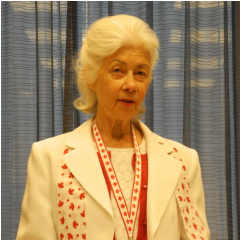 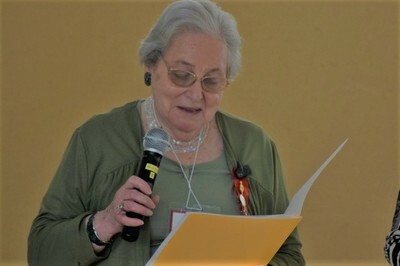 ​Evelyn Barron, former International DKG President (2000-2002), brought us tidings from DKG International in Austin, Texas, and congratulations on our 60th anniversary. 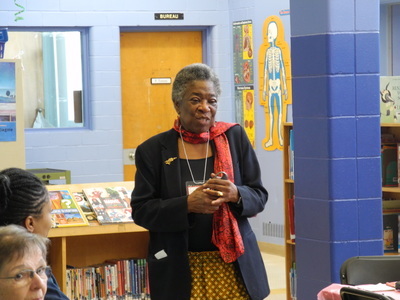 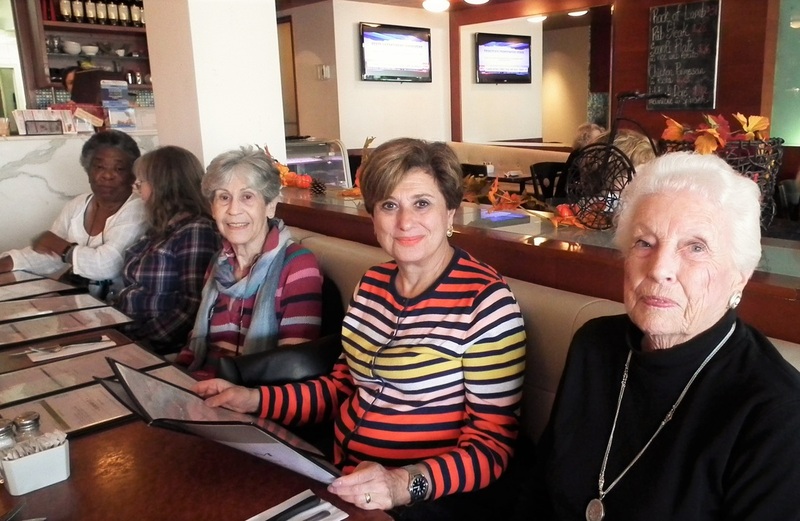 ​We had a number of good friends join us including Elena Mirga, former President (1999-2001) and members of the staff from Coronation School, and other institutions, including Sir Wilfred Laurier School Board and McGill University (see photos below for details). ​Vicky Vriniotis and I did our best to capture the day in photos. We hope you enjoy! 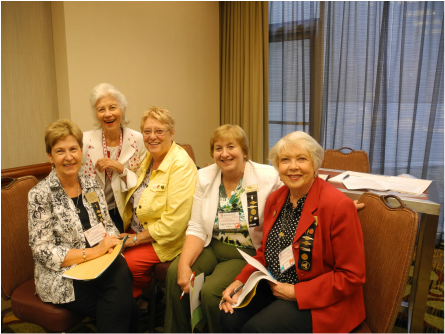 It looks like all play, but the PDC, made up of veteran members and new members, is a dynamic, industrious group, working toward bringing fresh ideas to market the DKG brand to attract educational professionals at all levels, while maintaining our traditions. 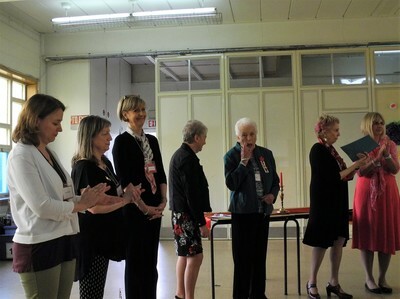 Any member of DKG Quebec, with or without guests, is welcome to join us at our next meeting in September. Details to follow.